After being approached by Maha Home to create a cake using the new Innovative Range by Mason Cash that they stock, I was beyond excited. I can remember every single adult female in our family owning the iconic, beige coloured, cane bowl by the same manufacturer. Yet with this new range I was in for a double treat (I’ll explain more later). 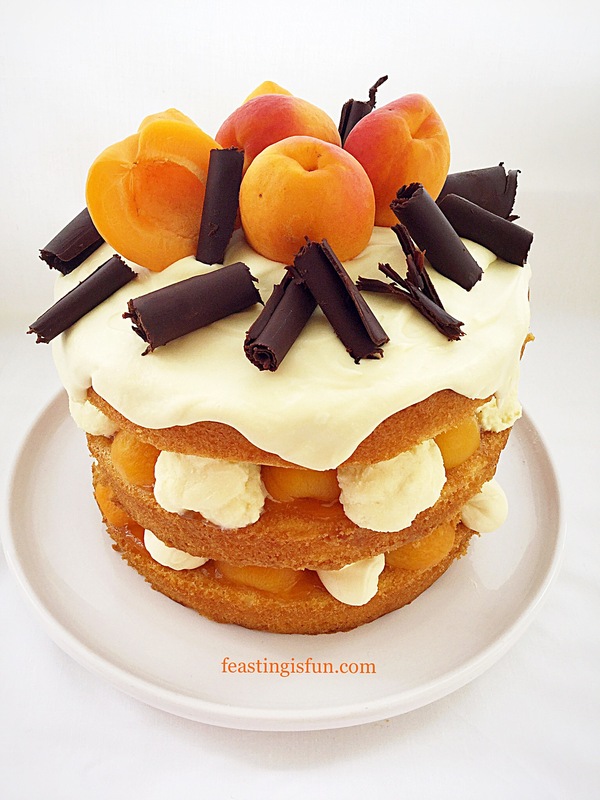 I chose to create this gluten free Apricot White Chocolate Triple Sponge Cake. As a result of my health issues, I rely heavily on the ability to order items online. Having had mixed results from the different companies I order from I have learned who I can trust to properly package and ship things within an acceptable time frame. With Maha Home I placed my order and it arrived the following day. 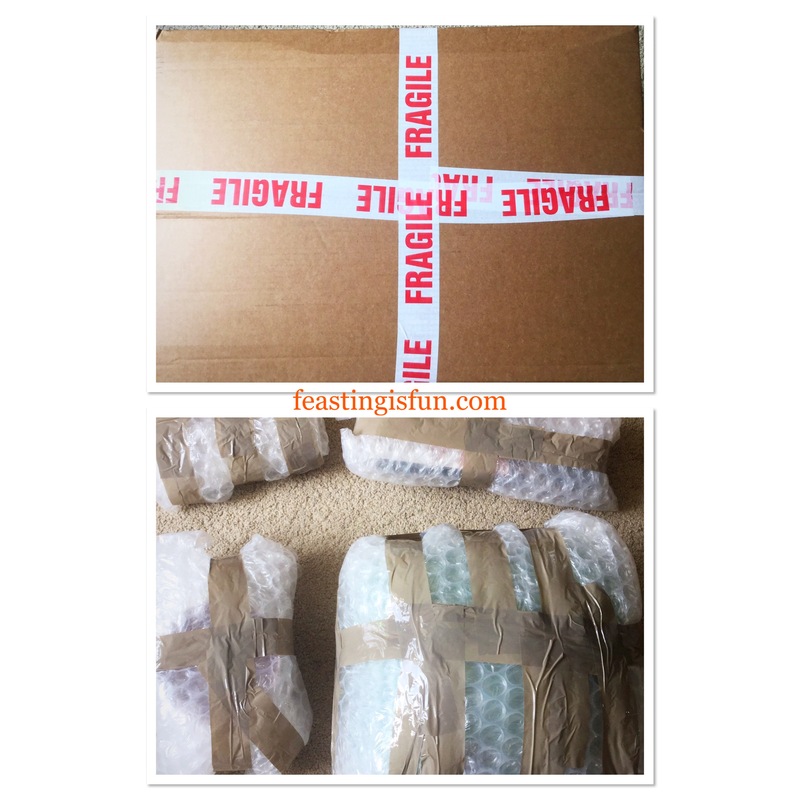 Every item was securely wrapped, without there being an excess of packaging. Most importantly every single item, when unwrapped, was in perfect condition. Because of the careful packaging, lowest price match promise and prompt delivery I would happily order from them in future. I will admit that it did take some time to complete the unwrapping! 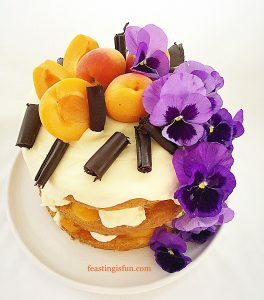 I tested and used all of the items except the reamer and jar scraper while making the Apricot White Chocolate Triple Sponge Cake. Note: please visit the Mason Cash website for specific care and use of items listed. I love the size of this bowl and it is beautiful to look at. It’s wide enough to get my hands in, for making bread, pastry and crumble. Using the tilt feature allows for thorough mixing. Also I would use this as a serving bowl, for example my Creamy Garlic Lemon Chicken Pasta Salad. While the bowl itself isn’t too heavy, once ingredients are added I would struggle to be able to lift this and mix in the crook of my arm. That said this bowl would make a perfect new home/wedding/birthday present for a newbie or keen baker. Possibly my favourite item! Although this may seem odd, as someone who frequently uses an electric whisk that always drips on to the worktop having this spoon rest is an absolute joy. Large enough to rest both beaters from my whisk, or the large solid spoon and the balloon whisk from the range, this has saved me a substantial amount of clean-up time. Absolutely the cutest item in the range. A really useful size jug with accurate measurements inside. 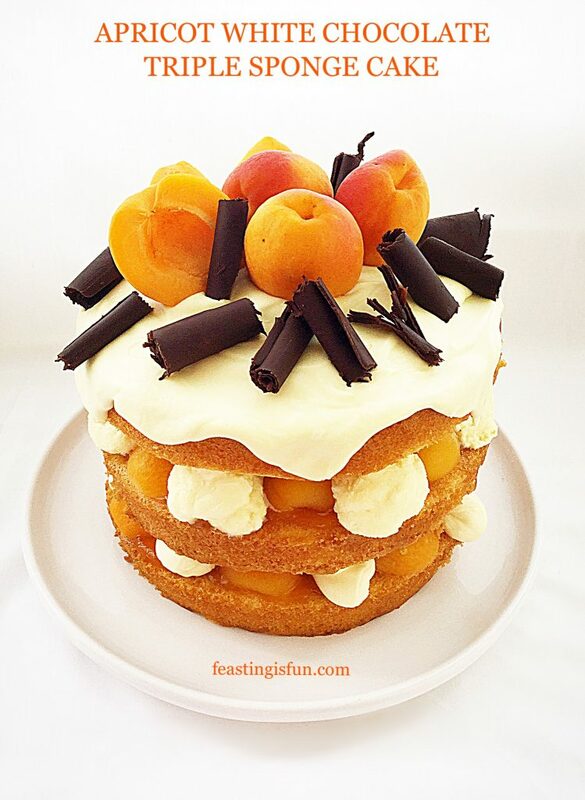 For that reason it was particularly useful when creating the Apricot White Chocolate Triple Sponge Cake. Especially easy to use in the microwave and the colours match my kitchen perfectly. Such a comfortable balloon whisk to hold and use. I wasn’t sure at first how useful the reamer would be, however after making a batch of Homemade Chelsea Buns, with a lemon drizzle I found myself happily using both the reamer and whisk. Brilliant invention. Fantastic large spatula at one end with a smaller spatula at the other end. Any worries I had about how comfortable it would be to hold were immediately dispelled on first use. Two for one usage, saving utensil room in the kitchen. A strong solid spoon that is comfortable to hold and use. I see a wooden spoon as one of THE most essential items in any kitchen, this spoon fits the bill and some! No longer do I have to sniff my range of wooden spoons when baking, to check for lingering curry/garlic smells. I now have a dedicated wooden spoon for baking, that also has a very handy jar scraper at the other end. Especially useful for honey and marmite, both particularly sticky and reluctant to leave the inside of a jar. Again double usage from one utensil. Note – you will need 3 x 20cm/8in round sandwich tins for this recipe. If, like me however, you only have 2, simply follow the first set of quantities given in the recipe. 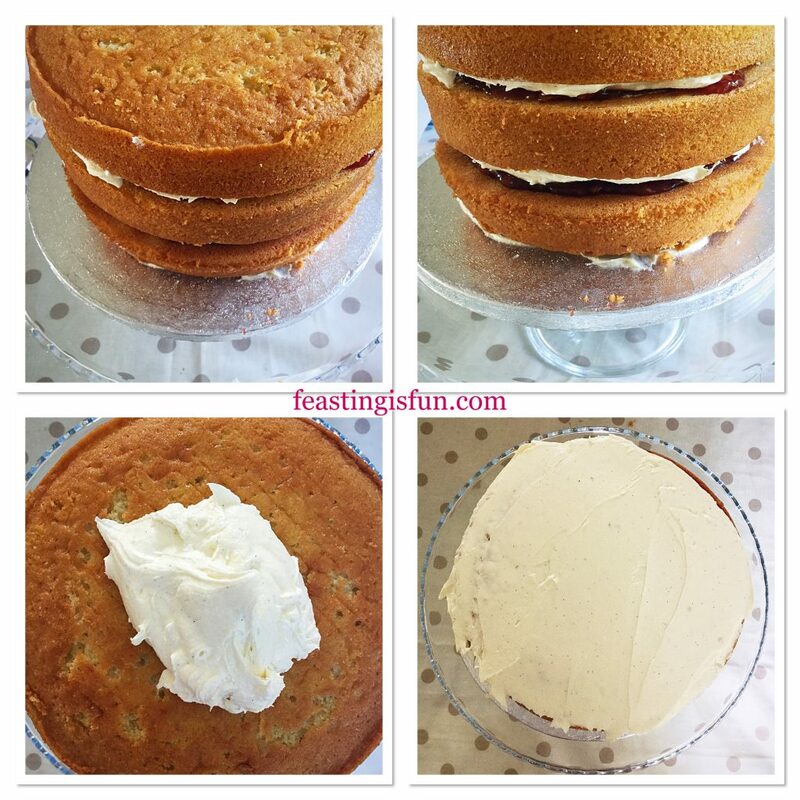 Make 2 cake sponges using the first quantity given in the recipe and bake. Once the cakes are turned out, wash up one sandwich tin and proceed to make the third cake using the second quantity given in the recipe. 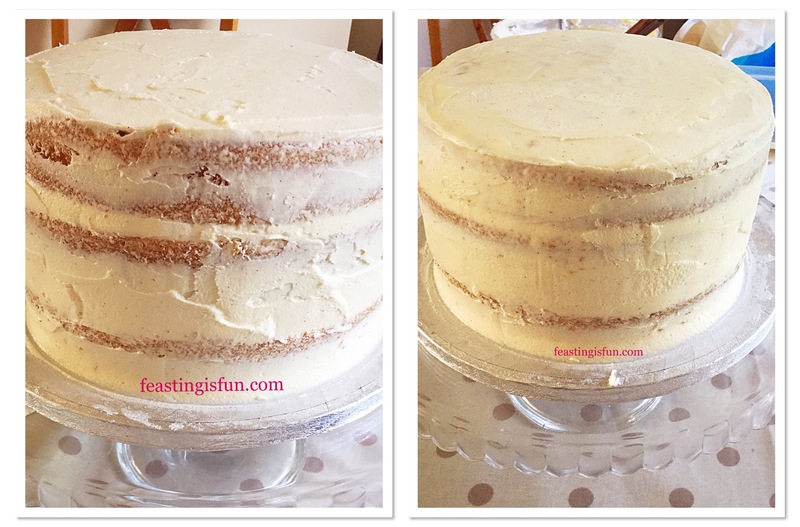 Alternatively if you have 3 cake tins make the cake batter using the full quality given (shown in brackets in bold), dividing the mixture equally between the three sandwich tins. First of all grease with butter and line the sandwich tins with baking parchment. Next crack the eggs into the jug and whisk to combine. Add the butter, sugar and salt to the large bowl and whisk together until pale and creamy. Pour the eggs into the large bowl and add the vanilla extract. Beating the cream and sugar, whisking the eggs. Sieve the flour and baking powder into the bowl. Using a large wooden spoon mix the ingredients together until just combined. 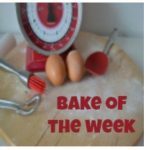 Over mixing when using wheat flour can lead to a heavy cake. Divide the cake batter evenly between the sandwich tins, using the spatula to scrape the bowl clean. Ensuring nothing is wasted. Smooth the top of the cakes with the spatula. Adding the dry ingredients, mixing and filling the cake tins. 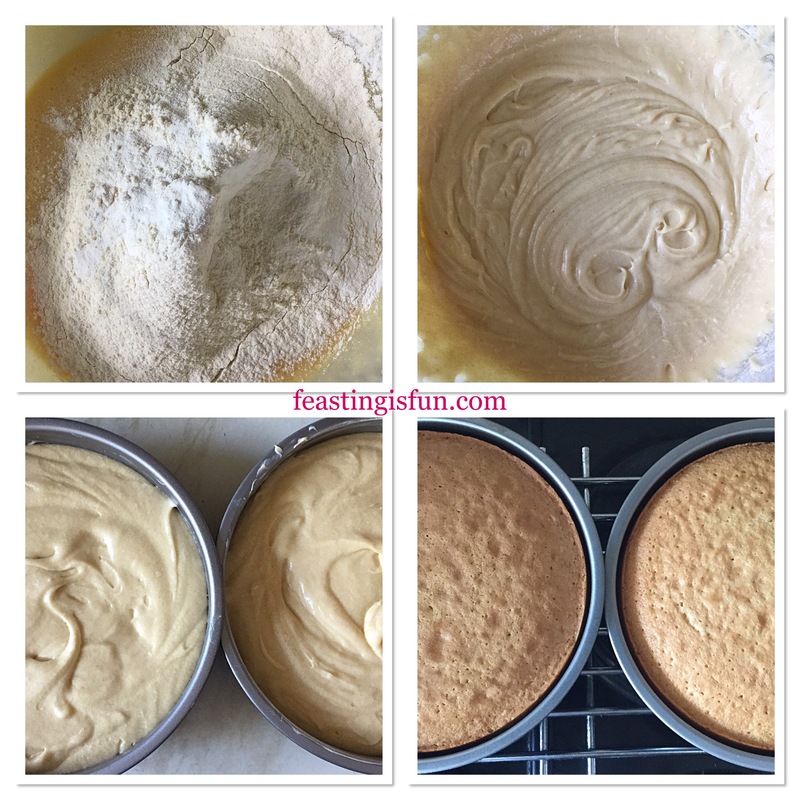 Place the cake tins into the centre and lower part of the preheated oven. Bake the cakes for 25-30 minutes. The cakes are baked when golden and they spring back from a light touch in the centre. As soon as the cakes are baked remove from the oven. Allow the cakes to cool in the tins for 15 minutes and then turn out on to a cooling rack. Proceed with making the third sponge as per the note above. 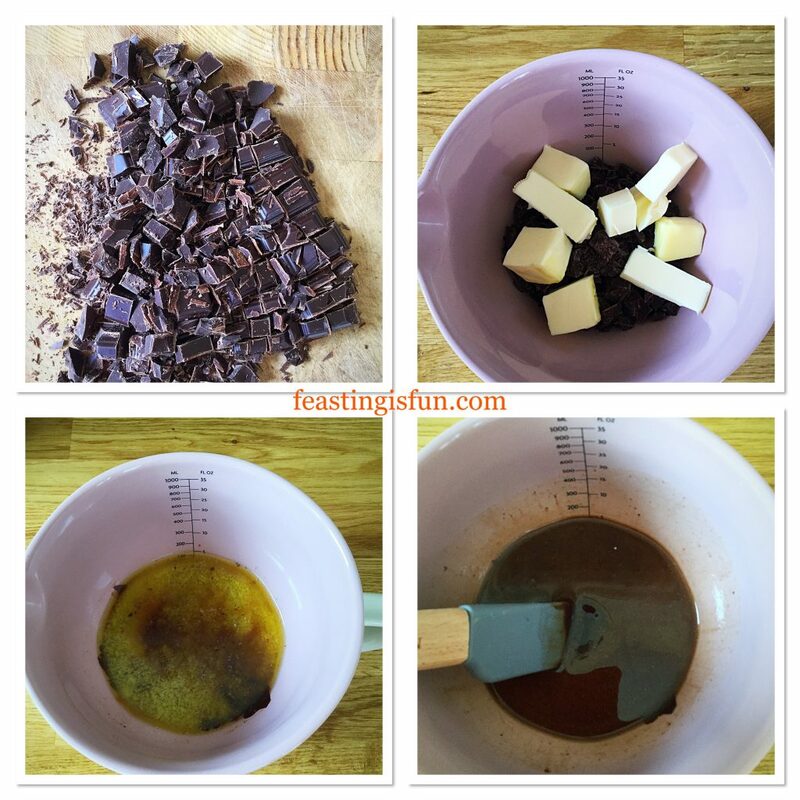 Chop the dark chocolate into small chunks. Place the chocolate into the jug and add the butter. Using a microwave heat the chocolate/butter for 30 seconds on medium power. Repeat until both chocolate and butter are melted. Stir using the small spatula until the ingredients are combined and glossy. Pour the dark chocolate ganache into a baking tray approximately 38cm x 25cm x 3cm (15in x 10in x 1in). Tilt the tray so that it is evenly covered with ganache. Refrigerate the tray for 1 hour to set the ganache. To make the curls, push a straight edged implement (I have used a small metal cake server, a dough cutter or something similar would also work well) into the ganache. The chocolate will form curls. Place each curl on to a cold plate. Repeat until all of the chocolate has been used. During hot weather it maybe necessary to chill the chocolate ganache in between making curls. Once made, place the plate of chocolate curls into the fridge until needed. Note, the dark chocolate curls can be made the day before, Store in an airtight container in the fridge. Measure out the cream into the jug. Heat in the microwave on medium for 30 second bursts until the cream is hot – not boiling. 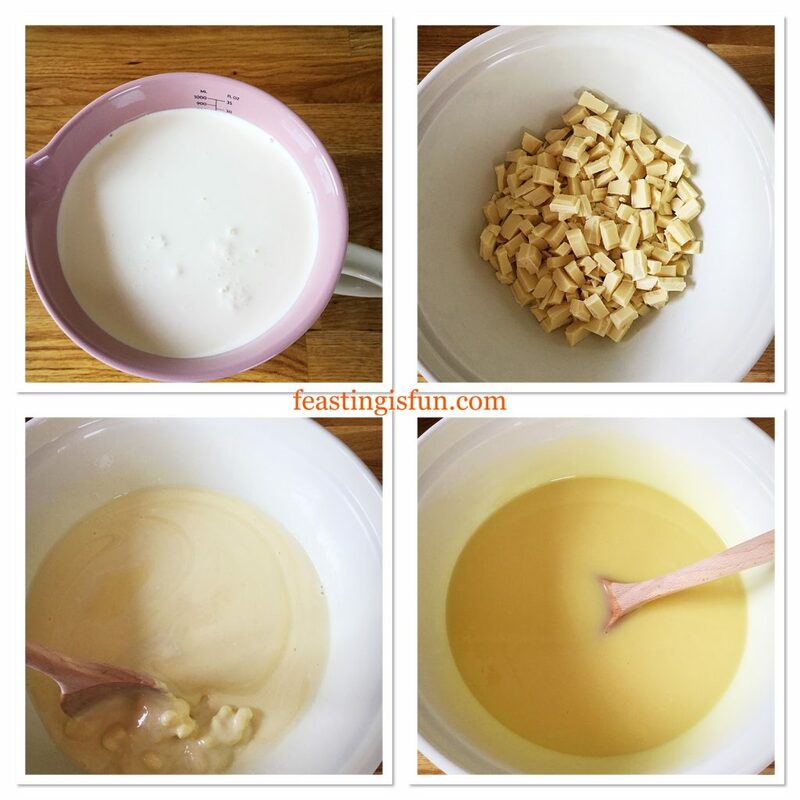 While the cream is heating chop the white chocolate into small chunks and place into the large bowl. Pour the hot cream over the white chocolate chunks. Stir continuously with the spoon until all of the chocolate is melted and combined with the cream. The mixture should look glossy. Pour 300ml of the liquid white chocolate ganache into the jug. Place the large bowl of ganache into the fridge to cool. Meanwhile, using the whisk, whip the white chocolate ganache in the jug until it just holds it’s shape (see bottom left photo below). 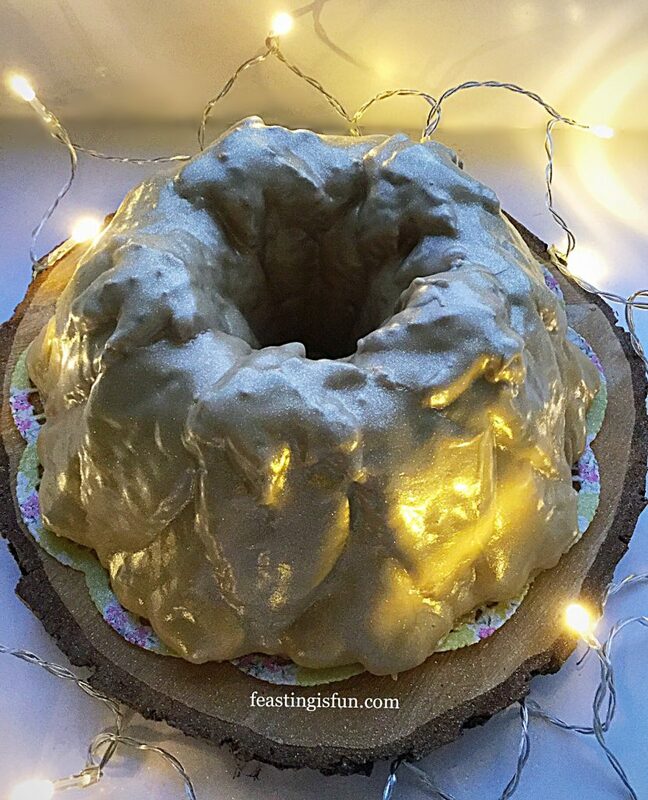 Place a cake sponge, flat side down, on to some foil on a plate. Spoon the soft, yet floppy ganache on to the sponge. 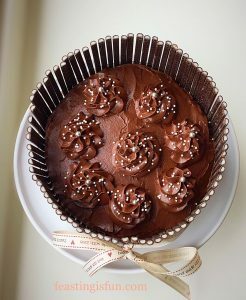 Spread the ganache with the small spatula to cover the sponge allowing it to naturally drape around the sides. Place the sponge into the fridge to set. First of all, drain both cans of apricot halves into a sieve. 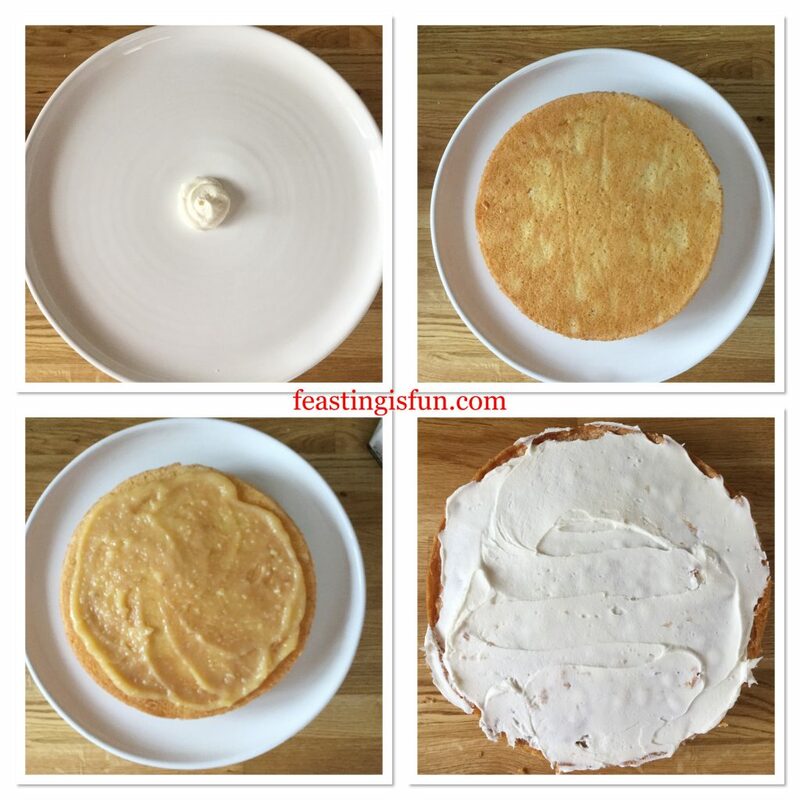 Place the remaining 2 cake sponges, flat side up, on separate plates. 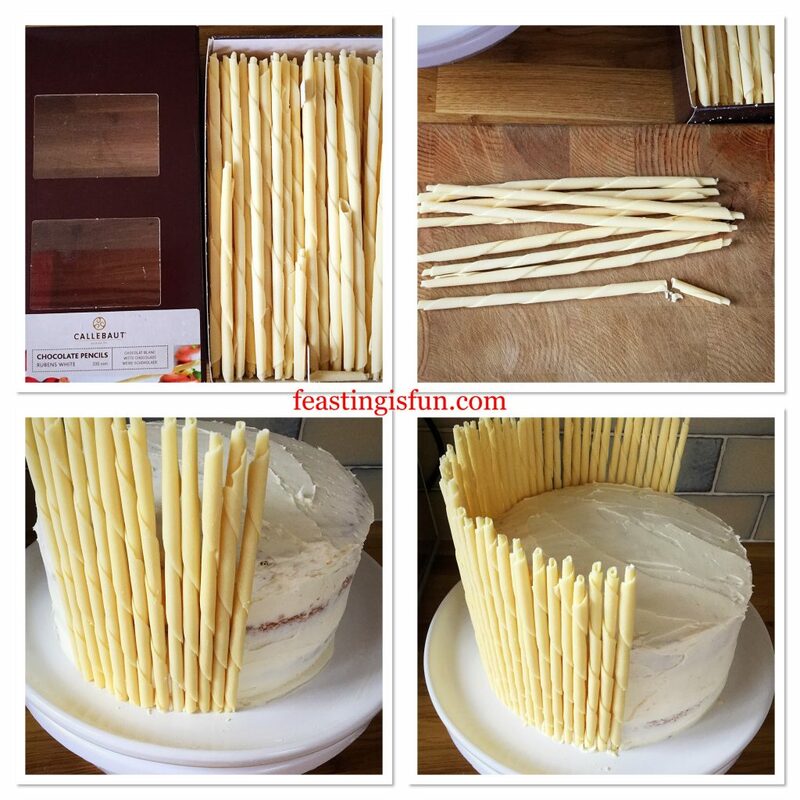 Make sure the sponge that will be the bottom layer of the cake is on a serving plate or board. Spoon 3 tablespoons of apricot jam on to each sponge and spread to the edges using the small spatula. 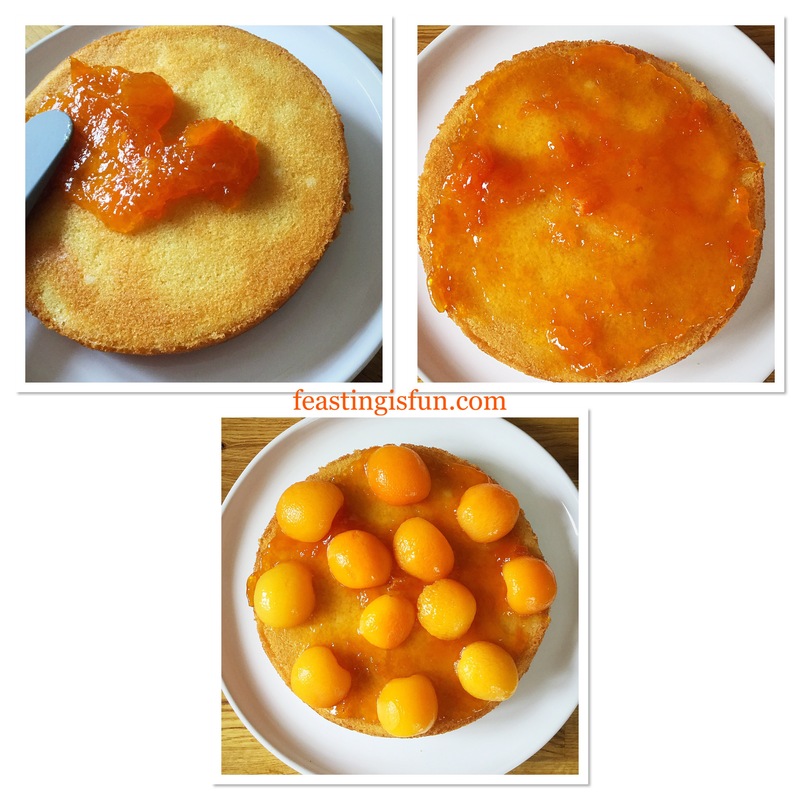 Place 8 apricot halves evenly around the outside of each sponge and 4 in the centre. Remove the cooled ganache from the fridge and whisk until it firmly holds its shape. 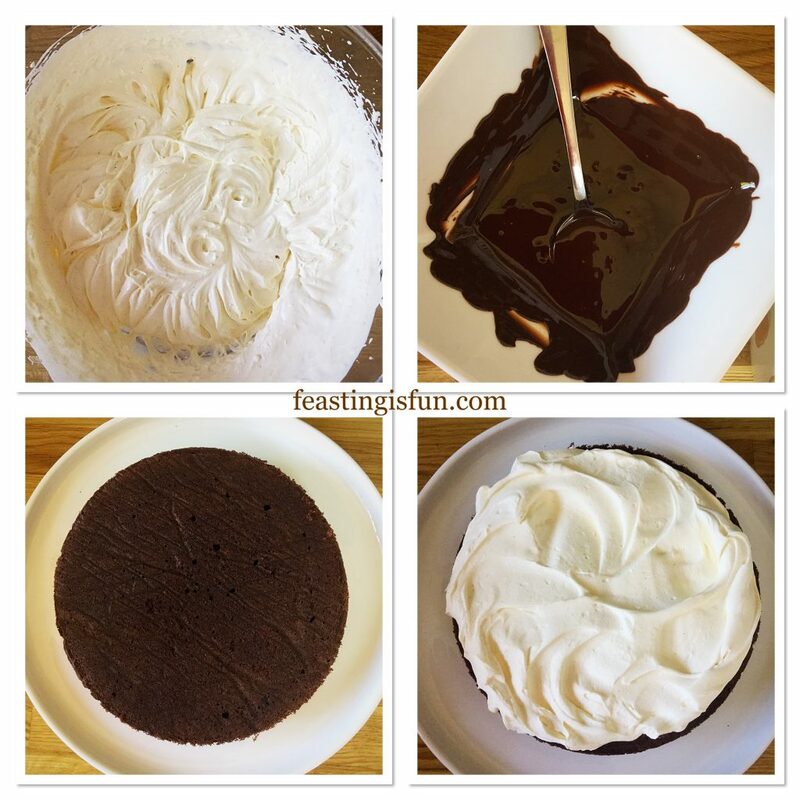 Fill a large piping bag with the ganache. Cut the end of the piping bag off to leave a 1cm opening. Applying even pressure pipe swirls of ganache between the apricots on the edge of the cake working in towards the centre, until there aren’t any gaps left. Repeat for the second sponge. Place both sponges into the fridge and leave to set for 30 minutes. Once the ganache has set it is time to assemble your cake. Place the second layer centrally on top of the bottom layer. Finally, place the ganache covered sponge on top. 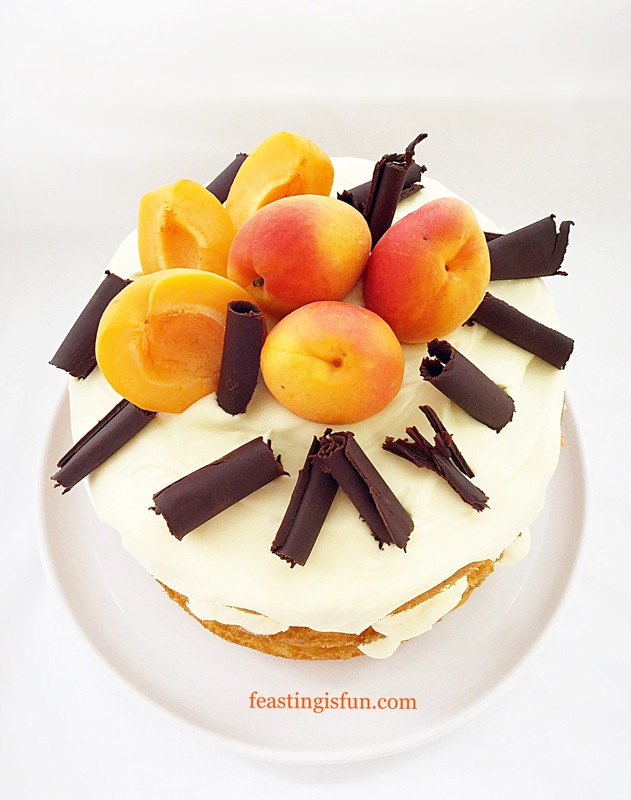 Arrange the fresh (or canned) apricots on top of the cake and add the dark chocolate curls. Refrigerate the cake for a further 30 minutes, or until time to serve. 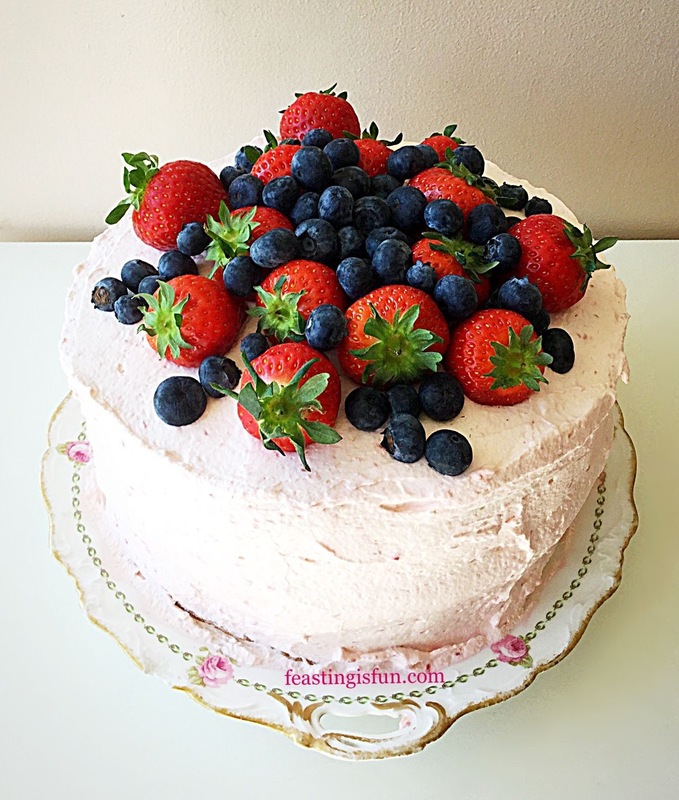 Remove the cake from the fridge 10 minutes prior to serving. Doing so allows for easier slicing. I made the gluten free sponges the day before assembling the cake. They were stored in an airtight cake tin separated by sheets of baking parchment. While making this Apricot White Chocolate Triple Sponge Cake I had great fun testing out the Mason Cash Innovative Kitchen items sent to me by Maha Home. As well as creating a feast, fun has to be at the heart of what I do. Likewise, by testing new kitchenware I learn what works and what doesn’t. As a result I can offer an unbiased opinion to you my readers. Your trust in me is central to any review I undertake. Resulting in a review that is open and honest. 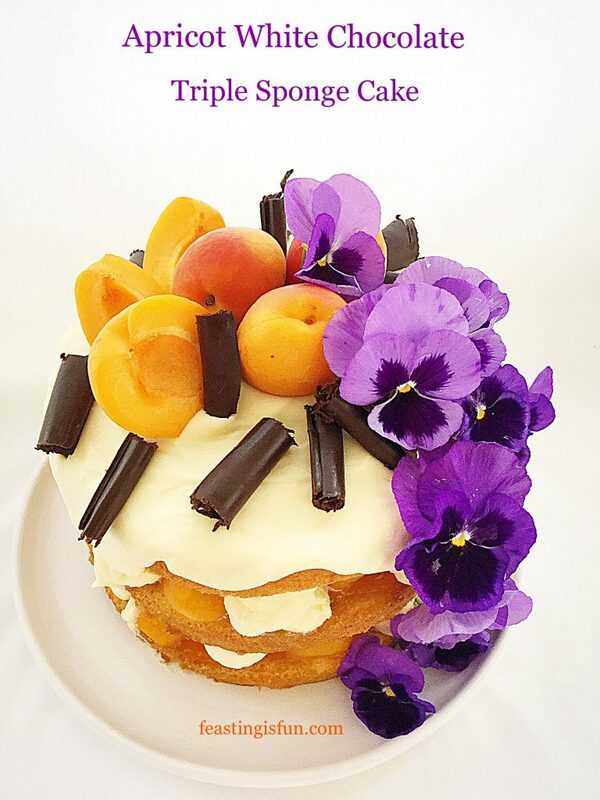 In the photograph above I added edible Pansies to create a pop of colour. 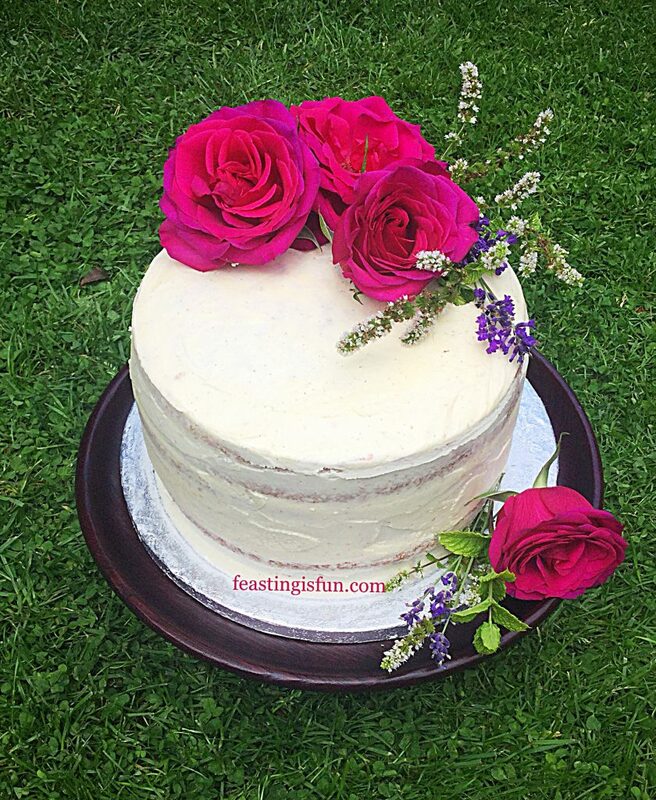 When using flowers to decorate a cake, ensure they are edible and free from any chemicals. Maha Home have given readers of my blog a 5% discount on all Mason Cash Innovative Kitchen items. Please insert the code INNOVATIVEFEASTING5. This offer is valid until 30th September 2018. NOTE: This offer has now ended. 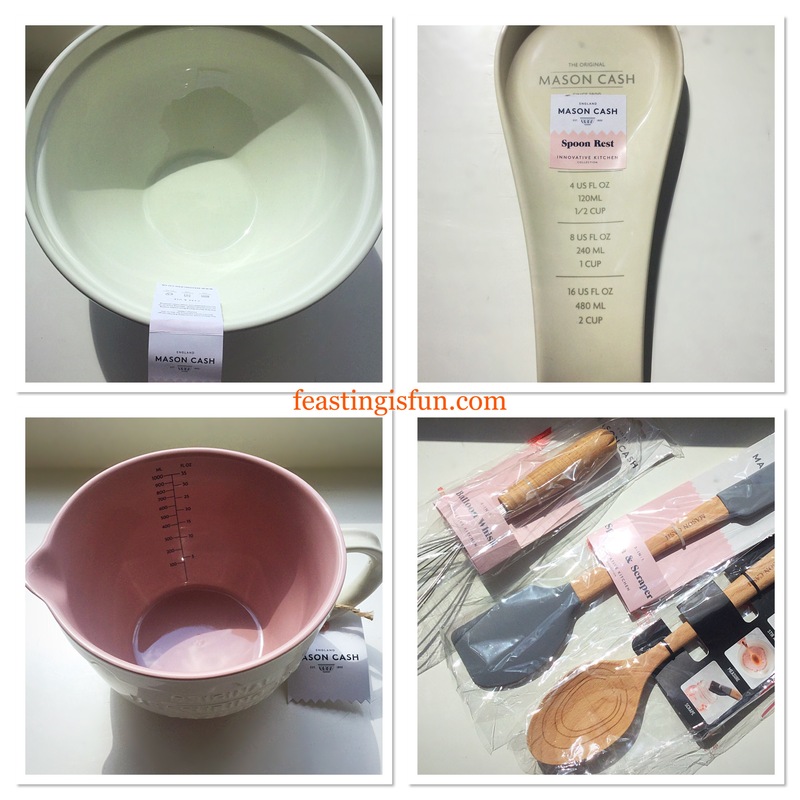 Maha Home sent me the Innovative Kitchen items by Mason Cash for the purpose of reviewing. Please visit their website for lowest price match promise and discount code T’s & C’s. All opinions, views and content are my own. I was not paid to carry out this review. No part of this post may be reproduced or duplicated without the written permission of the owner. Please see my Disclosure Policy. 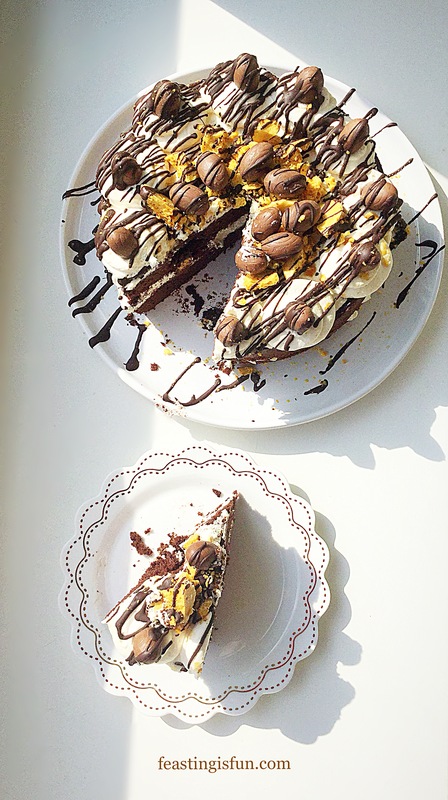 In my last post Chocolate Honeycomb Sponge Cake, I confessed my love for cream cakes. So, I decided to make another one! 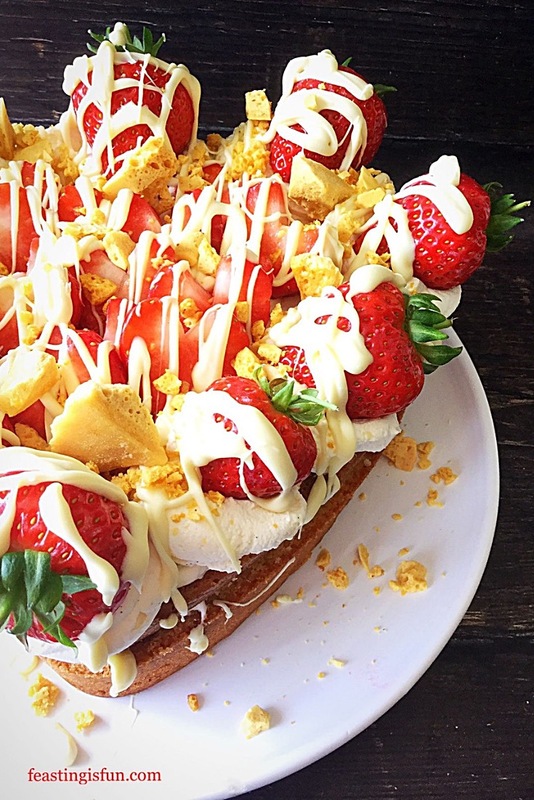 A delicious White Chocolate Drizzle Strawberry Cream Cake. 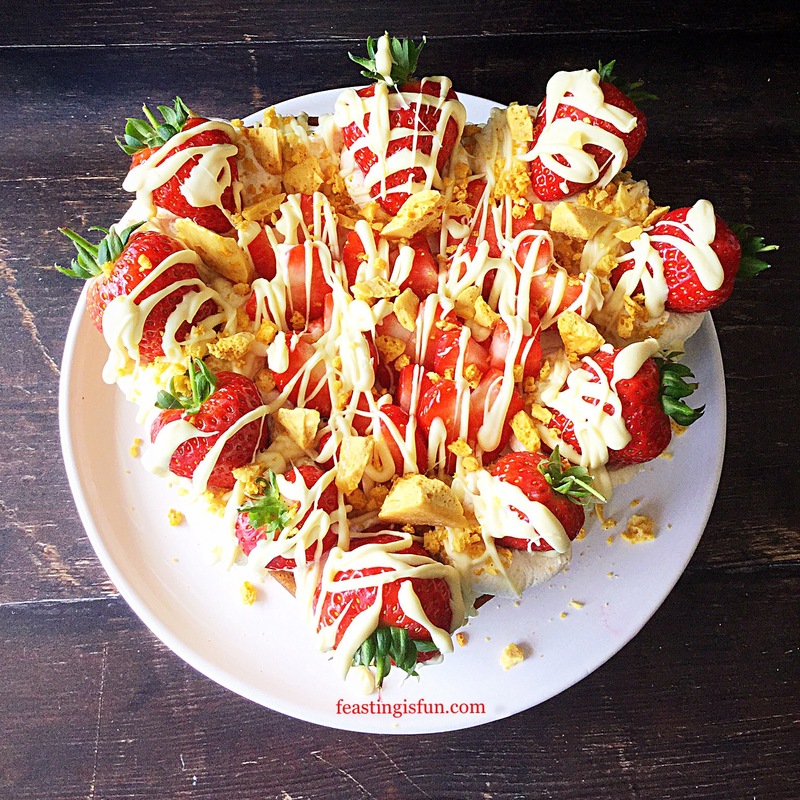 Golden sponge sandwiched together with cream and strawberry daiquiri jam, topped with more cream, fresh strawberries a white chocolate drizzle and finally a sprinkling of honeycomb. 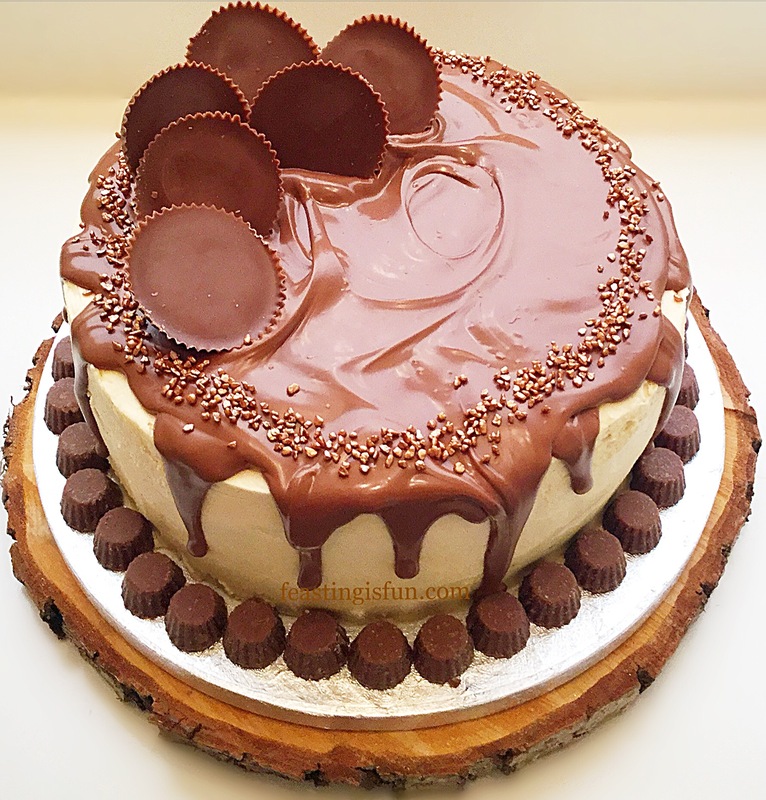 One bite of this cake and you too will be smitten. Since the very earliest of our Kent strawberries are becoming available I simply couldn’t resist buying some. 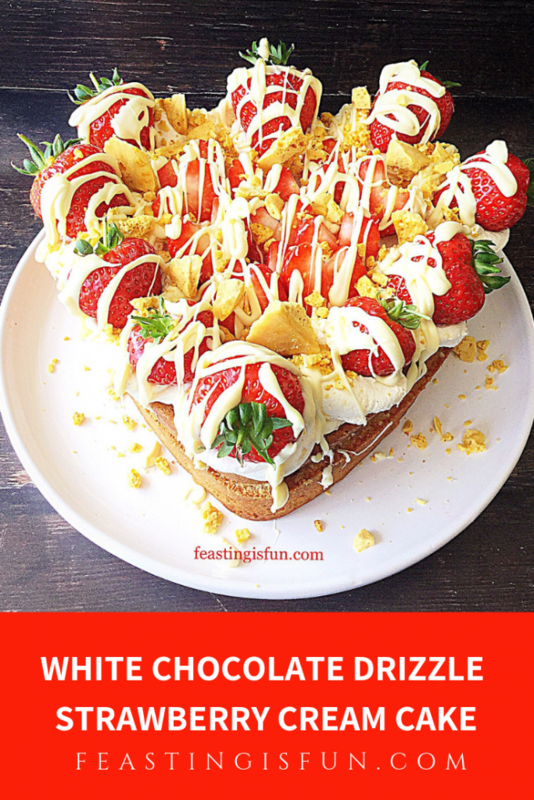 Together with fresh cream they make the perfect combination. However, when used to decorate this cake, with white chocolate and crushed honeycomb, these strawberries are elevated to true celebration feasting status. And the first strawberries of the season should, most definitely, be celebrated. 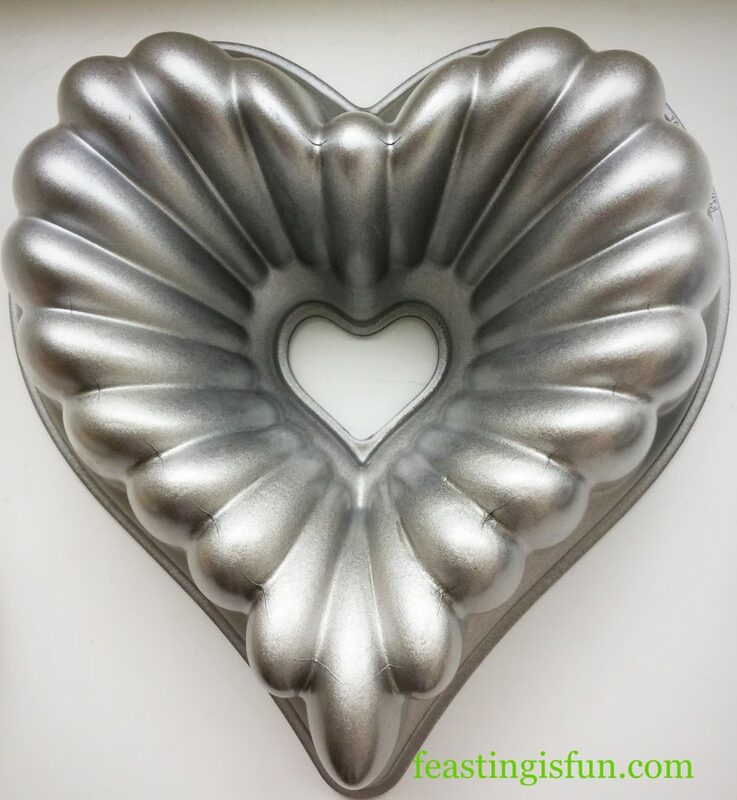 Using a heart shaped tin to bake this cake creates an elegant shape. Also it reflects the romantic side of my personality. If you do not have a heart cake tin then a round tin will be perfectly suitable. While removing the Strawberry husks I cut either side to create a ‘V’ shape. 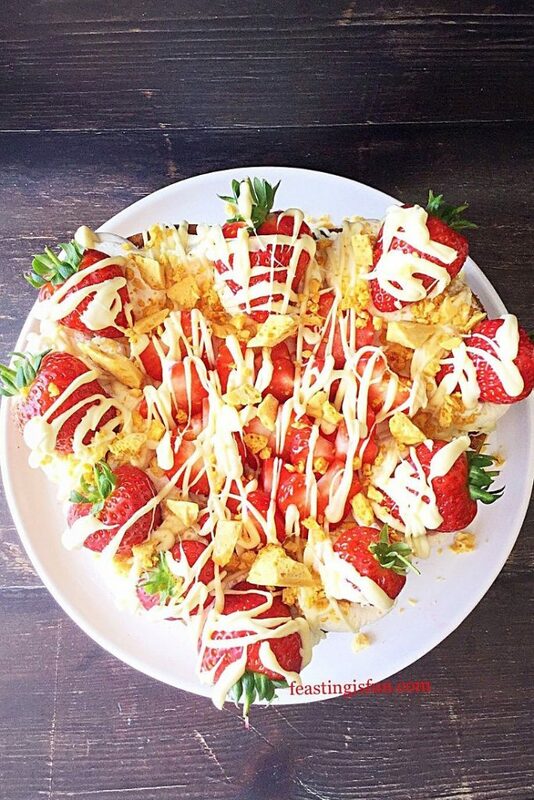 Resulting in sliced strawberries that look like love hearts. 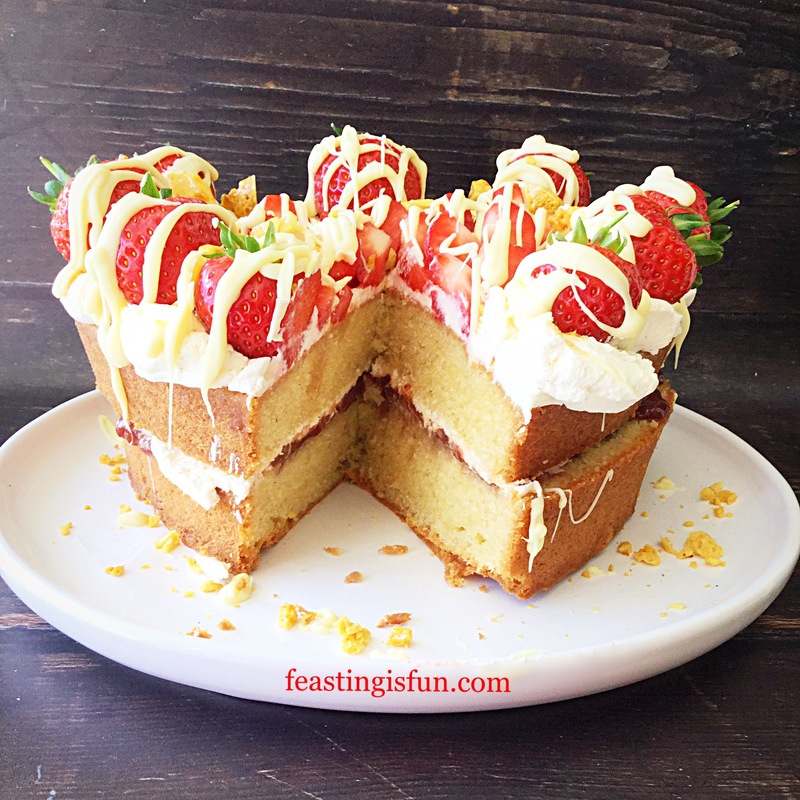 Finally, using a good quality strawberry jam really adds to the finished flavour of the cake. I used a strawberry daiquiri jam with its subtle hint of white rum and lime juice. It definitely adds to the luxurious finish of this cake. Alternatively mix in a couple of teaspoons of raspberry jam. Doing so will add a hint of tartness and elevate the flavour from good to great! Note – you will need a 22.5cm x 22.5cm/9” x 9” (approximately) heart tin that is at least 7.5cm/3” deep. I use a springform tin which allows for easy release of the cake. The tin I have is from Steamer Trading. Alternatively use a deep 22.5cm/9 inch round tin, or slightly shallower 20cm/8 inch round tin. First of all grease the tin with butter and line the base with baking parchment. Add the butter, sugar and salt to a large bowl. Whisk until pale and creamy. While whisking add the vanilla. Next add 2 eggs and one third of the flour. Whisk until just combined. 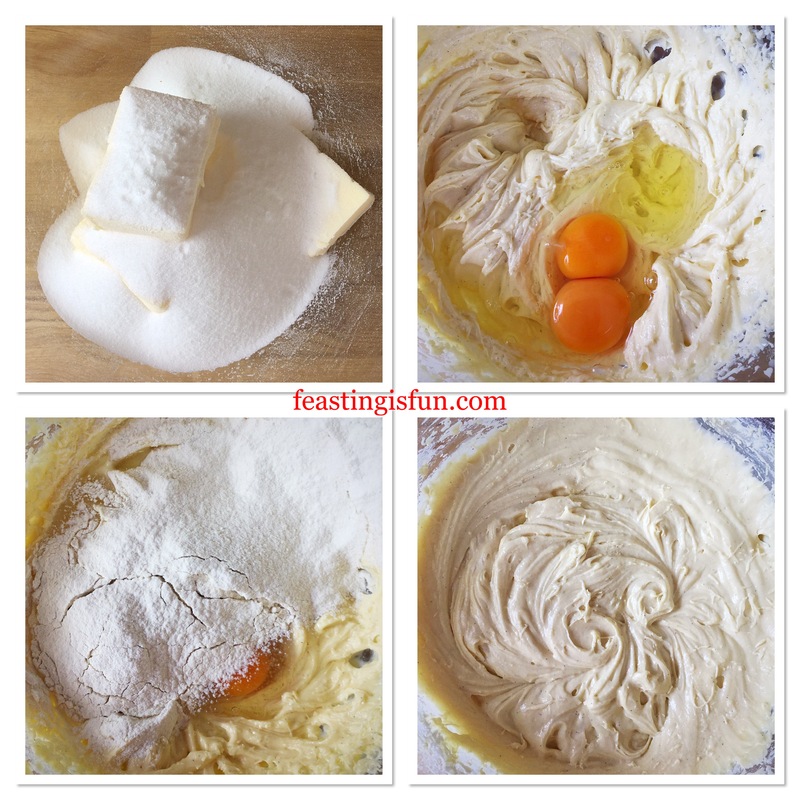 Add the last 2 eggs, the remaining flour and baking powder. 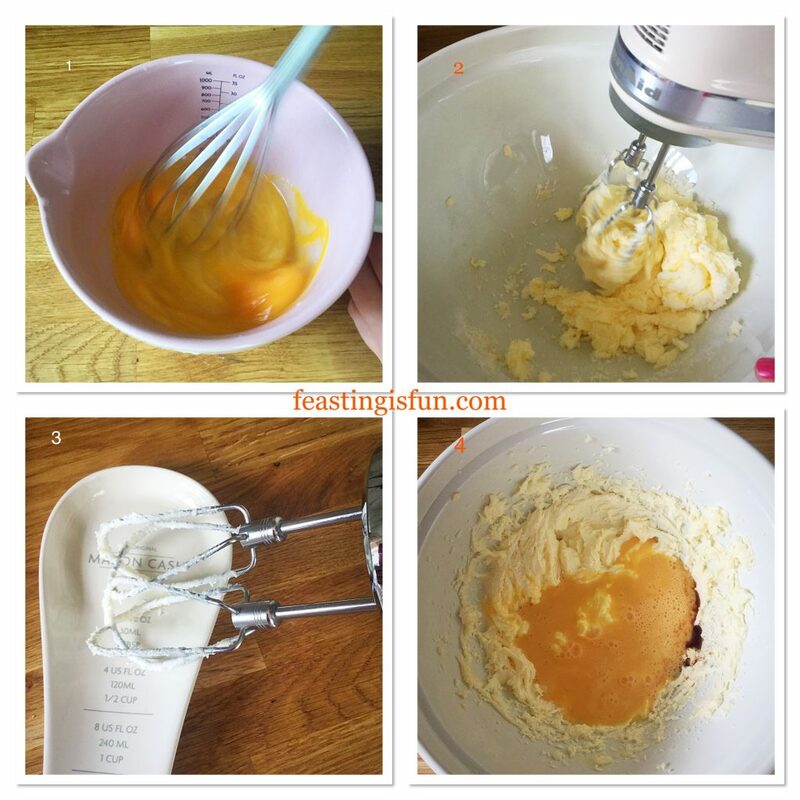 Whisk until fully combined, taking care not to over mix as this can cause the baked cake to become tough. Spoon the cake batter into the prepared tin. Smooth the surface of the batter. Place the cake tin into the centre of the oven and bake for 1 hour 20 minutes – 1 hour 40 minutes. My cake took exactly 1 hour 30 minutes, however as ovens differ start checking at the earlier time. The cake is baked when it is golden brown, springs back from a light touch and an inserted skewer comes out clean. 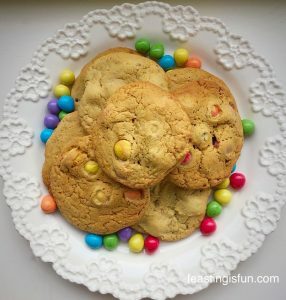 As soon as the cake is baked remove from the oven and place the tin on a cooling rack. 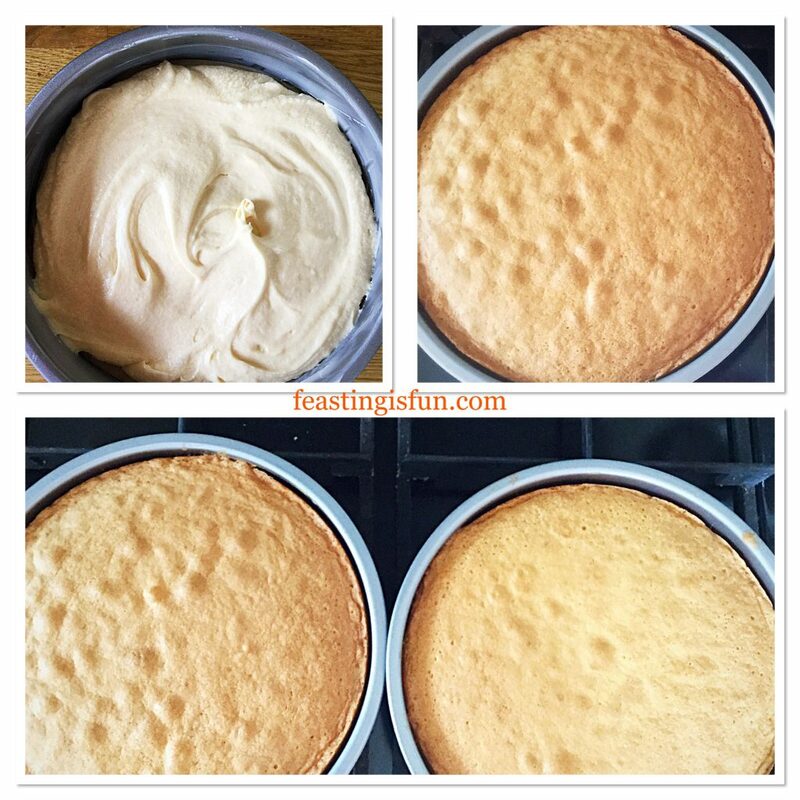 Allow the cake to fully cool in the tin. 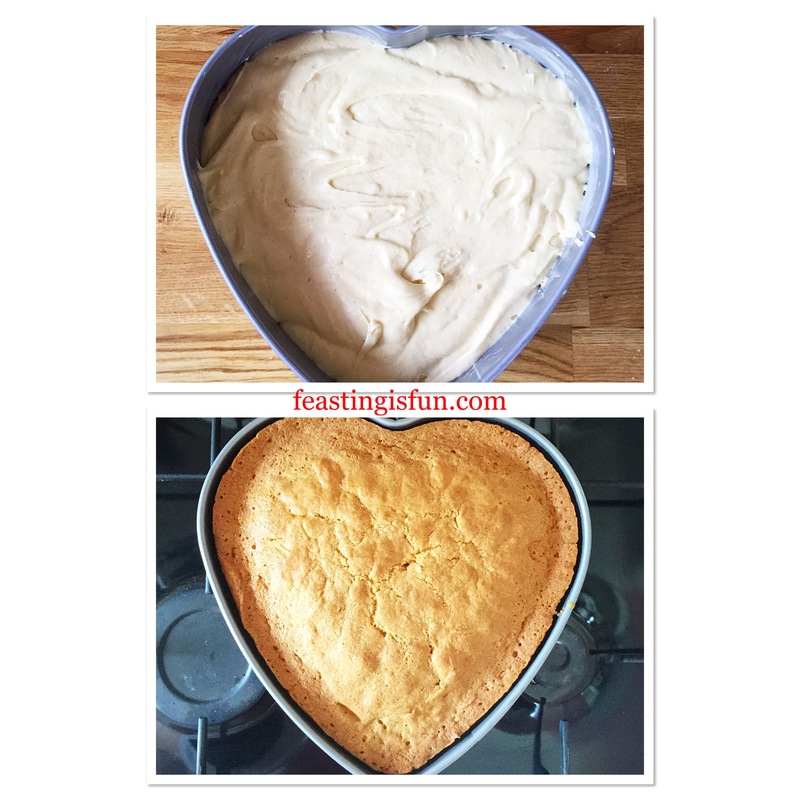 Filling a heart shaped cake tin and baking the cake. When the cake is fully cooled release from the tin. 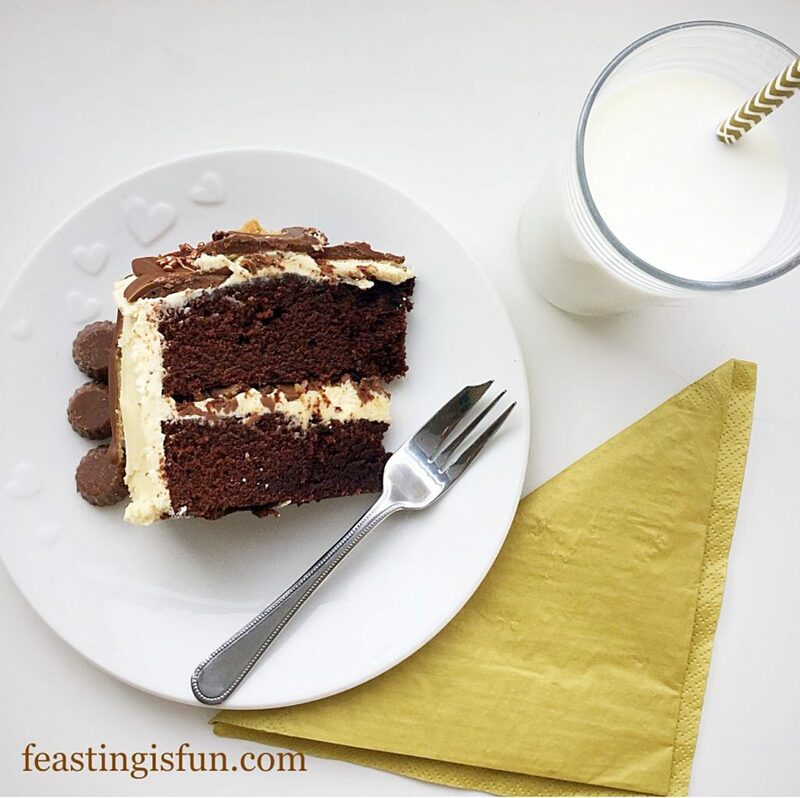 Use a long, serrated knife to cut through the middle of the cake, creating two layers. 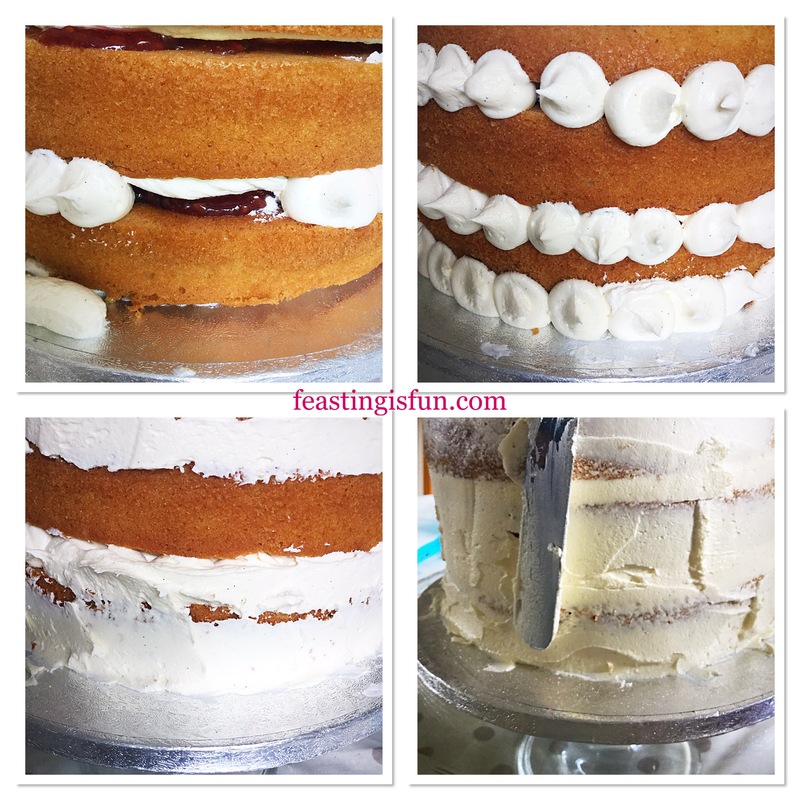 Place the top layer of the cake face down on to a plate or board. Spoon the jam on to the sponge and spread out so that it covers almost to the edges. Pour the cream and vanilla into a bowl and whisk until it just holds it’s shape. Spoon three large dollops of cream on top of the jam. Spread the cream out to cover the jam. 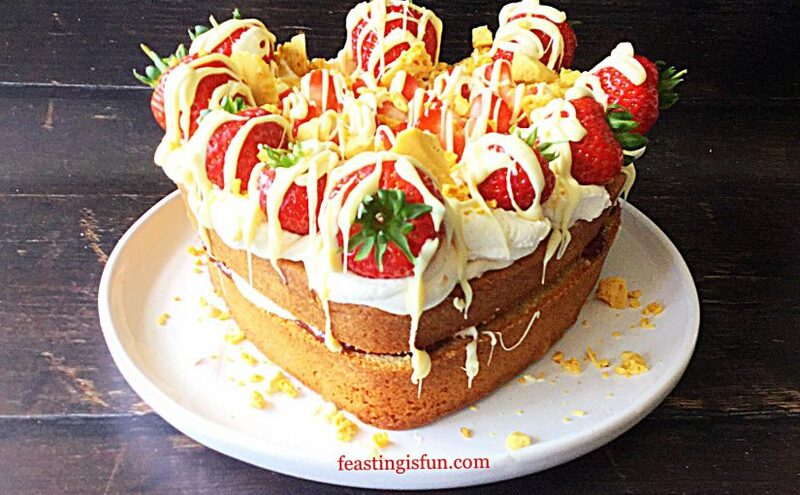 Place the bottom half of the cake, cut side down, on to the jam and cream covered sponge. Splitting in two and filling the cake. Fill a piping bag, without a piping tip fitted, with the remaining whipped cream. If using a disposable piping bag cut the tip off to leave a 1cm opening. Pipe approximately half of the cream on to the sponge. Spread the cream to cover using a palette knife. Pipe swirls around the outside edge of the cake. Top the whipped cream swirls with a fresh strawberry. Remove the green part (hull) of the remaining strawberries by cutting diagonally down either side creating a ‘V’ shape. 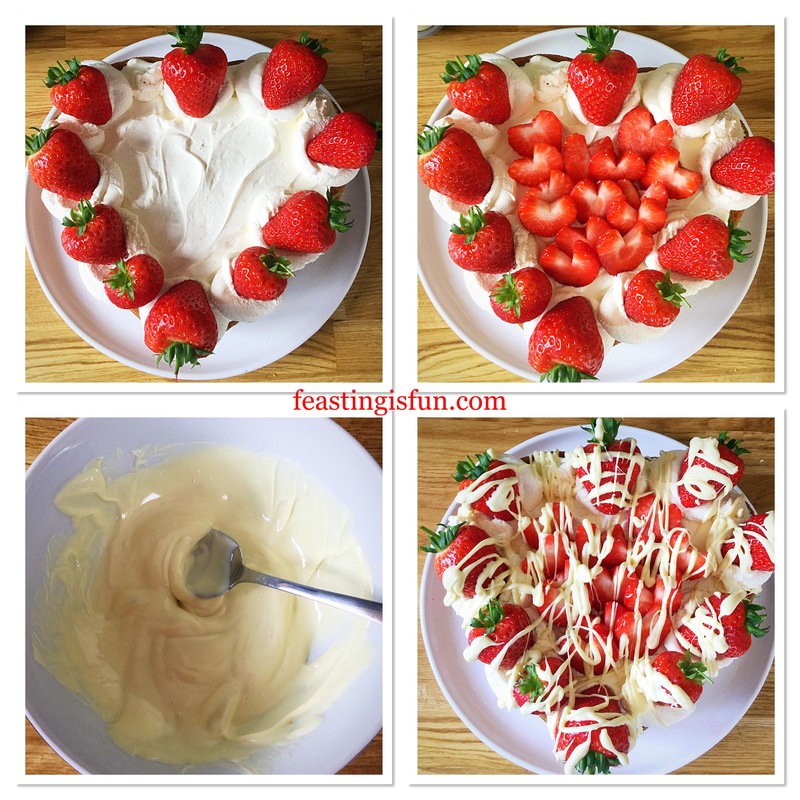 Slice each strawberry into 4-5 mini red hearts. 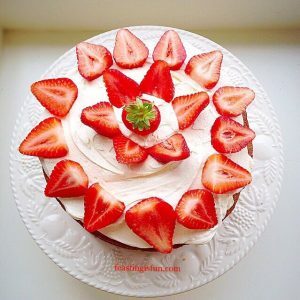 Place the strawberry hearts in the centre of the cake. Break/chop up the white chocolate and place in a heatproof, microwaveable bowl. Zap for 20 seconds at a time until the chocolate just starts to melt. Remove the bowl from the microwave and stir continuously until all of the chocolate has melted. Pour the melted white chocolate into a small, disposable, piping bag. Cut the very end of the tip off, leaving a small opening. 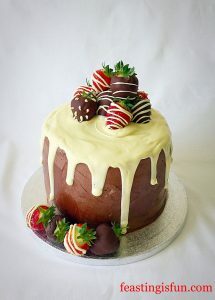 Pipe white chocolate over the strawberries and then over the entire cake, encouraging some chocolate to drip from the cake. Finally sprinkle over some broken up, golden honeycomb. 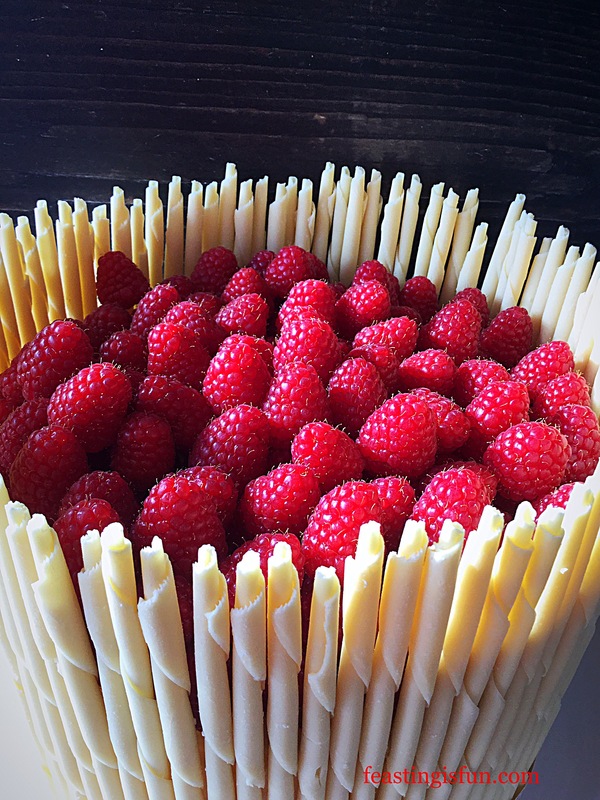 Refrigerate the cake for 30 minutes, or longer, until the white chocolate has set. 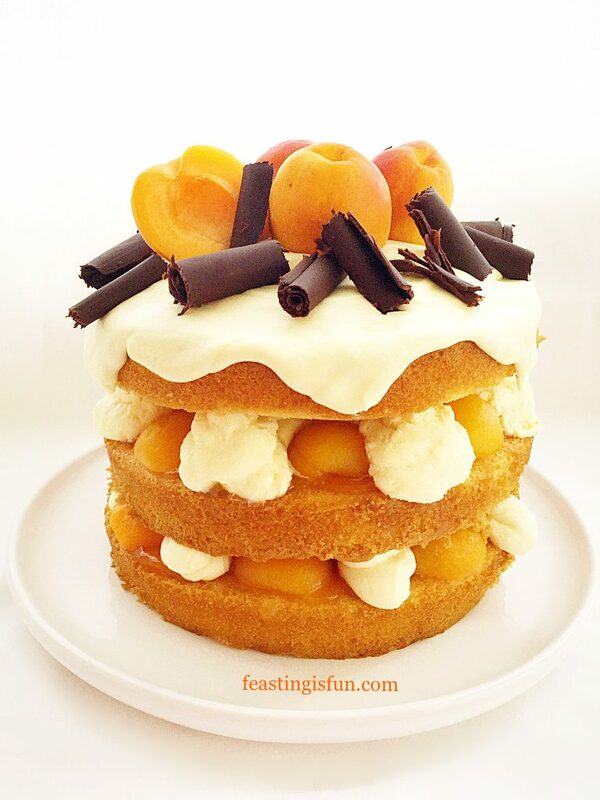 To serve, cut the cake in half from top to bottom, this makes it easier to portion slices. Enjoy with friends, family and loved ones. For a special occasion serve with a glass of chilled champagne. This cake is best enjoyed the day it is decorated. The sponge can be made up to 2 days ahead. 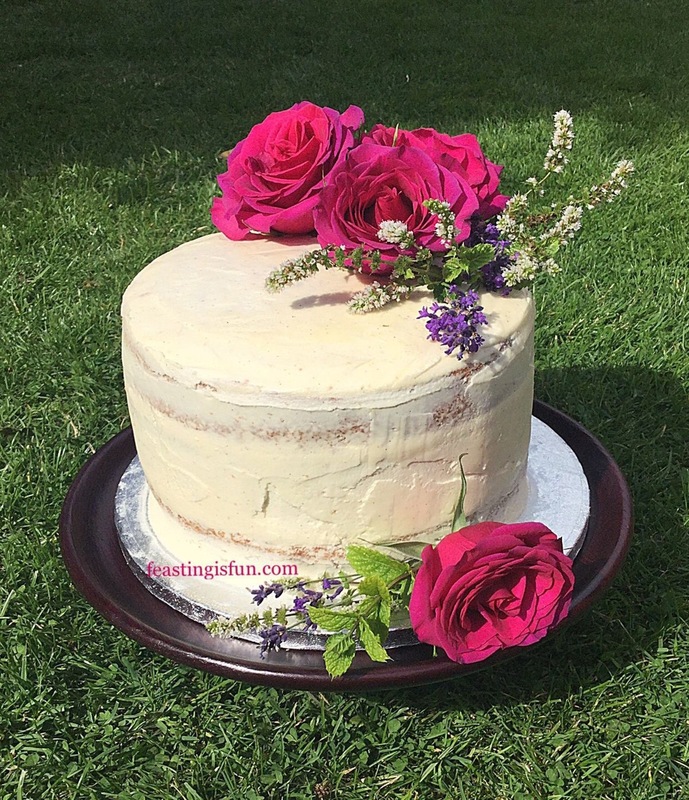 Wrap the uncut cake in cling film and store in an airtight container. Store the finished cake in the fridge and eat within 2 days. When strawberries are in season, warmed by the sun and picked straight from the plant they need nothing else to celebrate their sweet, juicy flavour. 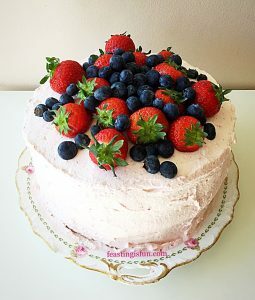 Yet adding them to desserts such as Pavlovas, Cream Cakes and other delights, showcases their versatility and beauty. So I get very excited about the start of the strawberry season, poly tunnels and super greenhouses making local, British fruit available earlier in the year and extending the season. While they might be available in the supermarkets all year long, which does have its benefits, nothing beats homegrown or farm fresh berries. I love fresh cream cakes and pastries. Whether they are individual chocolate drizzled choux buns such as Hot Chocolate Fudge Sauce Covered Profiteroles, or a large cream filled sponge cake like my Strawberries and Cream Cake. 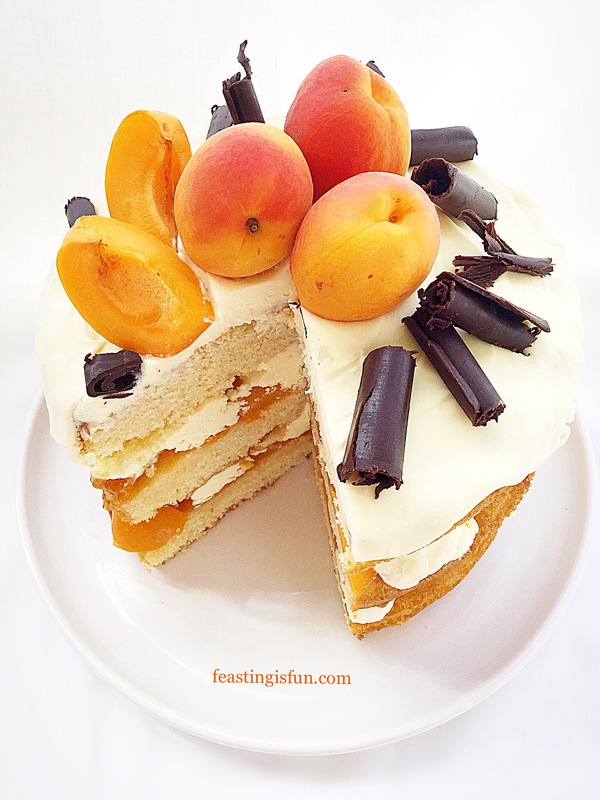 While the whipped cream gives a delicious lightness to the cake, it is also not as sweet as other frostings. 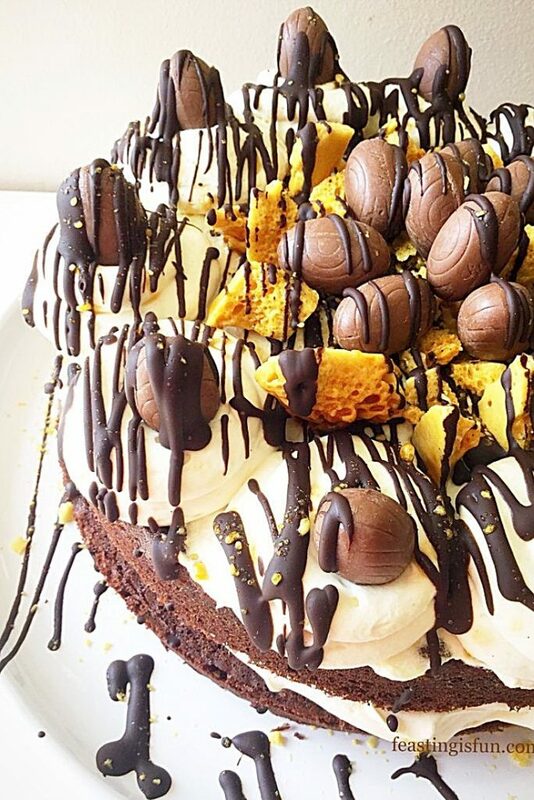 Here in this Chocolate Honeycomb Sponge Cake it provides the perfect contrast to the velvet chocolate sponge. Since having a bag of Art of Mallow’s new Honeycomb product, I wanted to create something that would really show off it’s beautiful colour and toffee flavour. Having some Lindt chocolate eggs leftover from Easter seemed perfect. Because when they’re not available the shiny wrapped truffle balls are! Also, using dark chocolate as the contrasting drizzle keeps the balance of flavours perfect. 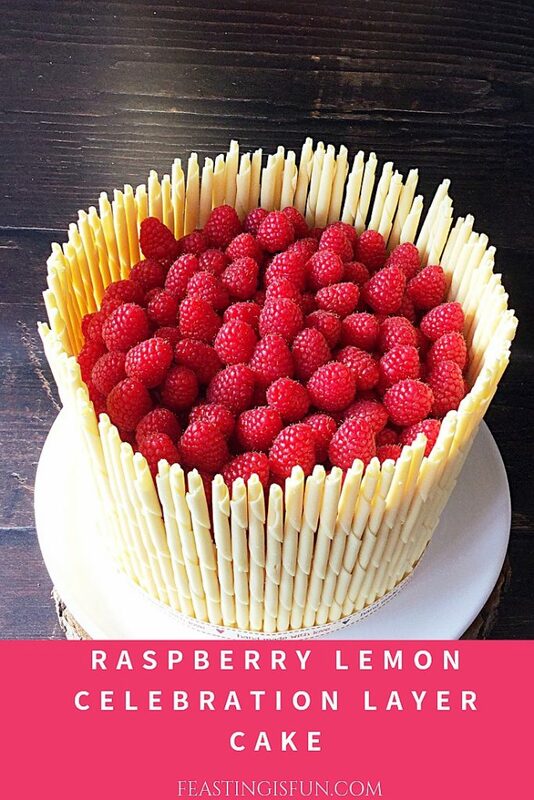 Simply put, this cake is incredible. Especially for those who prefer their cakes a little less sweet. Even with the addition of honeycomb the overall flavour is balanced. 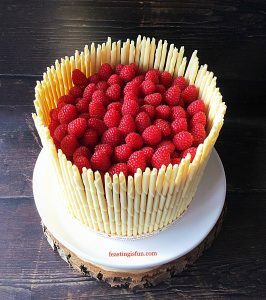 A cake that should suit everyone! Note: You will need 2 x 20cm/8″ sandwich tins at least 5cm/2″ deep. Grease with butter and line the base with baking parchment. First of all place the sugar, butter and salt into a large bowl and whisk together until pale and creamy. Add all five eggs and the vanilla, then sift the cocoa powder on top. Whisk together until completely combined. 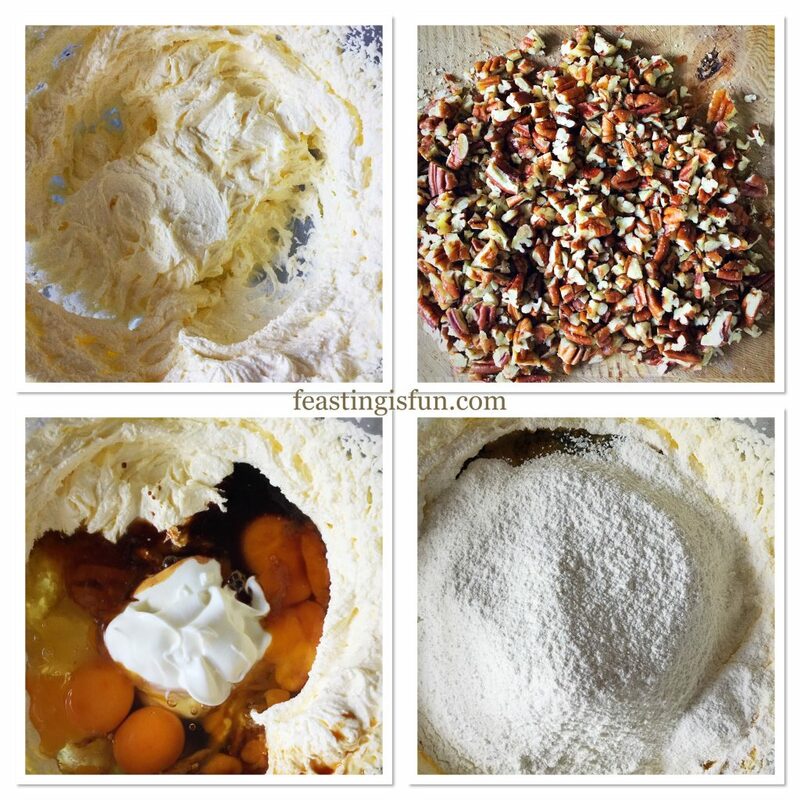 Sift the flour and baking powder into the bowl. Gently fold the flour in using a metal spoon until the ingredients are just combined. Over mixing will cause the cake crumb to be tough. Making the velvet chocolate cake batter. Divide the rich chocolate cake batter evenly between the two prepared tins. Place the cake tins into the lower and middle part of the oven and bake for 35-40 minutes. The cakes are cooked when they spring back from a light touch. Also an inserted skewer will come out clean. 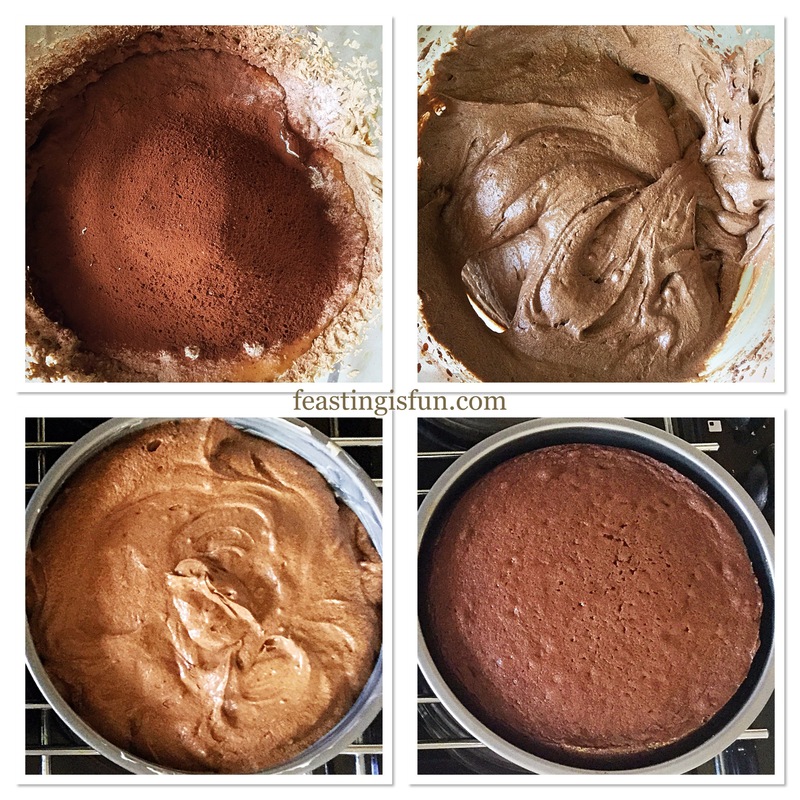 Before and after shots of the chocolate sponge cake. As soon as the cakes are baked remove from the oven and place the tins on to a cooling rack. Leave the cakes to cool in the tin for 15 minutes before turning out and allowing to finish cooling on the rack. While the cakes finish cooling prepare the cream. Pour the cream and vanilla into a large bowl. Whisk until the cream just holds it’s shape. Fill a piping bag with a 1cm round nozzle, with half of the whipped cream. Also, break up the chocolate and place in a heatproof, microwaveable bowl. Zap for 20 seconds at at time until the chocolate starts to melt. 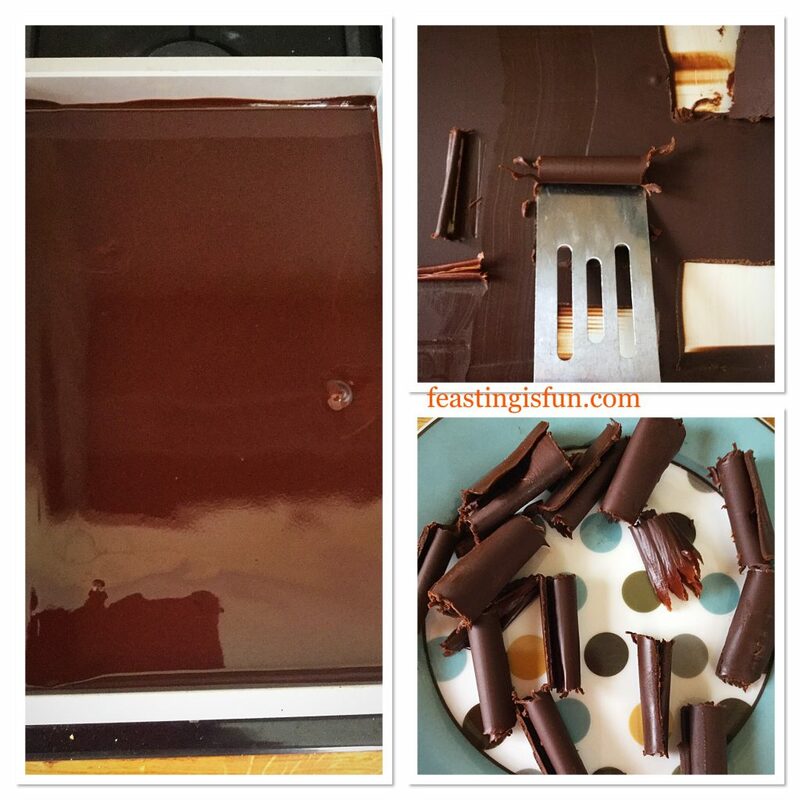 Remove and stir continuously until all of the chocolate is melted. Pour into a small, disposable piping bag and set to one side to cool. 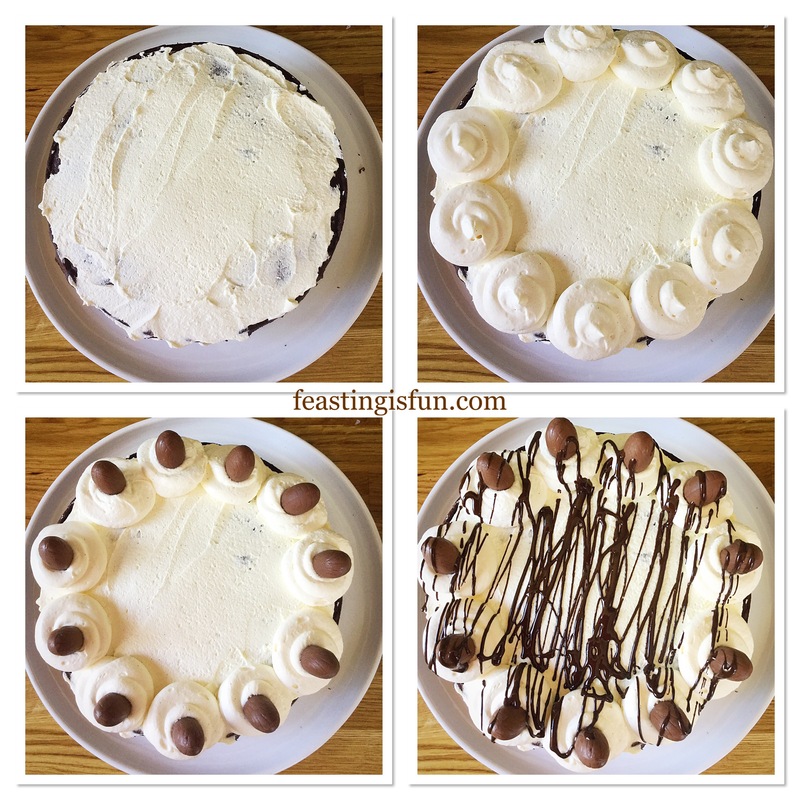 Place a cooled chocolate sponge, flat side up on to a board or plate. Spoon the remaining cream on to the sponge and spread to cover evenly. Preparing the cream and chocolate, starting to assemble the cake. Place the second sponge, flat side down, gently on top of the cream covered bottom sponge. Pipe a small amount of cream on to the sponge and spread, using a palette knife to cover. Now pipe swirls around the outside edge. 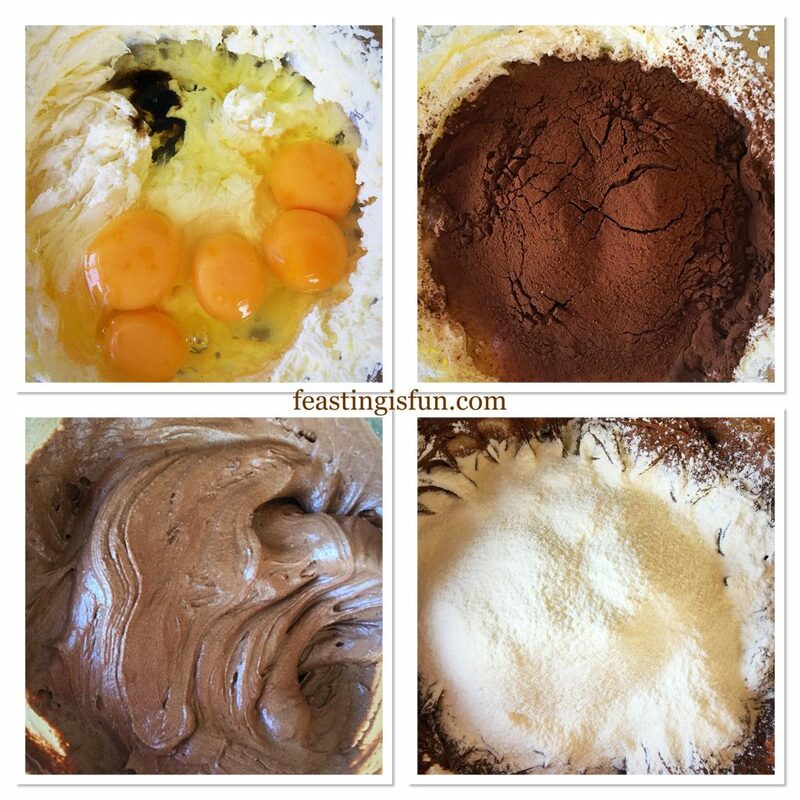 Add a Lindt chocolate ball or egg on to each swirl. Snip off the very end of the melted chocolate filled piping bag and drizzle across the cake. Reserve some melted chocolate for finishing the cake. Crush the honeycomb using a rolling pin and sandwich bag. Aim for some larger pieces, rubble and golden dust. Place the larger pieces of honeycomb just inside the piped swirls. 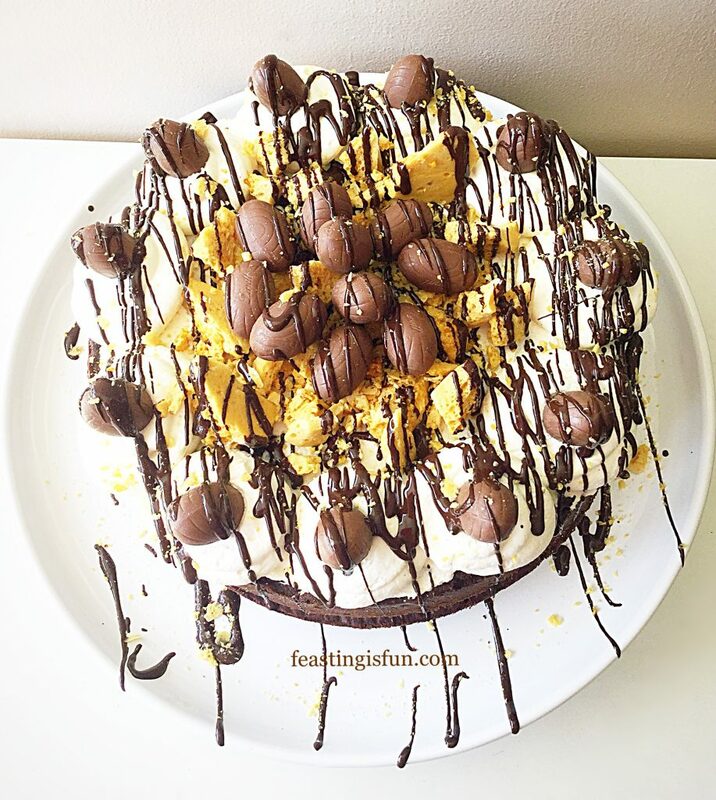 Fill in the centre with the honeycomb rubble, reserving a couple of teaspoons to finish the cake. Top the honeycomb with the remaining chocolates. Adding the golden honeycomb to the cake. Finally pipe more chocolate drizzle on top of the decorated cake, allowing some chocolate to drizzle on to the plate. Finish with a sprinkle of gold, crushed honeycomb. Refridgerate the cake for 30 minutes to allow the chocolate to set and the whole cake to firm up. Slice and share with good friends. Ideally this cake is at its best eaten the day it is made. 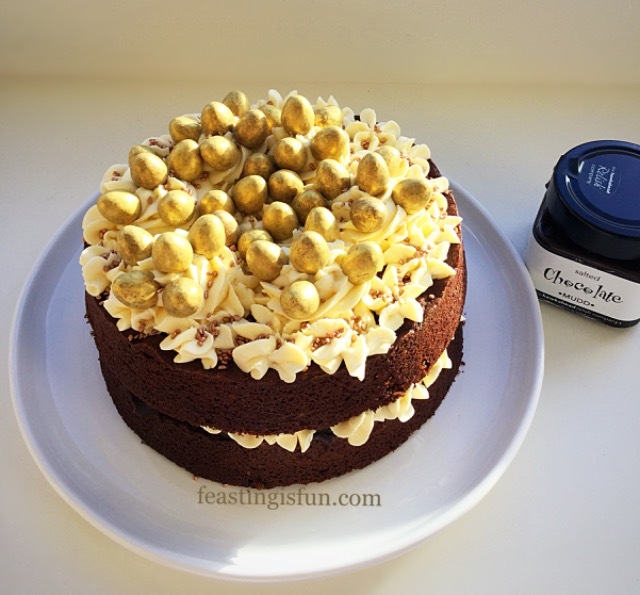 The chocolate sponges can be made a day ahead and stored in an airtight container. Once made keep the cake refrigerated and eat within 3 days. I should say that I thoroughly enjoyed two slices of this cake. And, in the spirit of sharing, our Waitrose shopping delivery driver also went away with a generous slice. My firm belief is that all food tastes better when it is shared. The sheer joy to be had when giving someone an unexpected foodie treat makes our own eating experience that more special. 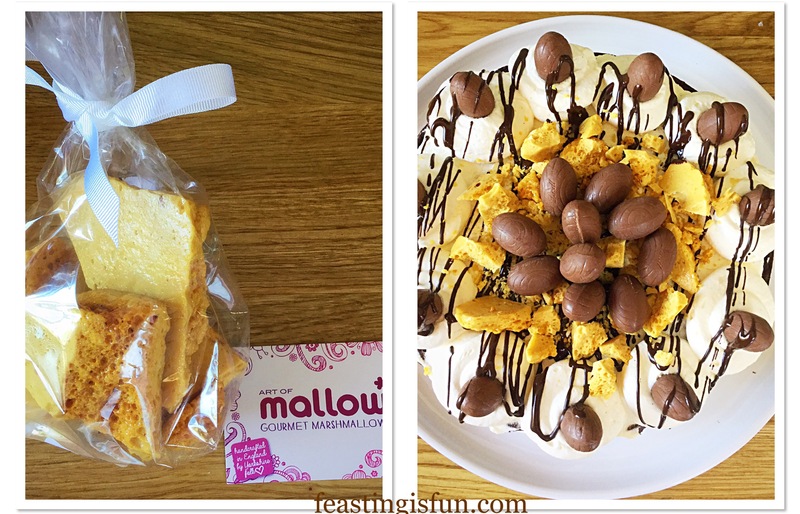 Art of Mallow kindly sent me a bag of their new honeycomb to review. All opinions and views in this post are my own. No part of this post may reproduced or duplicated without the written permission of the owner. Please see my Disclosure Policy. Every year I try to make my Father in law’s birthday cake. Since his favourite cake is Classic Coffee Walnut Cake, creating twists on the original are fun. 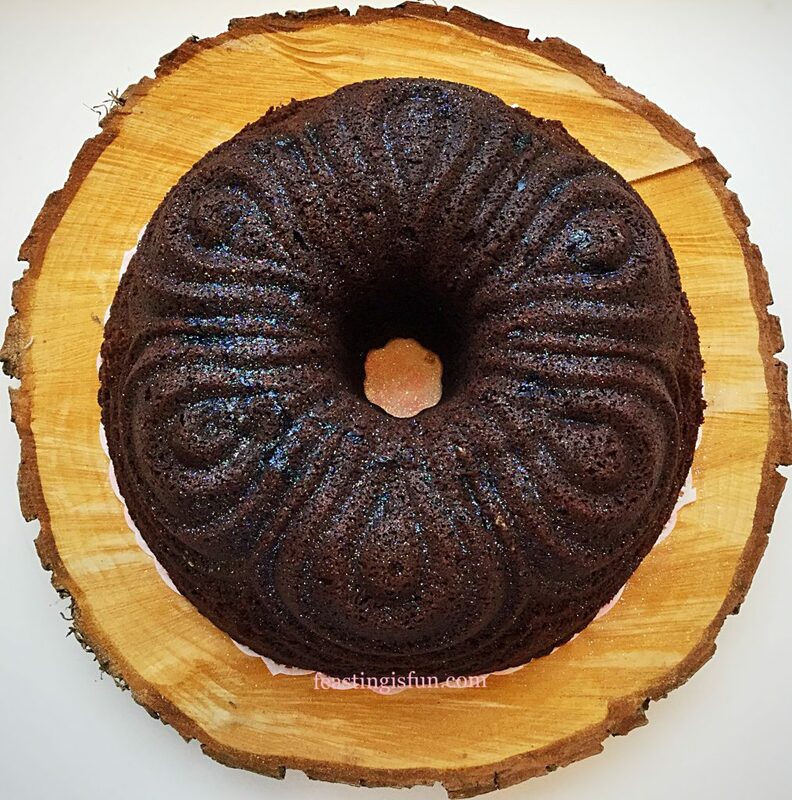 So, this year I switched things up and made a Coffee Pecan Nut Glazed Bundt Cake. Baked in a beautiful Bundt pan and finished with a latte coloured coffee glaze. I am assured that this cake was a big hit. 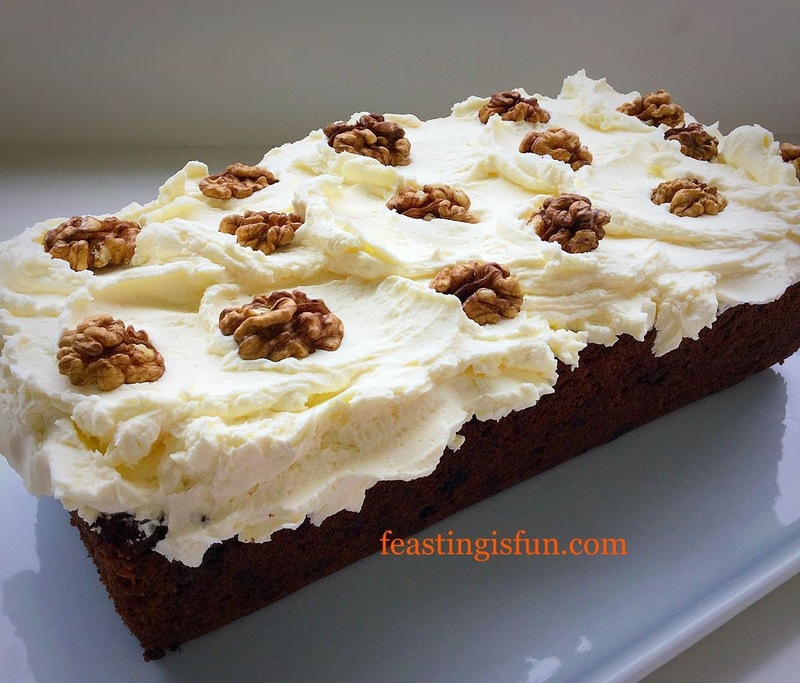 While the nuts may have been switched up, the cake still has to deliver one hundred per cent on flavour. Using espresso powder gives an intense coffee flavour, without being overpowering or bitter. Adding chopped pecans provides crunch against the super moist crumb of the cake. 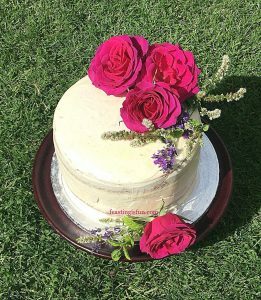 Finally, a simple coffee icing glaze not only picks out the detail of the cake shape, but also provides a first, sweet, coffee bite into the cake. Since a birthday must be celebrated and a celebration demands a cake (or it is just a meeting), baking a beautiful cake is something I take pleasure in. As much as everyone takes pleasure in eating it! Candles, beyond a certain age, most definitely become an option. Yet, a little sparkle adds a special edge. 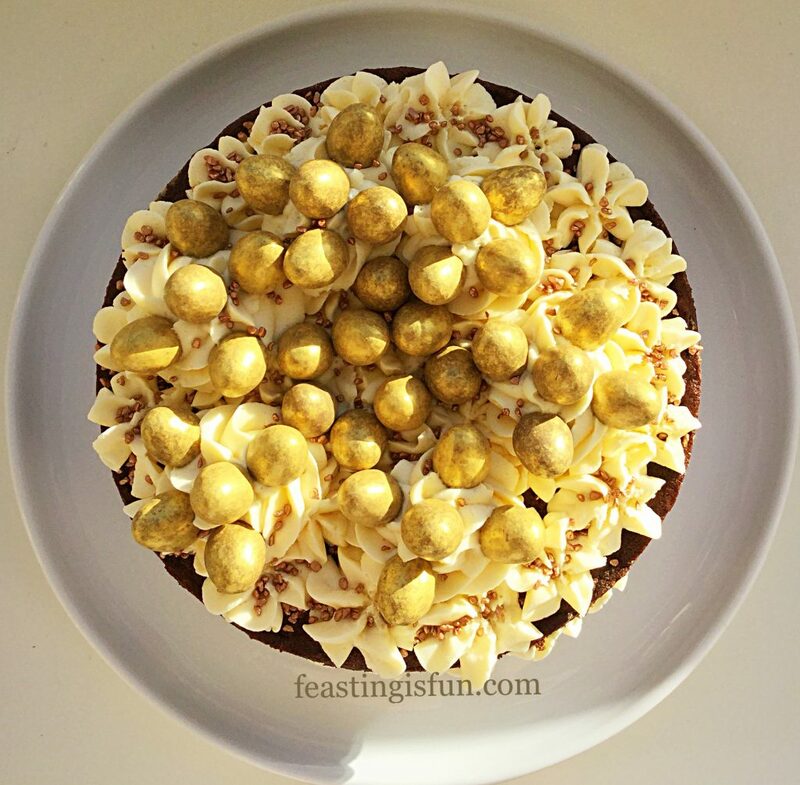 So edible gold glitter, liberally sprayed over provides the ‘wow’ that sets this cake apart from others. 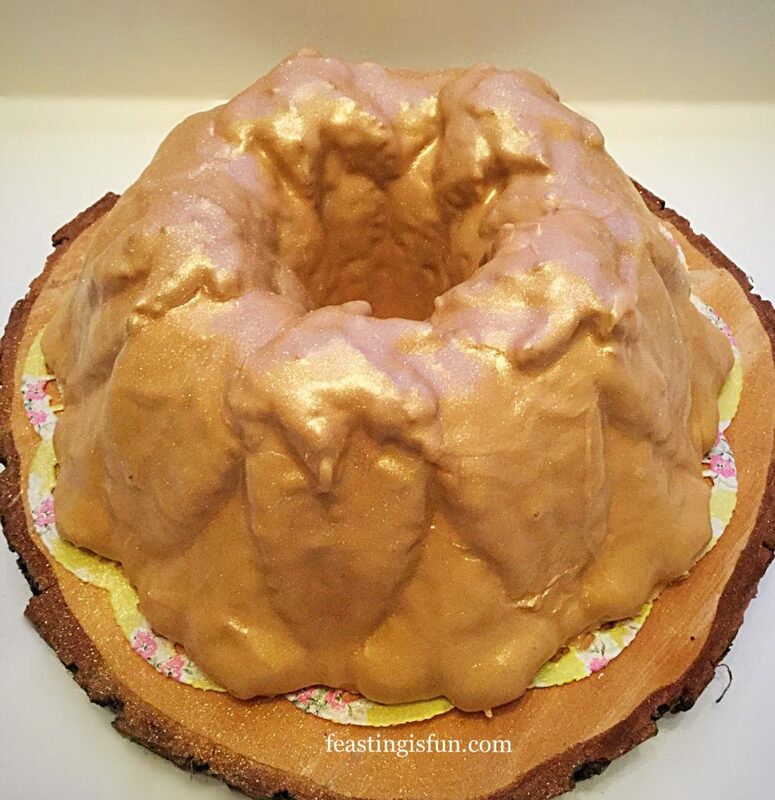 Photos were taken with artificial light, never ideal, show this cake as yellow gold. However, in natural light the glaze is a latte colour with a slight shimmer from the glitter. 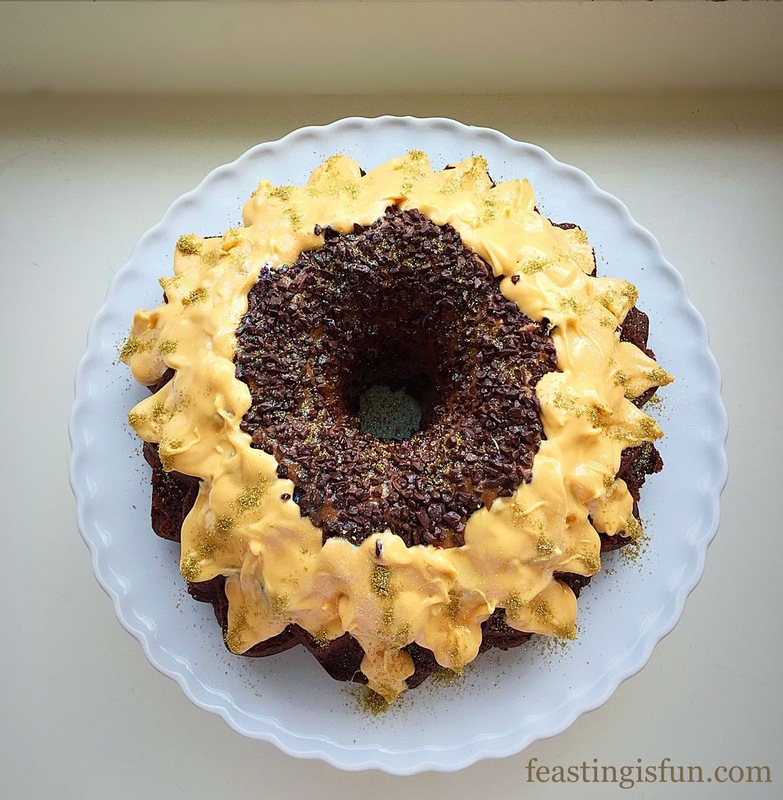 Note – this recipe uses a 10 cup Harvest Leaf Bundt Pan from Nordicware. Ensure you use a 10 Cup Bundt. I recommend Wilton cake release spray (also available in a bottle, shake and brush on to the cake tin), to ensure the cake releases from the Bundt Pan. First of all prepare the Bundt pan. 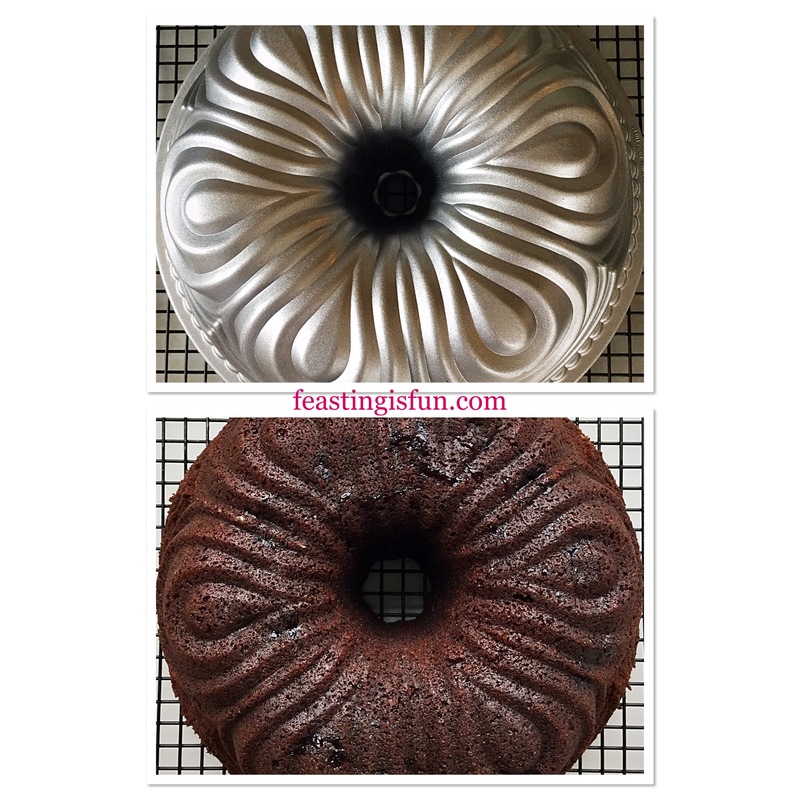 Spray with cake release and use a pastry brush to ensure every part of the Bundt interior is completely coated. Next, in a large bowl add the butter, sugar and salt. Whisk together until pale and creamy. Now add the eggs, vanilla extract, espresso and yoghurt. Sift the flour and baking powder into the bowl. Whisk all ingredients together until just combined. Making the Bundt cake batter. Finally add the chopped pecans to the cake batter and fold into the mix with a spoon. Now spoon the pecan studded cake batter into the prepared Bundt Pan. Push the mixture down into the pan so the every part of the intricate mould is filled. 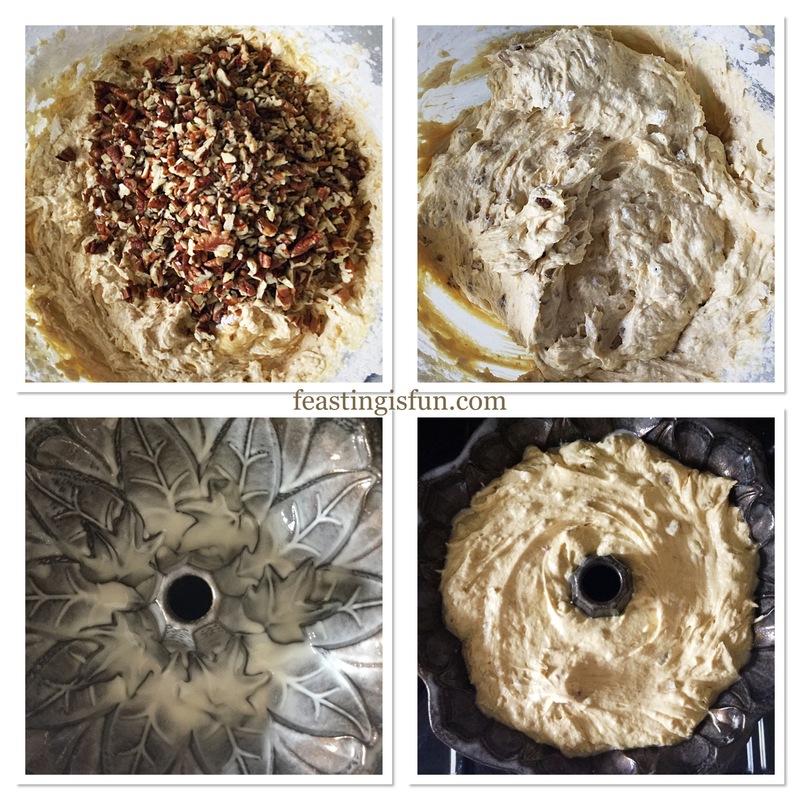 Preparing and filling the Bundt pan. Place the cake into the centre of a preheated oven and bake for 60 – 70 minutes. 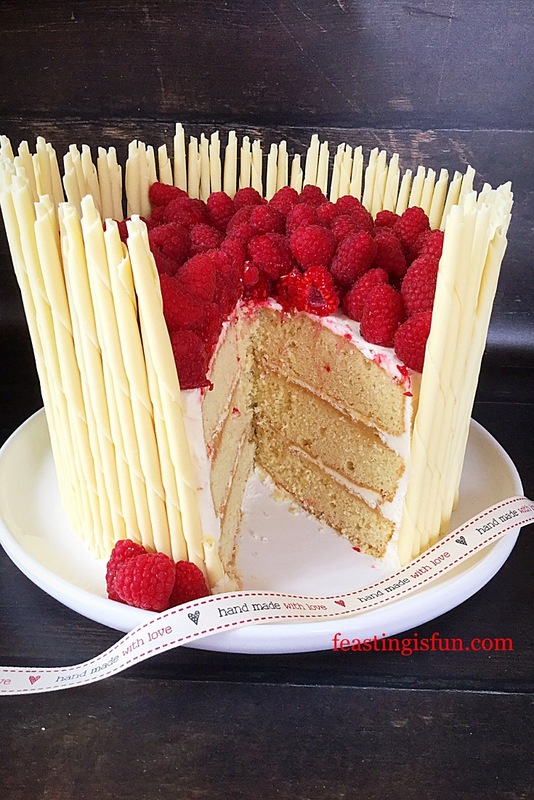 The cake is baked when it is golden in colour and an inserted skewer comes out clean. Once baked remove the cake from the oven and leave to sit for 10 minutes in the pan. Then turn the cake out on to a cooling rack and leave to cool completely. Baking and turning out the Bundt cake. As soon as the cake is cooled it is ready to decorate. Sift the icing sugar into a bowl. Add the espresso liquid and enough water to create a thick glaze. Place the cake, still on its cooling rack, over a clean baking tray. Due to the addition of coffee in this glaze it forms a crinkle skin quickly. 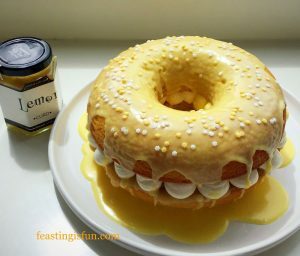 Work quickly, without rushing, when glazing the cake. Starting at the top of the cake spoon over the thick glaze. Continue spooning the glaze around the cake until the entire cake is covered. If necessary spoon glaze that has dropped through to the tray over the cake, covering any holes in the glaze finish. As soon as the glaze has stopped dripping and is starting to set transfer the cake to a board or plate. 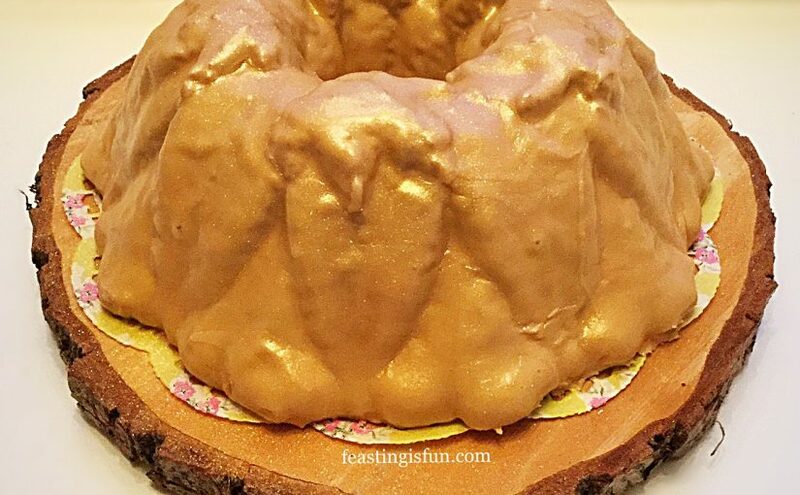 Dust the cake with edible gold glitter once the glaze has fully set. 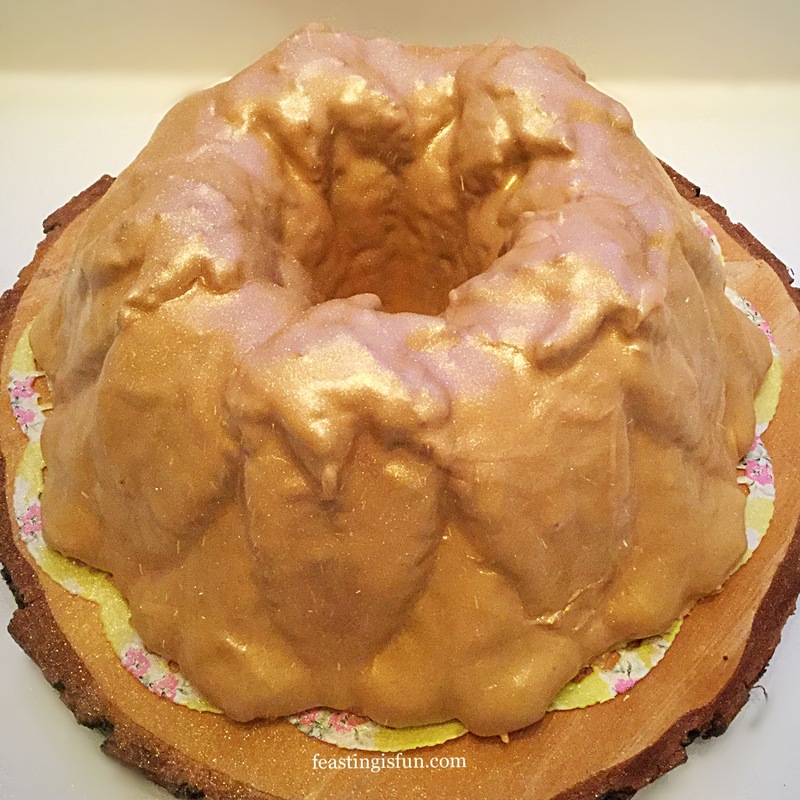 Coffee Pecan Nut Glazed Bundt Cake finished with a spritz of glitter. I couldn’t resist a photograph with fairy lights! Coffee Pecan Nut Glazed Bundt Cake lit up! Slice the cake to serve. Store in an airtight container for up to 5 days. Refrigerate during warmer weather. Baking for others is a great way show you care and treat them at the same time. While a birthday without a cake is unthinkable in many homes, other bakes can also be made. Our youngest daughter usually prefers this Raspberry Chocolate Pavlova, for her birthday and our eldest always has two cakes. An ice cream cake and a baked one. Whatever is baked and celebrated with, it contains one thing it’s mass produced copies don’t. Love. The most important ingredient in any bake. Whatever you are making baking and creating in your kitchens, have fun preparing your feast. Please note, no part of this post may be reproduced or duplicated without the written permission of the owner. Please see my Disclosure Policy. The past fortnight has been a busy one here at home. Hospital appointments for me, rugby matches for our son and both of our girls working hard on their studies. Life has been hectic. Yet, during this time, we have also celebrated two special birthdays in our family. Amidst the coming and going, we made time for what is important. Spending time together. Celebrating birthdays and enjoying the company and love that we have for each other. 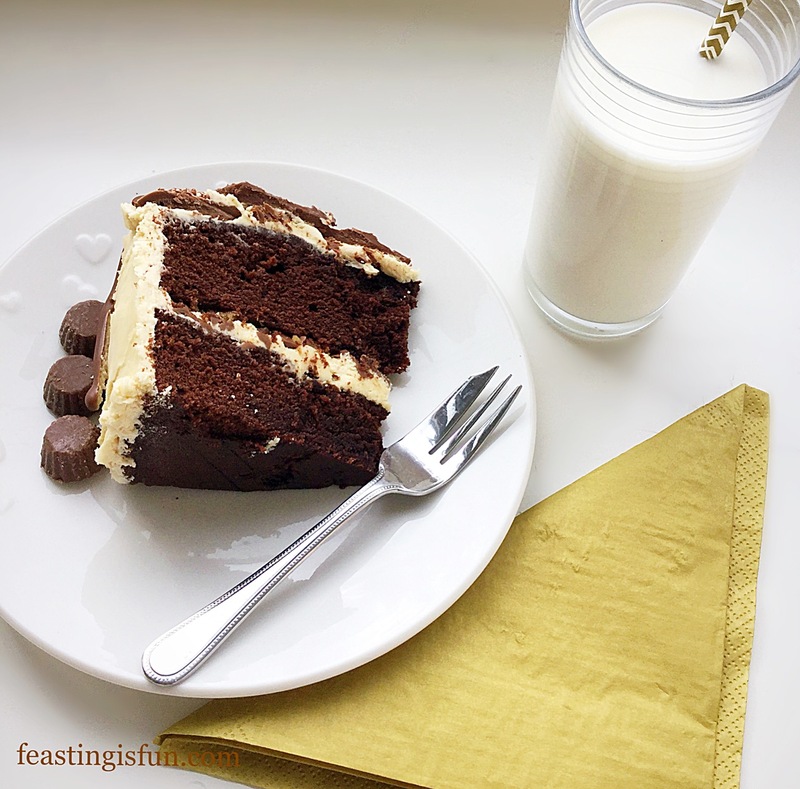 Laughing, catching up, chatting, more laughter and sharing this delicious Chocolate Peanut Butter Drip Cake. For me, nothing is more important than spending time with those that I love. Whether family, friends or both. Yet due to the continued frequency of seizures see here, these occasions have been few and far between over the last two years. While I was able to attend the wedding of my amazing nephew and my new niece, there have been very many missed opportunities, simply due to my health. Finally, this trend seems to be on the turn and change is afoot! Since our son and my sister celebrate their birthday on the same day, it has become a tradition for them to see each other on their special day. While last year this event was cancelled, we more than made up for it this year! We gathered and celebrated this very special day together. Presents were unwrapped, cards opened, cuddles given. Most importantly we were a family celebrating together. Is there anything that is better? Because I made our, not so little boy, a fruit cake for his birthday over the past couple of years, change was definitely needed! 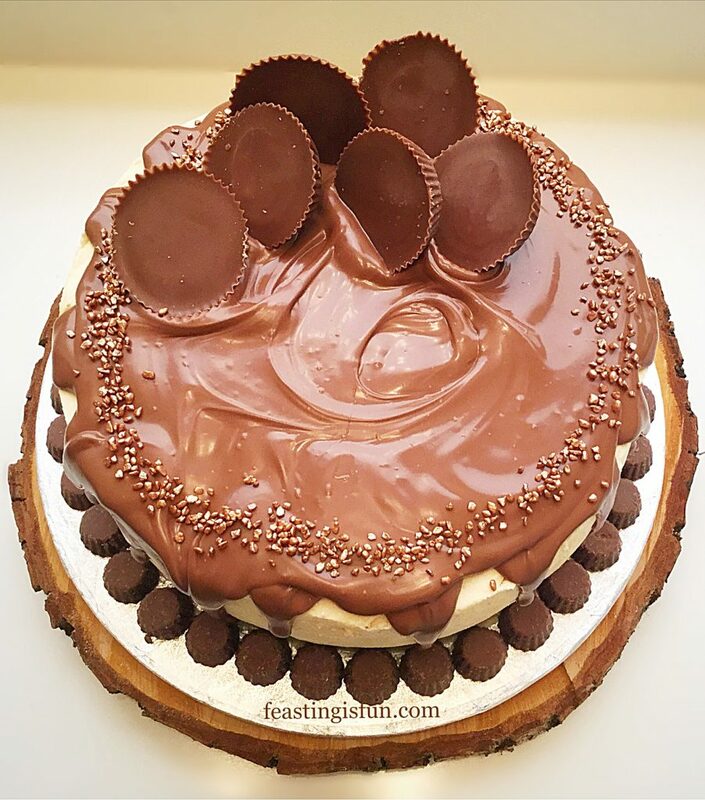 Since I know how much he loves Reeces Peanut Butter Cups I suggested a chocolate and peanut butter cake. Resulting in a huge smile and a big yes from the birthday boy. 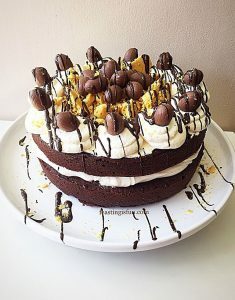 So I made light chocolate and peanut butter sponges, sandwiched together with peanut butter icing, along with hidden, chopped peanut butter cups in the centre. 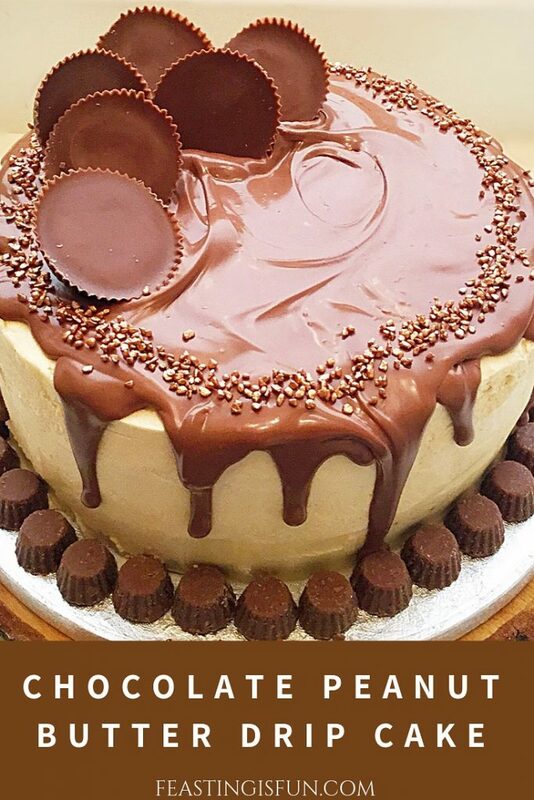 Frosted all over with the same icing and decorated with a milk chocolate drip and more peanut butter cups. Finally, a sprinkle of bronze crunch added elegance to the finished cake. Above all I had made the cake of our son’s dreams. Utterly thrilled with both the look and taste of his birthday cake, oohs and aahs escaped from everyone’s lips. 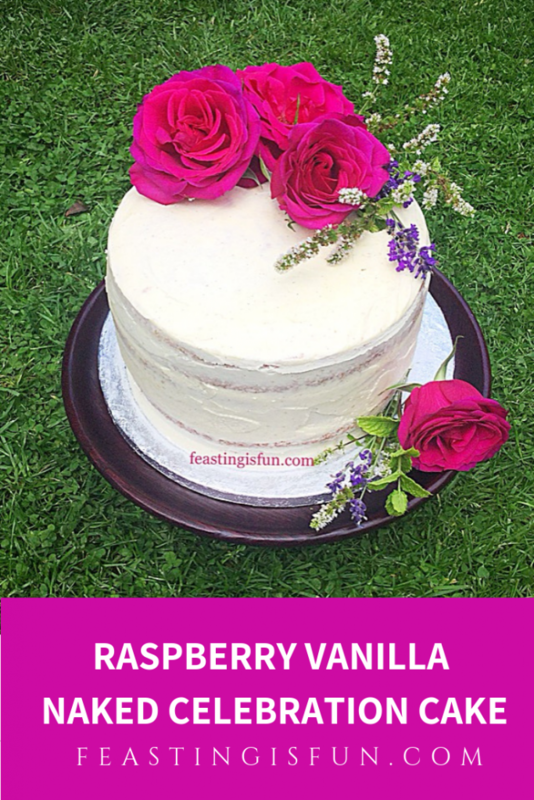 While delivering completely on taste, as it did looks, this cake proved to be a huge hit. Most importantly from the birthday boy himself. Resulting in a day full of happy shared memories. First of all, you will need 2 x 20cm/8″ sandwich tins that are 5cm/2″ deep. Grease thoroughly with butter and line the base with baking parchment. Into a large bowl add the butter, peanut butter, sugar and salt. Whisk until pale and creamy, this will take around 5 minutes. Creaming the butter and sugar together properly helps create a light sponge. Next add all 5 eggs, the milk and vanilla extract. Whisk briefly to break up the eggs. Now sift in the dry ingredients, flour, cocoa powder and baking powder. Finally, whisk or beat all of the ingredients together until they become a smooth batter. 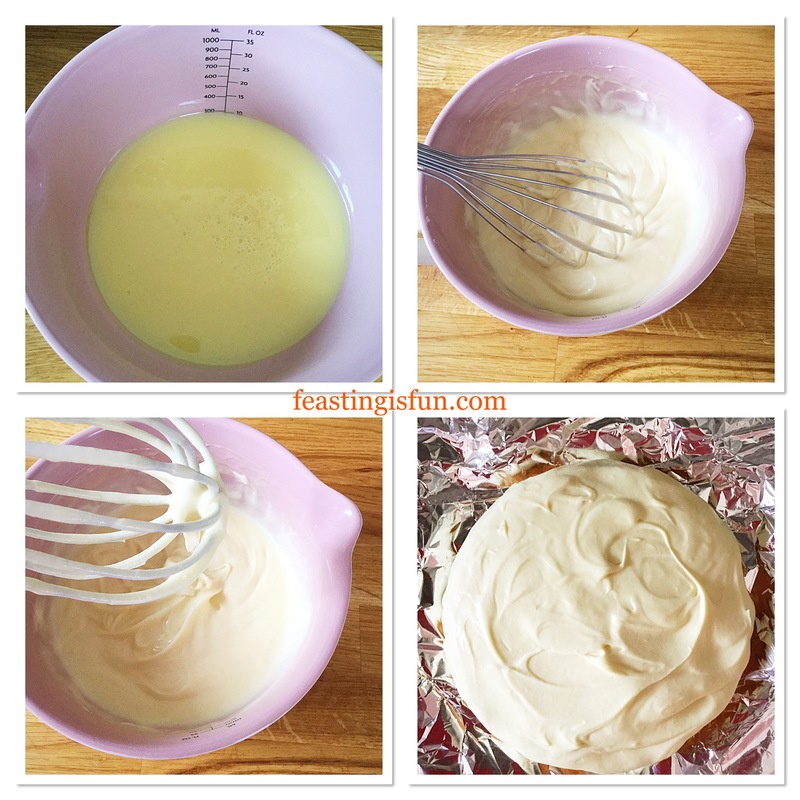 Over whisking will create a tough cake sponge. Making the Chocolate Peanut Butter cake batter. 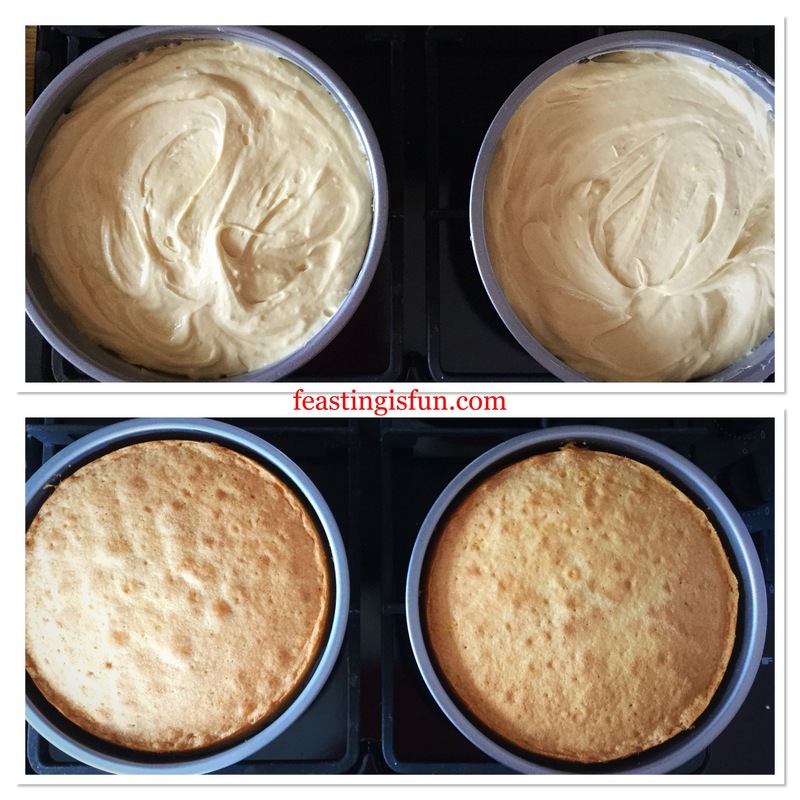 Divide the cake mixture evenly between the two prepared tins. Chocolate peanut butter cakes ready for the oven. 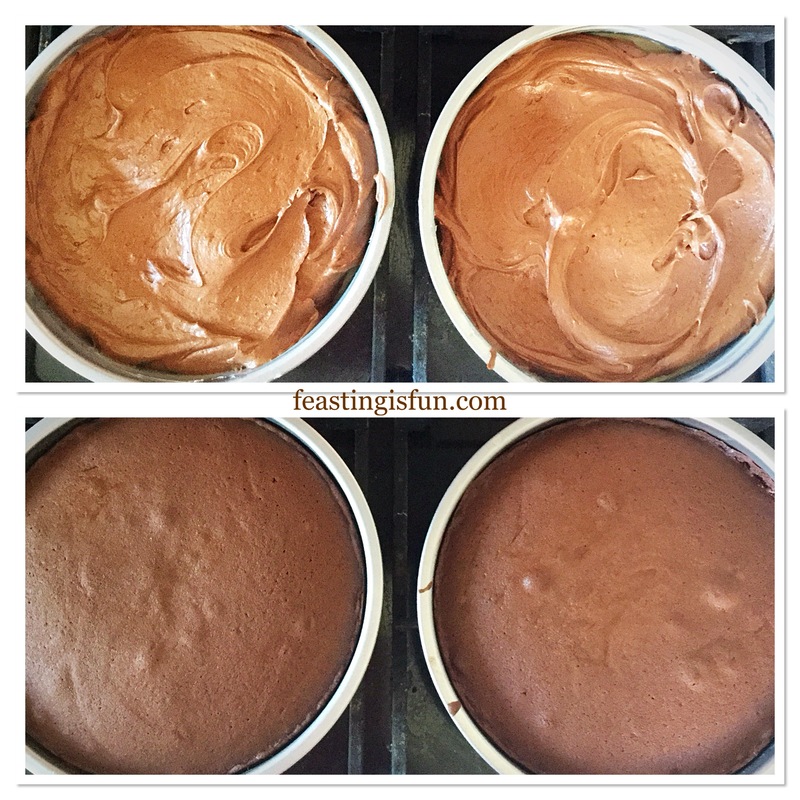 Place the cake tins evenly spaced apart, into the oven and bake for 30-40 minutes. The cakes are baked when they spring back from a light touch. as soon as they are baked remove from the oven. Allow the cakes to cool for 15 minutes in the tin before turning out on to a cooling rack. First of all, chop 20 mini peanut butter cups into small pieces. See the photograph below as a guide. Set to one side. Into a large bowl add the butter, peanut butter, salt, vanilla extract and icing sugar. Next pour the very hot water down the inside of the bowl. Starting on a slow speed whisk the ingredients together, increasing in speed as they become combined. Continue whisking until the buttercream is light and creamy in consistency, with no visible lumps. Check the cake is completely cooled before frosting. 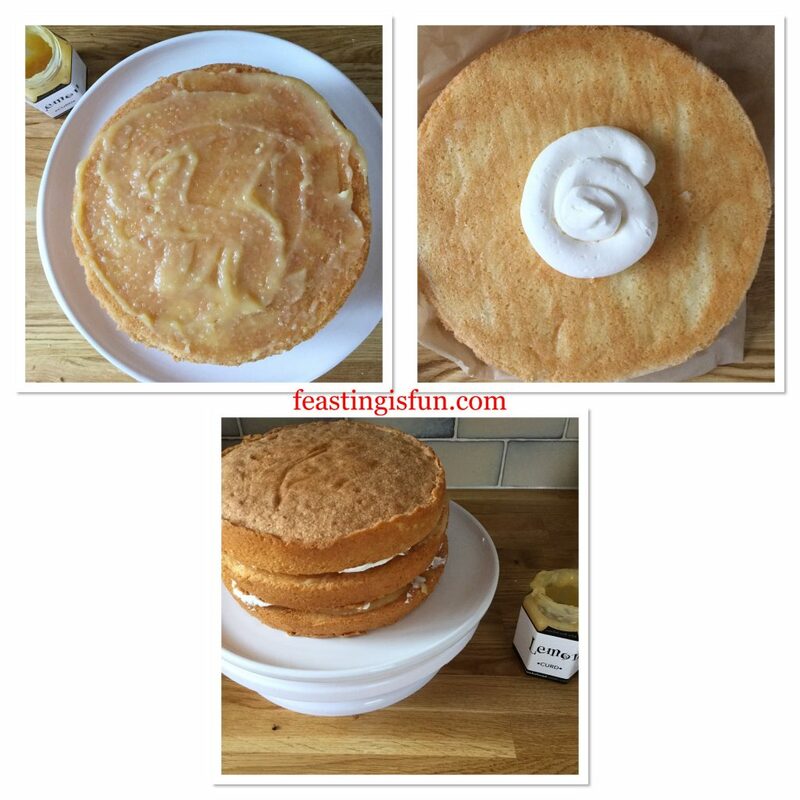 Place one cake sponge, flat side up, on to a cake board or plate. Spoon 3 heaped dessert spoons of frosting on to the sponge and spread evenly across the sponge with a palette knife. Next, sprinkle over the choped peanut butter cups so they create an even layer across the frosted sponge. 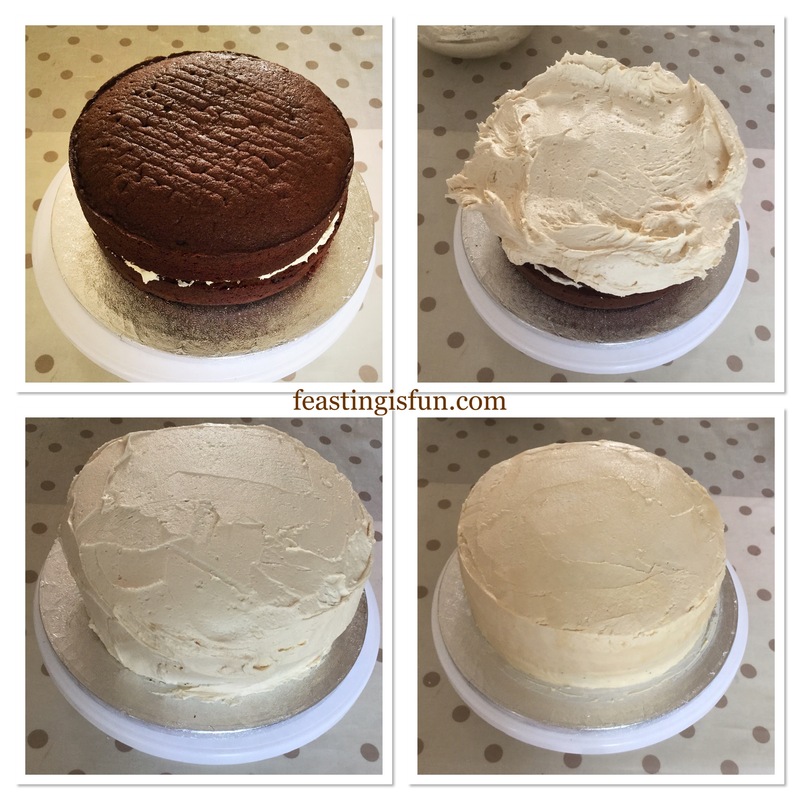 Making the buttercream and filling the centre of the cake. 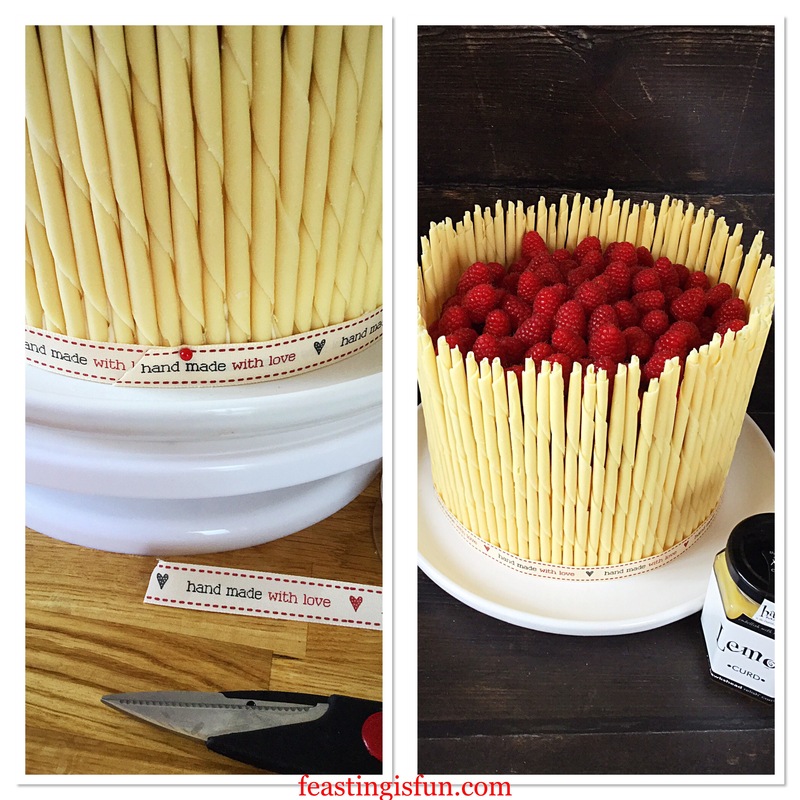 If you have a turning, cake decorating stand place the cake on it. Alternatively place the cake board on to a cake stand. The cake can then be rotated on the board, making the frosting process easier. Place the other cake sponge, flat side down, on top of the bottom sponge. Scoop three quarters of the remaining frosting on to the top of the cake. Using a palette knife spread the frosting across the top of the cake and over the sides. Add the remaining frosting as needed. Rotate the cake, spreading the frosting, until an even finish is achieved. Fill a jug with very hot water. Place a clean palette knife into the water, for a couple of seconds, remove and wipe away the water. Smooth the frosting using the hot pallet knife. 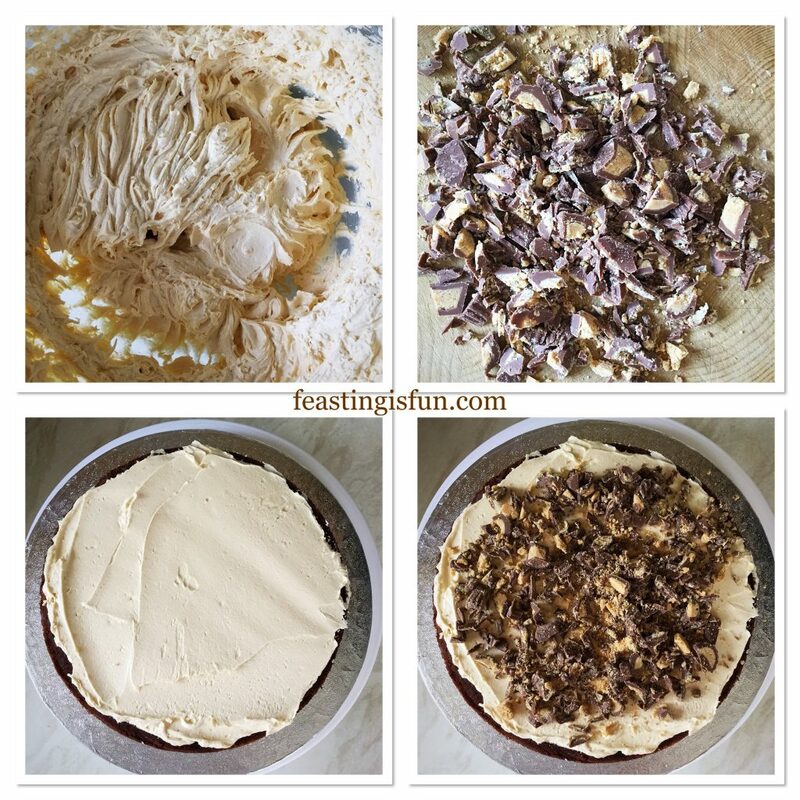 Repeat this process until you have a smooth and even finish to the cake. Refridgerate the cake for at least one hour. The cake may be left in the fridge overnight at this stage. Covering and smoothing the outside of the cake. 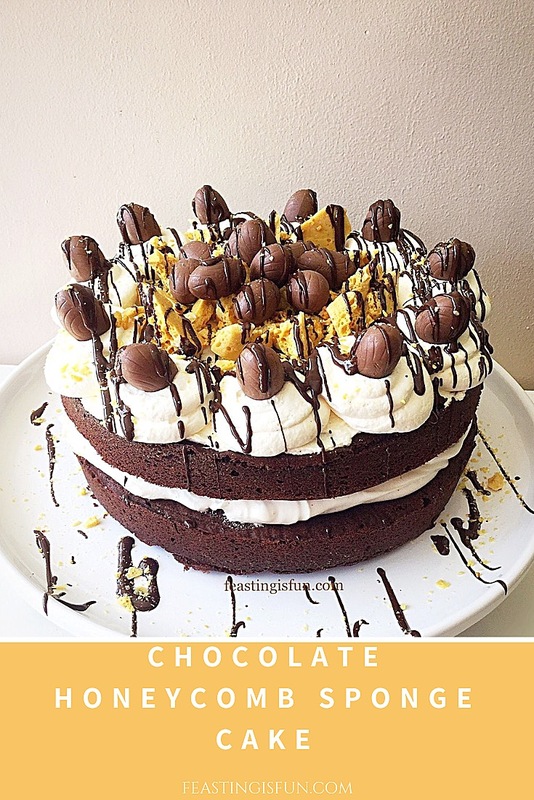 While the cake is finishing chilling, prepare the chocolate. Break up, or chop the chocolate and place into a heatproof, microwaveable bowl. Heat in the microwave, on medim power, for 30 second bursts. Stirring after each heating burst. As soon as the chocolate starts to melt remove the bowl and continue to stir until completely melted. Frosted, chilled cake ready to be decorated. Remove the chilled cake from the fridge and make sure that you have everything needed to hand. Spoon the melted chocolate on to the middle of the top of the cake, gradually working towards the outside edge. As the chocolate reaches the edge add more to encourage it to drip down the side. 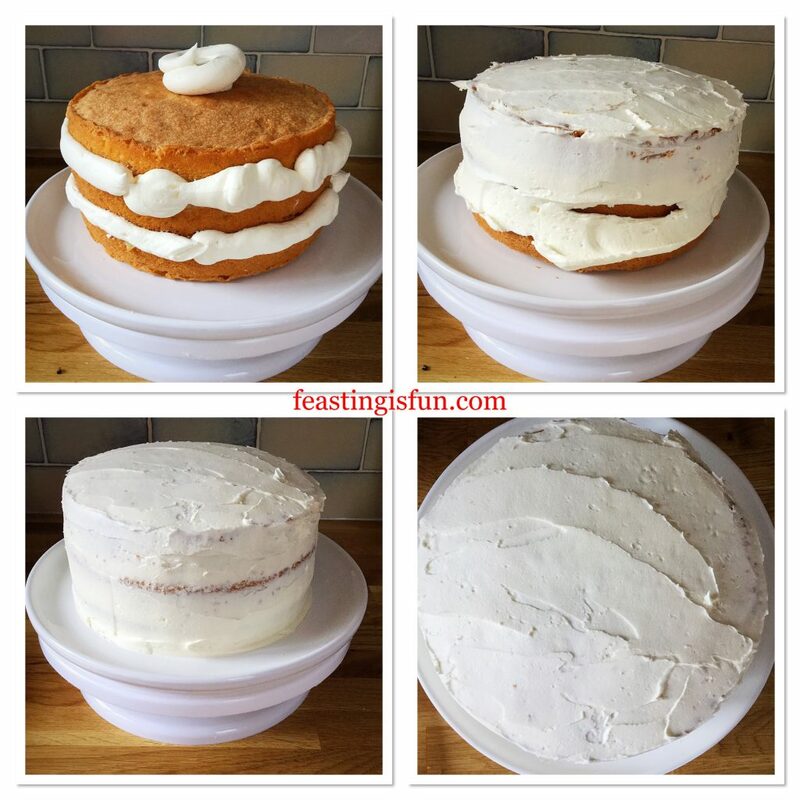 Continue all the way around the cake until you have the desired ‘drip’ effect. 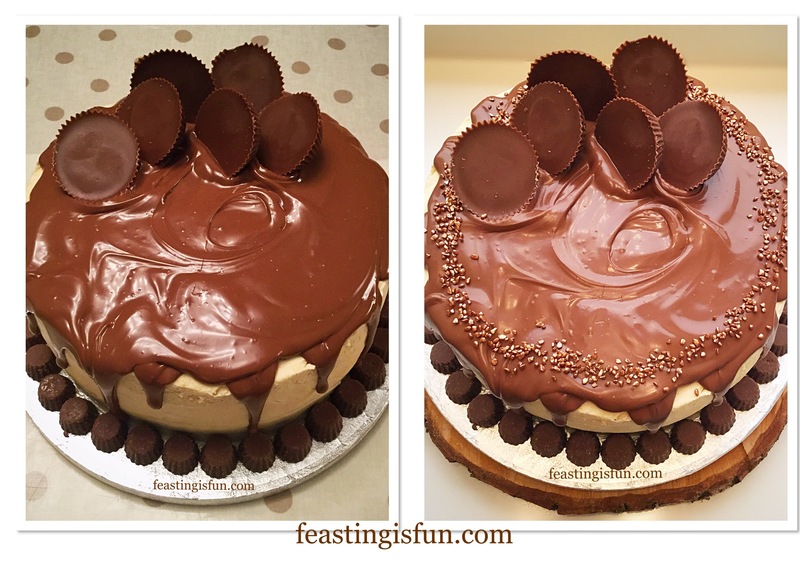 Place the larger peanut butter cups in a pattern and set into the still molten chocolate. 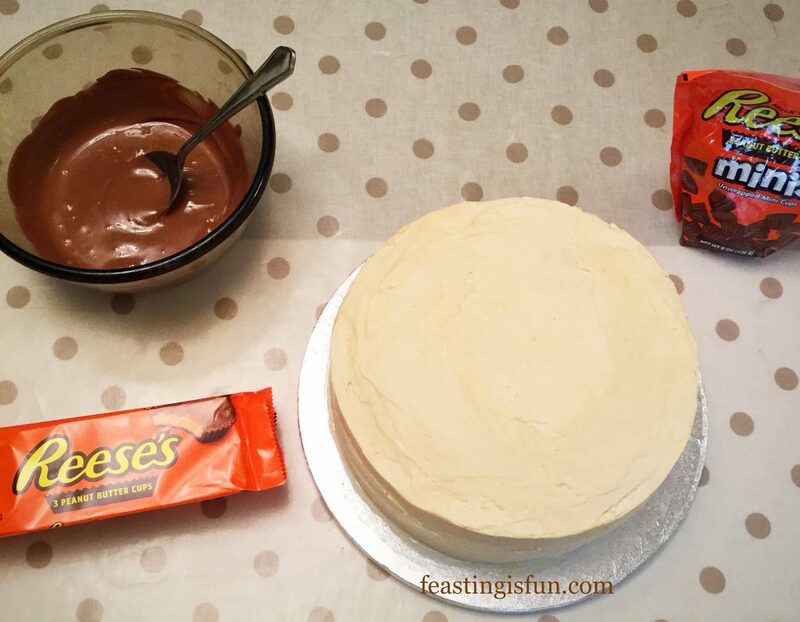 Follow by placing mini peanut butter cups aroung the base of the cake. Finish with bronze sprinkles around the outside edge of the cake. Leave the cake to set. This can be achieved more quickly by chilling in the fridge. Sprinkles added to finish the Chocolate Peanut Butter Drip Cake. To serve, remove the cake from the fridge. Place a sharp knife into a jug of very hot water for a couple of seconds. Wipe the knife dry and then easily slice through the set chocolate and cake. Store the cake in an airtight container for up to 5 days. Keep refridgerated during warmer weather. Homemade cakes are so much better and far more delicious than their mass produced counterparts. 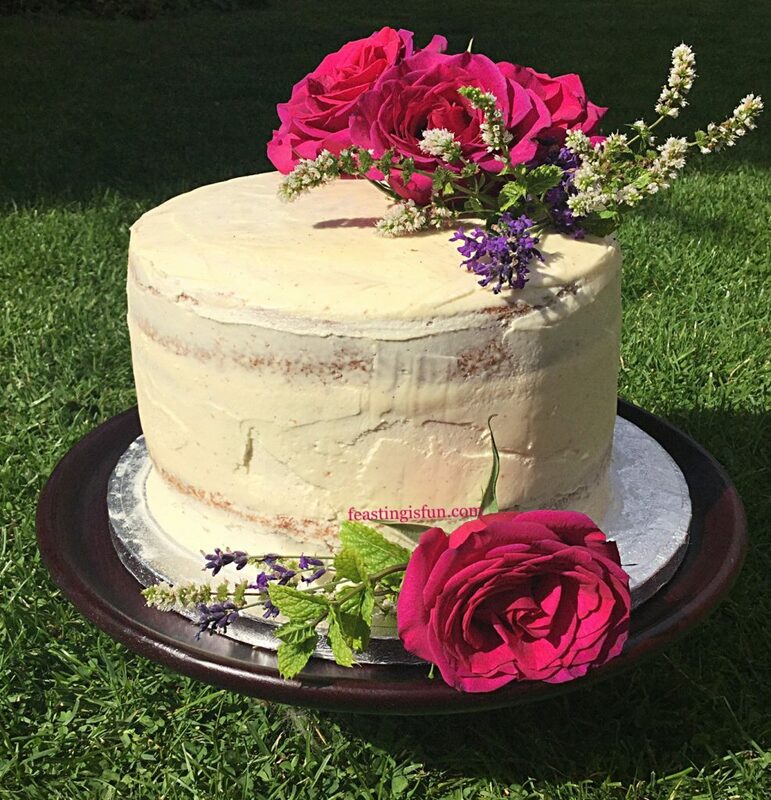 Since each cake made at home is individual in both style and flavour. Knowing that someone has taken the time to create and bake a cake makes me personally feel very special and loved. That is exactly the same feeling I hope to invoke when baking for others. Seeing a big smile is my motivation and reward. 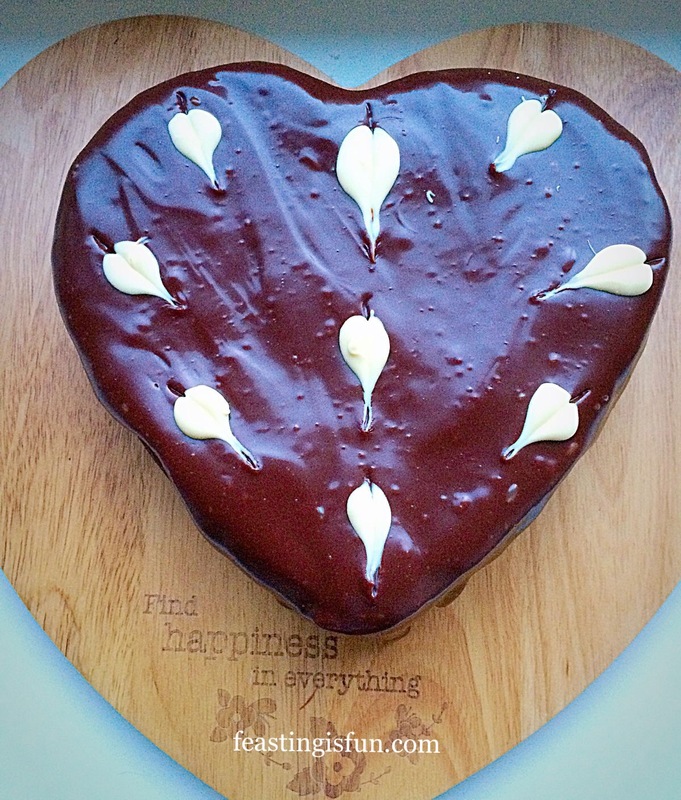 What motivates you to bake? No part of this post may be copied or replicated without written permission from the owner. Please see my Disclosure Policy. Another week and another theme. 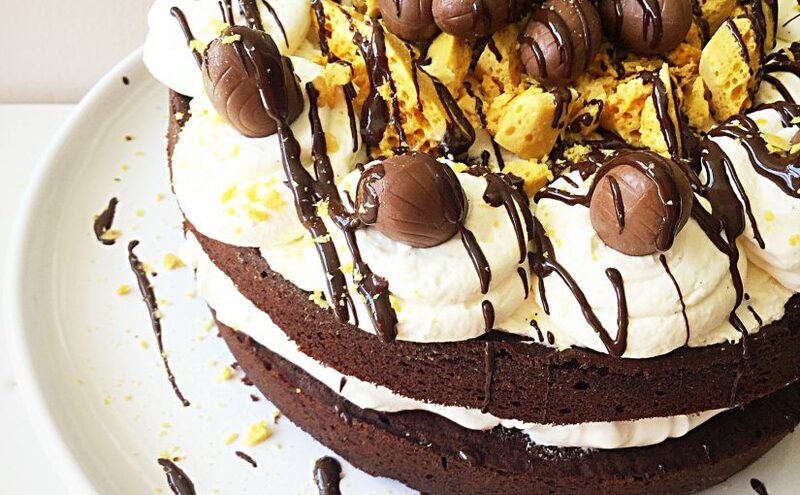 #ChocolateWeek is upon us, demanding chocolate bakes from all who are part of the Twitter baking community. How fortunate for me then that I made this beautiful Chocolate Cherry Chiffon Bundt Cake yesterday. Since it is always chocolate week here at home, this hidden chocolate cherry cake fits the bill perfectly. First of all, I absolutely adore Bundt pans. 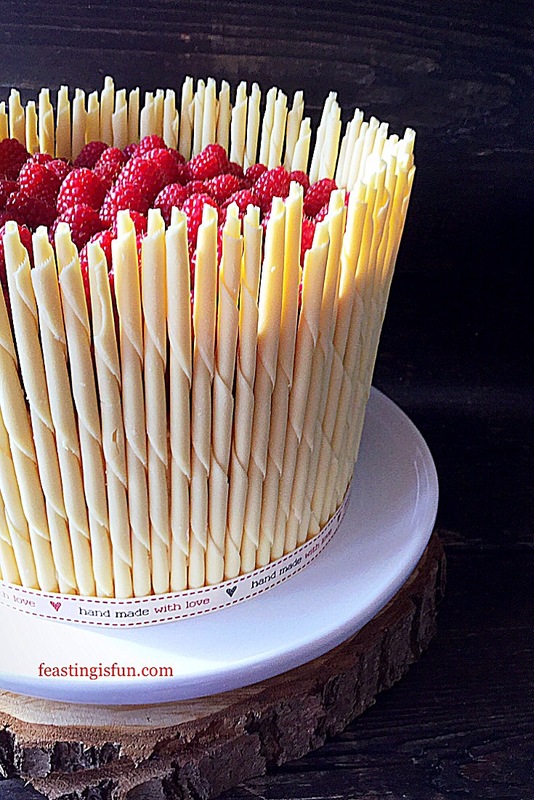 Their beautiful designs and intricate moulding create the most exceptional looking cakes. 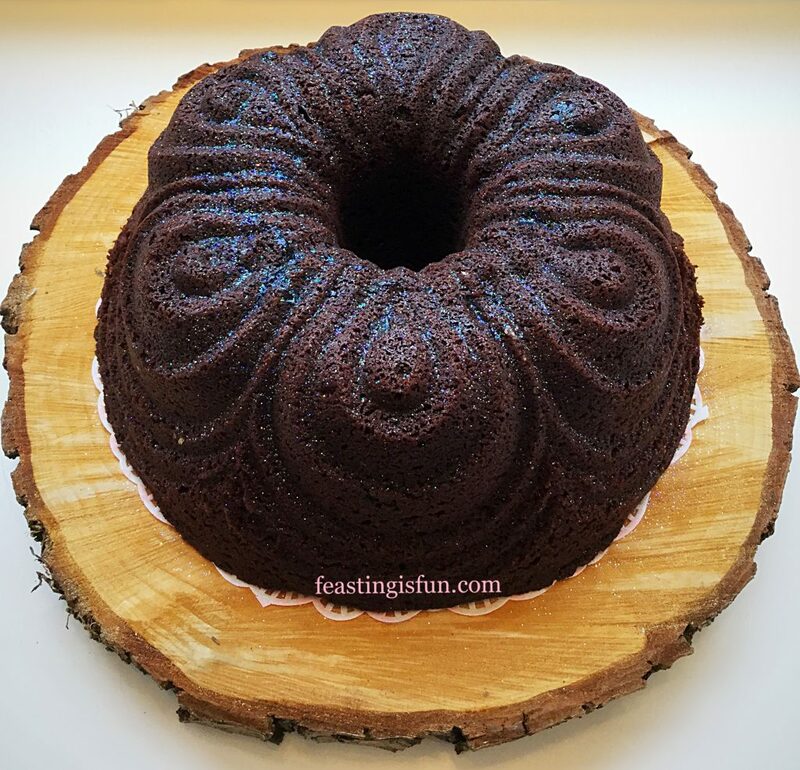 While my cake decorating abilities are improving, especially as I am practicing more, using a Bundt pan really does take away the need to decorate. A simple sprinkle of edible glitter is all that was needed to finish this cake. Cherry and chocolate are a classic flavour combination. 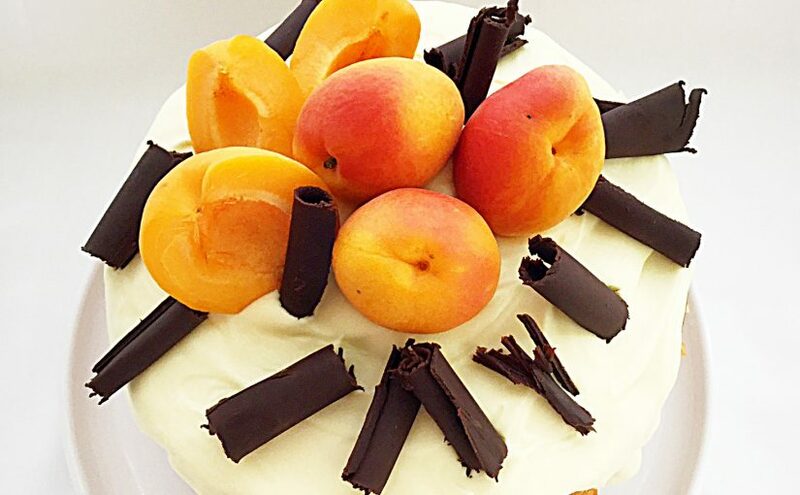 Using chocolate cherry naturally flavoured cocoa powder gives this cake the base flavour. The addition of tinned cherries and ground almonds creates a moist cake with surprise, hidden cherries inside. During baking the cherries drop to the bottom of the cake, which when turned out, becomes the top. Resulting in a jammy like topping. Chocolate Cherry Chiffon Bundt Cake up close. 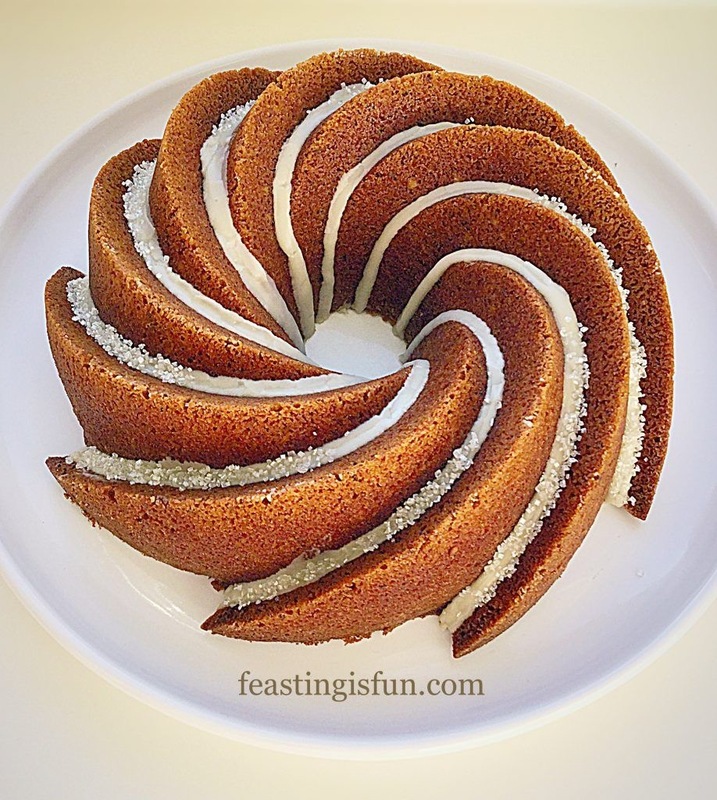 The looping scalloped design of the Chiffon Bundt Pan is very elegant. Flickers of light from the glitter, sparkle and accentuate the design. Aside from covering in a very thin glaze, as done here, this cake really is best left as is. Indeed, left un-iced, dare I say this would be utterly delicious eaten with hot custard. 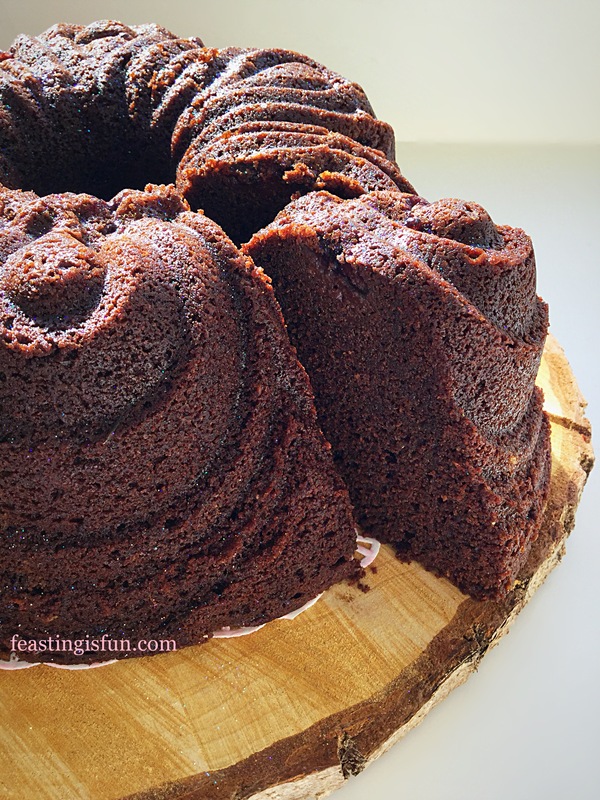 For this recipe a 10 cup Bundt Pan is needed. 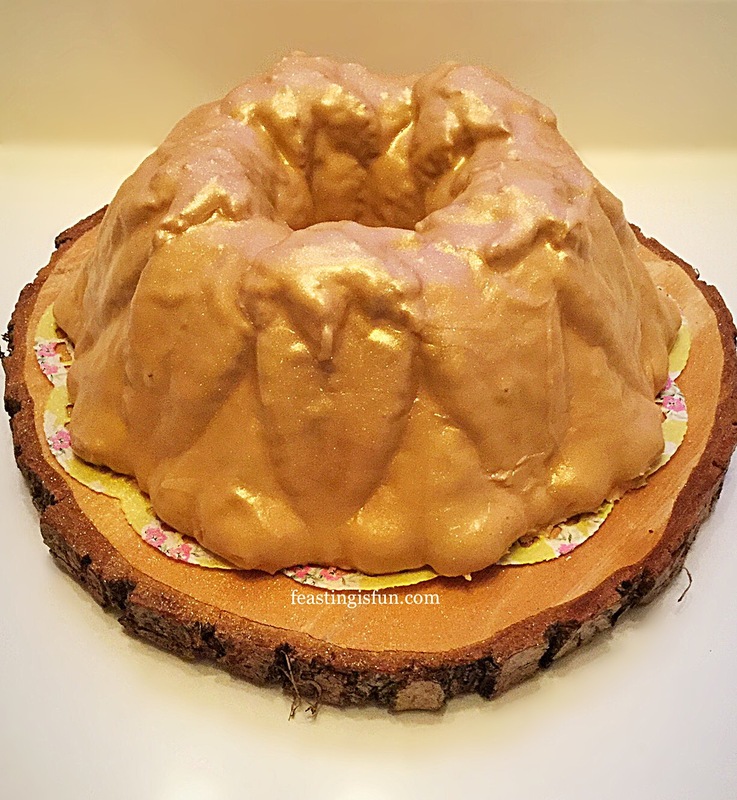 I have used the Chiffon Bundt Pan available from Nordicware. To ensure successful release of the cake from the pan cake release is highly recommended. This is available as a spray, or a liquid that is brushed on with a soft pastry brush. I recommend Wilton. First of all add butter, sugar and salt to a large bowl. 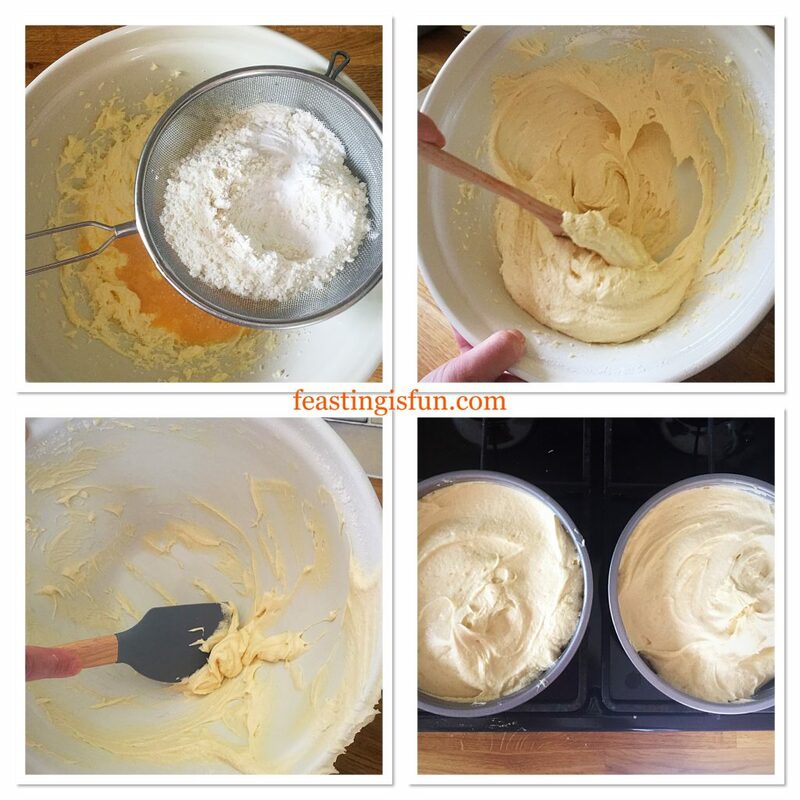 Whisk until the sugar is fully beaten into the butter. Next add both vanilla and almond extracts. Also add 5 eggs and milk. Now add ground almonds, cocoa powder, flour and baking powder. Whisk everything together until fully combined. Take care not to over whisk as the resulting cake will be tough. 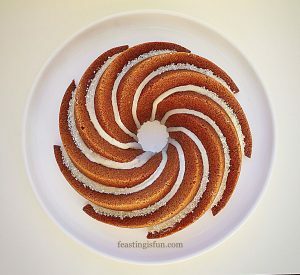 Prepare the Bundt pan, spraying, or brushing liberally with cake release. Spoon the prepared cake batter into the pan, pushing the mixture into the base to avoid air pockets. Finally, spoon half of tin of cherries on to the top of the cake batter, making sure that none of the liquid touches the side of the Bundt pan. 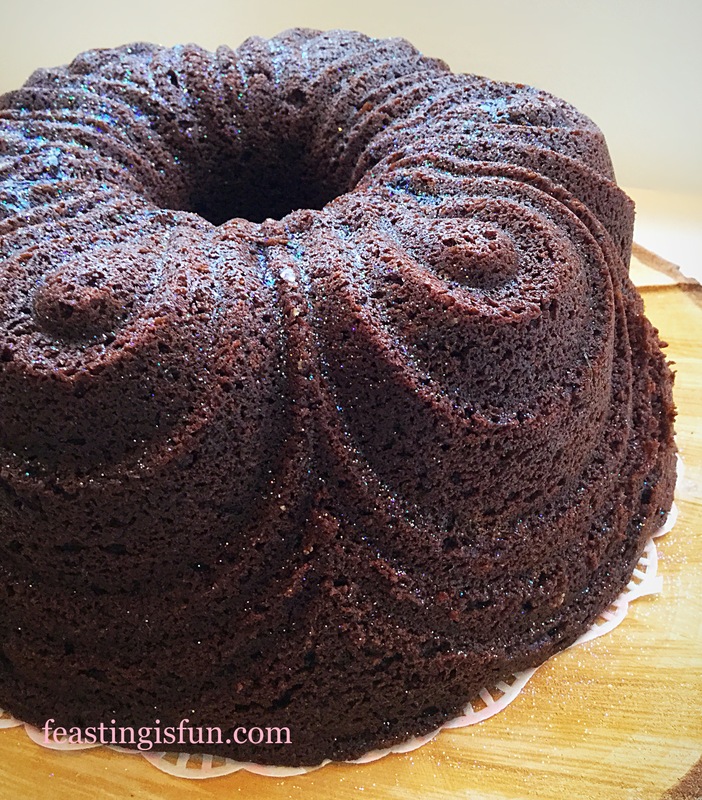 Place the Bundt pan into the lower middle part of a preheated oven and bake for 1 hour 20-30 minutes. Low, slow baking results in an evenly baked cake. The cake is baked when it feels firm to touch and an inserted skewer comes outs clean. Note: the cherries sink to the bottom (top when turned out) during baking. As soon as the cake is baked remove from the oven and place on a cooling rack. 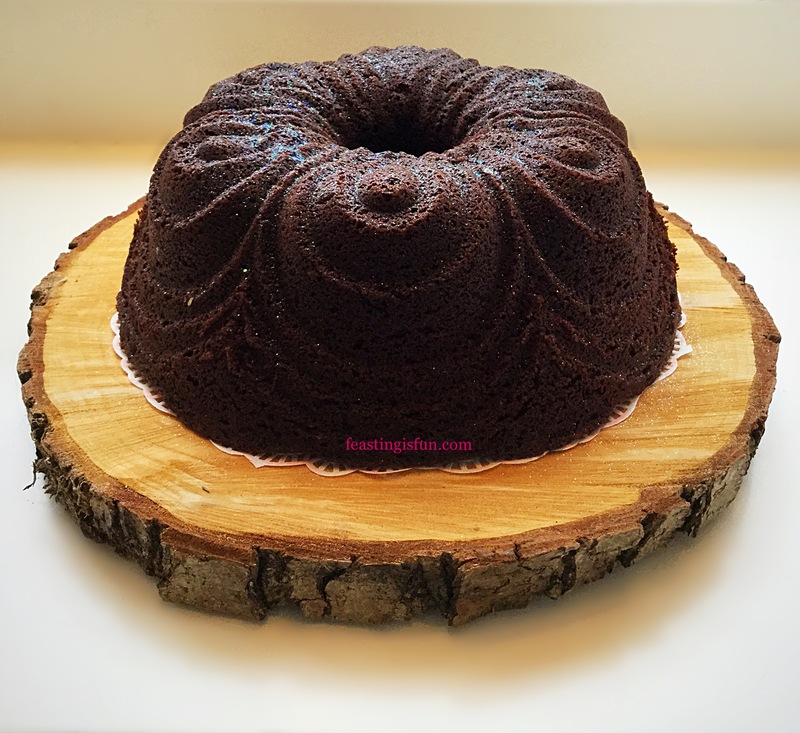 Making and baking the Chocolate Cherry Chiffon Bundt Cake. 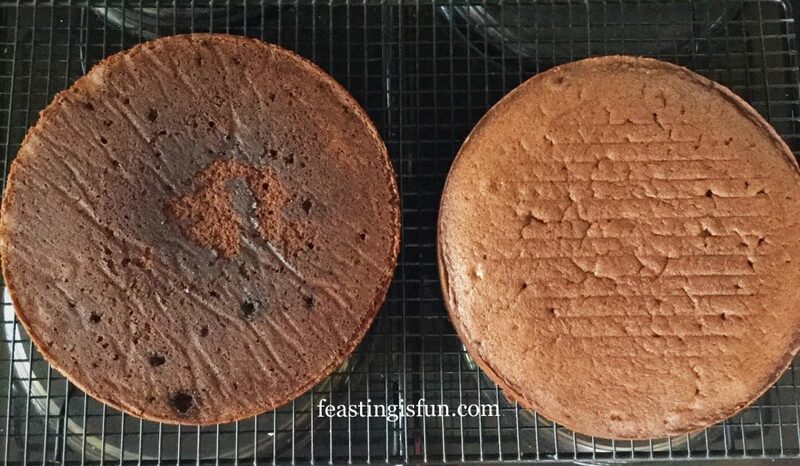 Allow the cake to cool for 10 minutes, then turn out on to a cooling rack. Turning out the baked Chocolate Cherry Chiffon Bundt Cake. 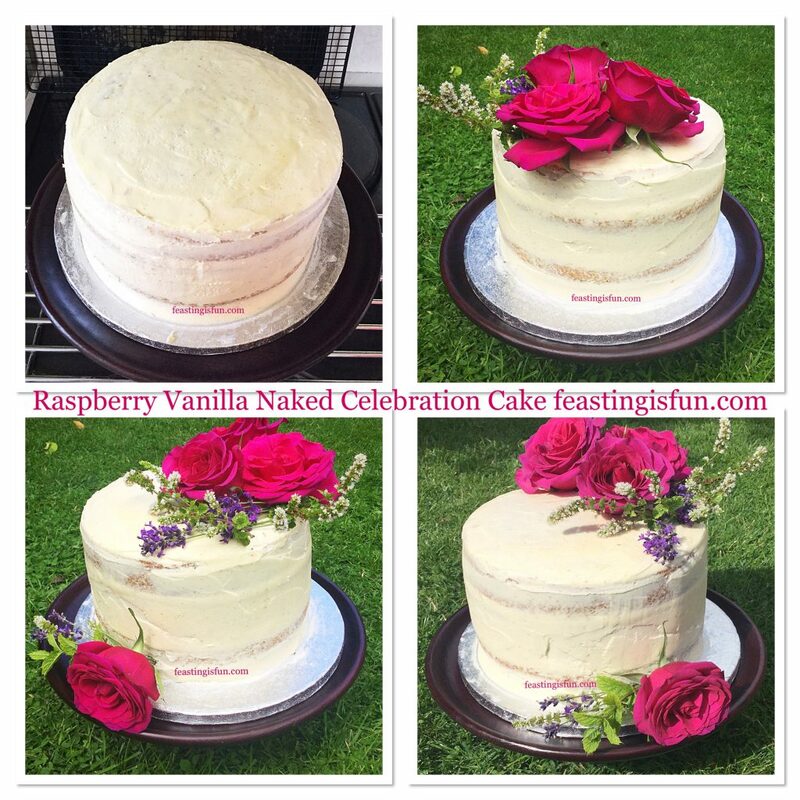 Finally when cooled, place the cake on to a board or stand. Using a teaspoon, carefully sprinkle with glitter from a height. Chocolate Cherry Chiffon Bundt Cake ready to serve. 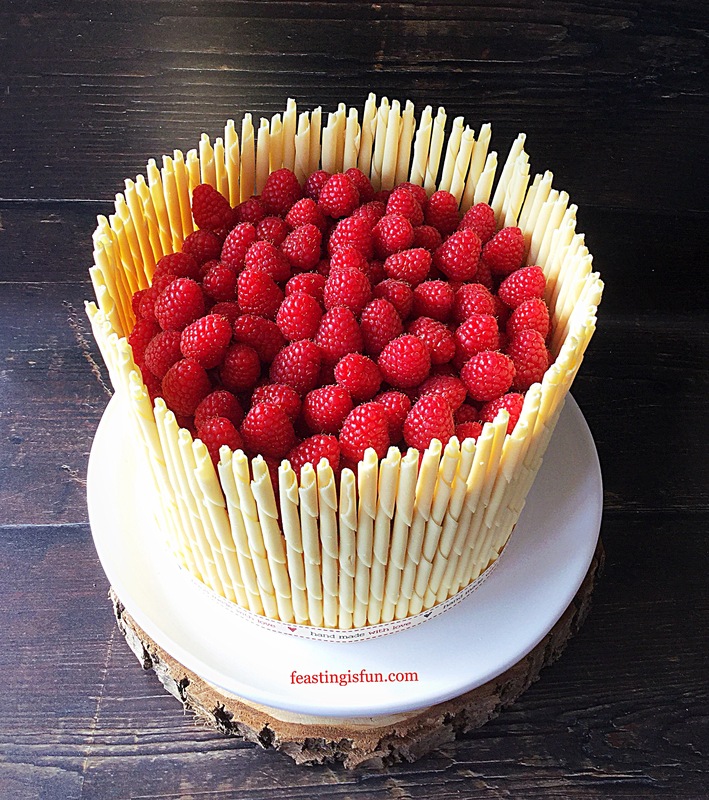 Since this cake is so elegant, it could be used for any celebration, such as Christmas. 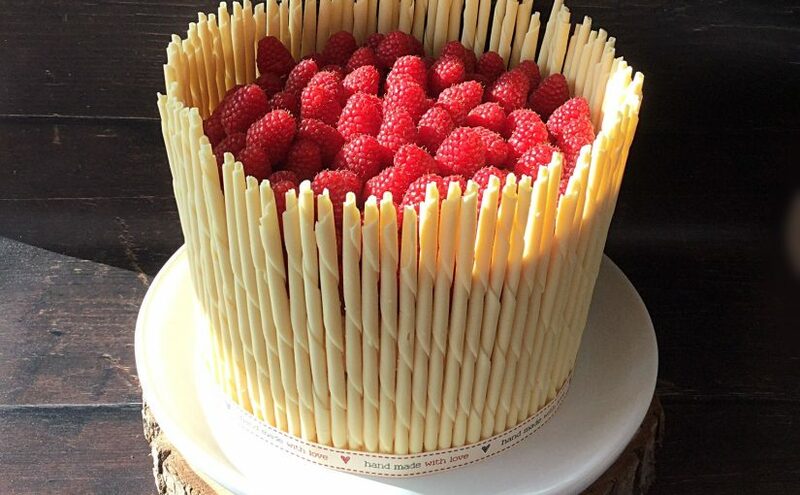 Alternatively, if someone you know has a birthday, this would be a delicious surprise. 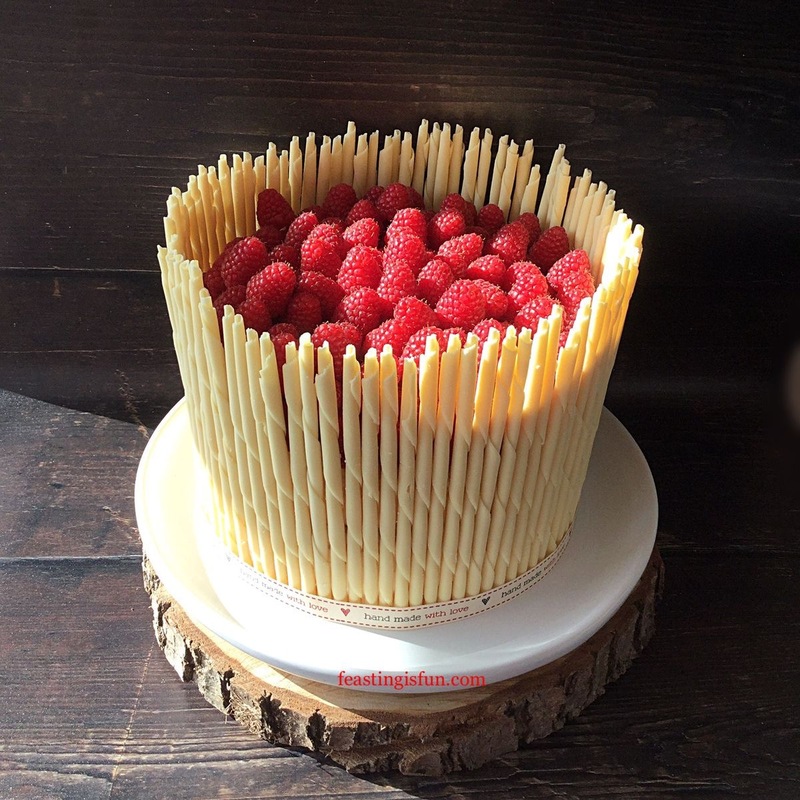 Adding candles would simply make the cake sparkle more. 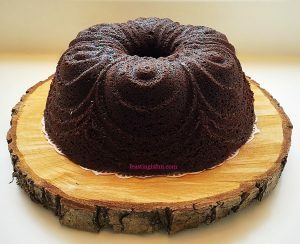 Chocolate Cherry Chiffon Bundt Cake. Serve sliced on a plate with a cake fork and a smile. Store in an airtight container and eat within 5 days. Keep refrigerated if the weather is particularly warm. 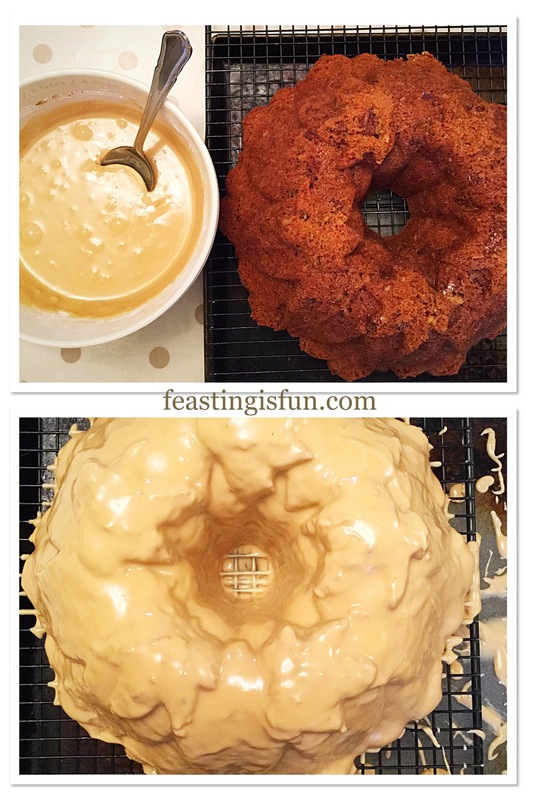 Maple Syrup Iced Coffee Bundt Cake. 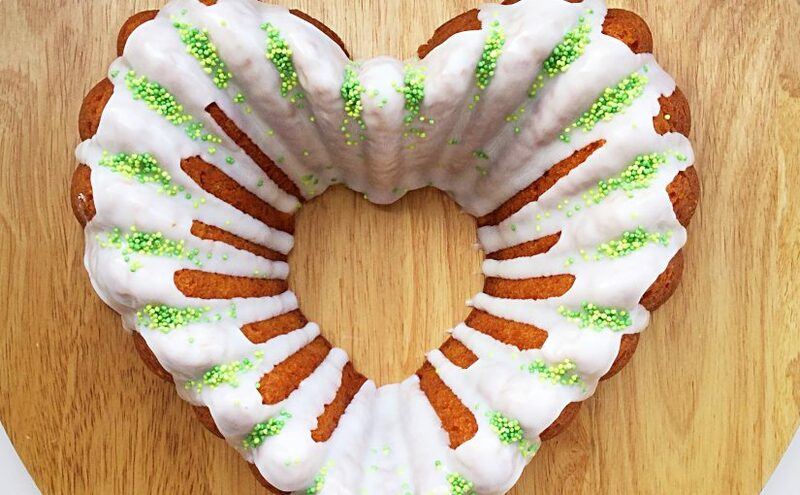 Lemon Lime Gin Heart Bundt Cake. Bundt pans are available in a variety of different shapes. 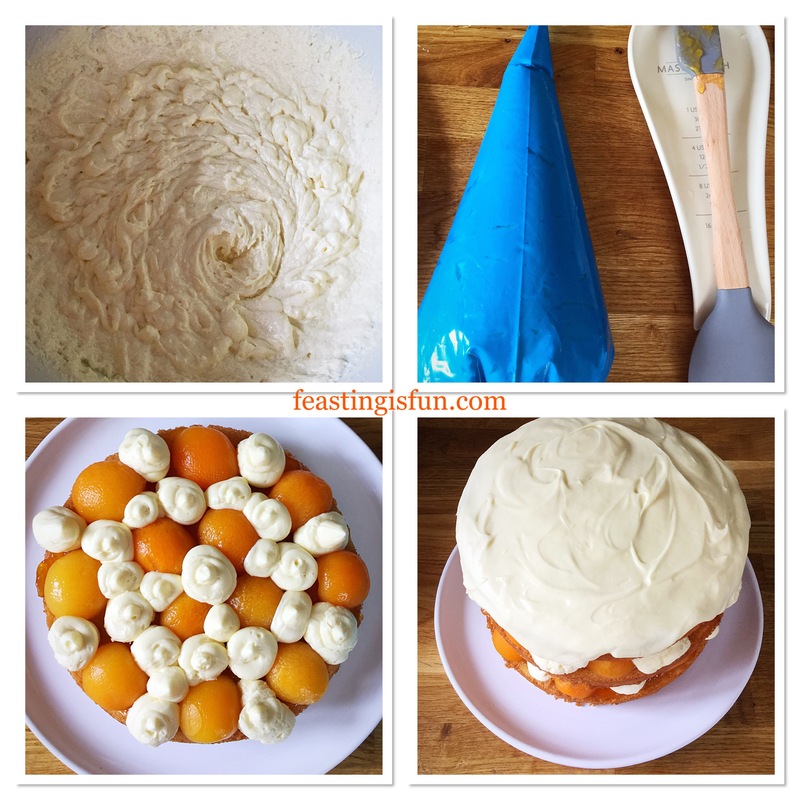 Creating a beautifully shaped cake without any extra effort required from the baker. While also allowing for creativity when decorating. 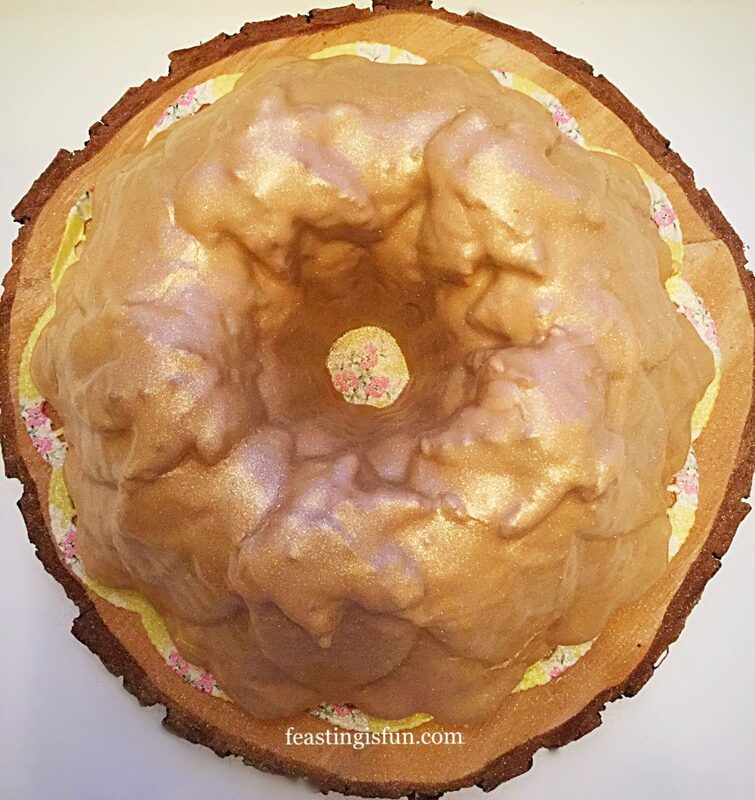 From a simple dusting of icing sugar or glitter, to more precise icing, accentuating the features of each Bundt cake. Resulting in an exceptional, celebration worthy, unique cake every time. No part of this post may be replicated or copied without the express written consent on the owner. Please see my Disclosure Policy. I love Bundt Pans. Their detailed and versatile shape, moulds cakes into edible replicas of the pan. Of course, if you are still at the beginners stage of cake decorating, the finished cake needs no more than a dusting of icing sugar. Since I have baked more than a few Bundt cakes, I have become more adventurous with how they are decorated. 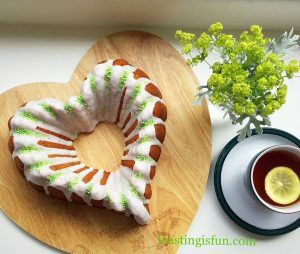 This Lemon Lime Gin Heart Bundt Cake is glazed carefully with a thick icing and finished with sprinkles. 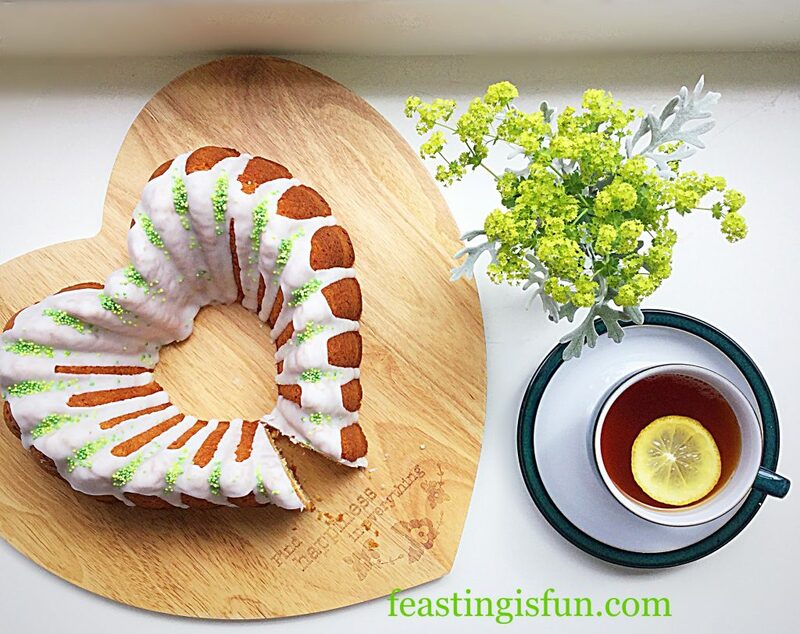 Lemon Lime Gin Heart Bundt Cake perfect with lemon tea. Bundt pans are available in all shapes and sizes. 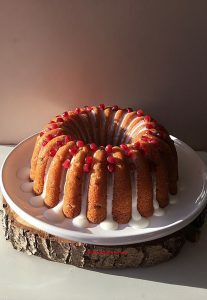 From small bundtlettes such as Mini Lemon Drizzzle Bundt Cakes to larger sized pans, such as Heart Engagement Bundt Cake. 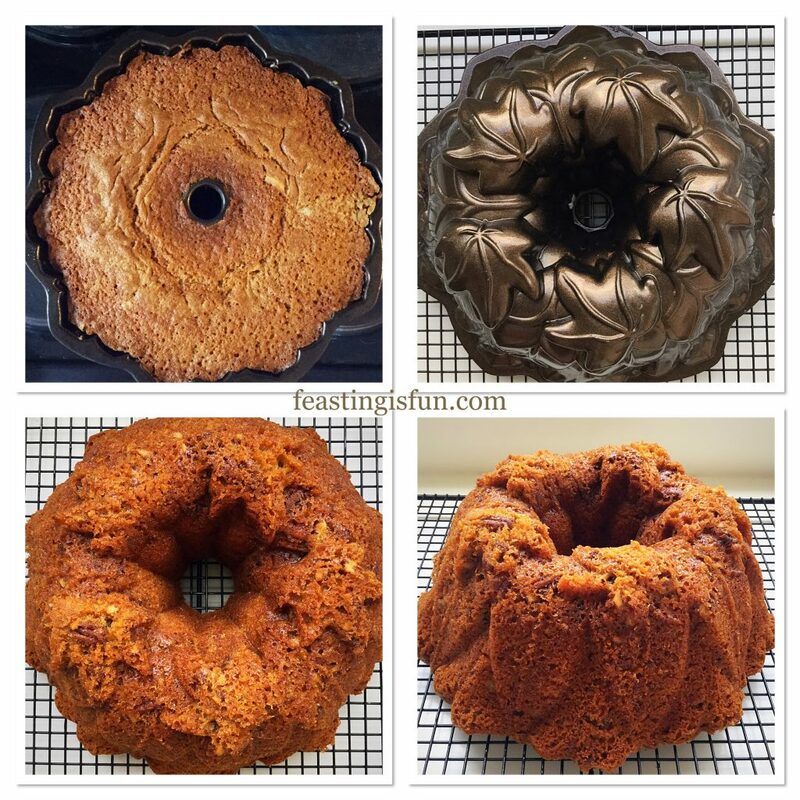 While solid pans are available, Bundts are generally recognised by the hole in the centre. 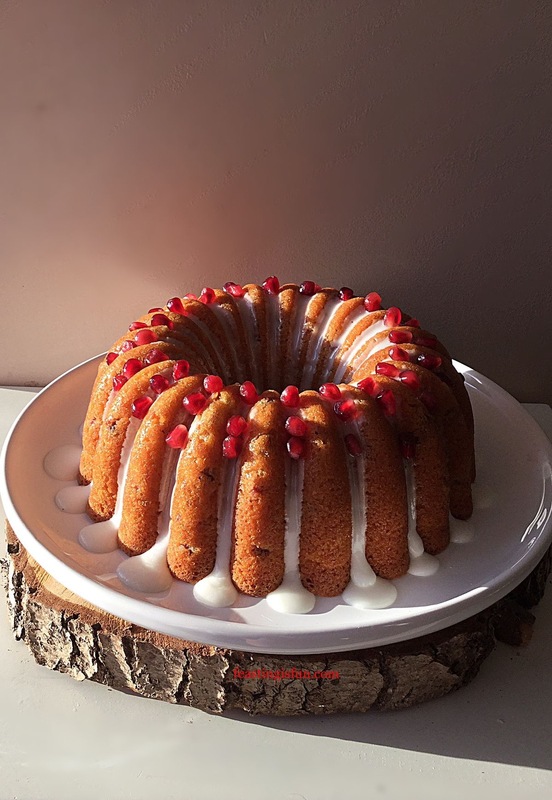 Here in the U.K Nordic Ware own the copyright to name Bundt tin/pan. 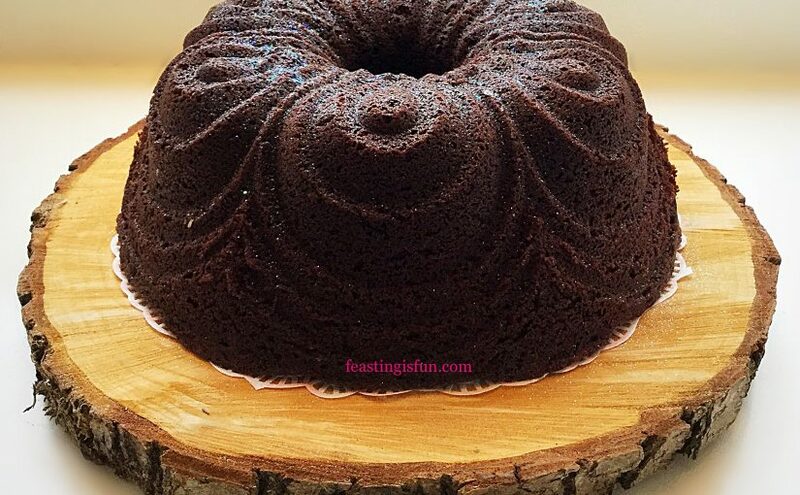 Therefore only cake’s baked in one of their pans can accurately and legally be called a Bundt cake. 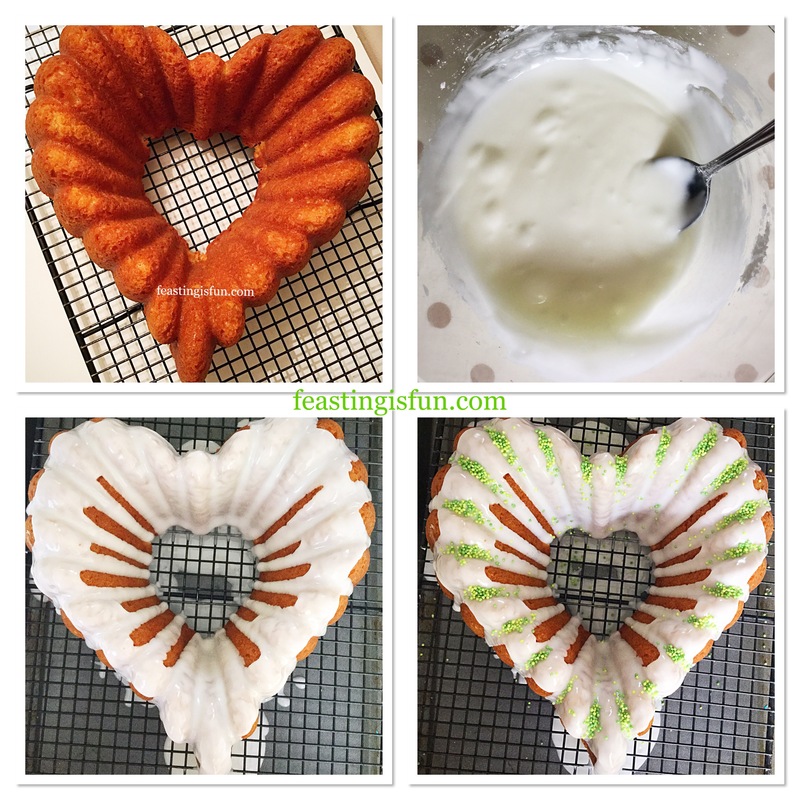 Lemon Lime Gin Heart Bundt Cake the icing emphasises the detail of the cake. 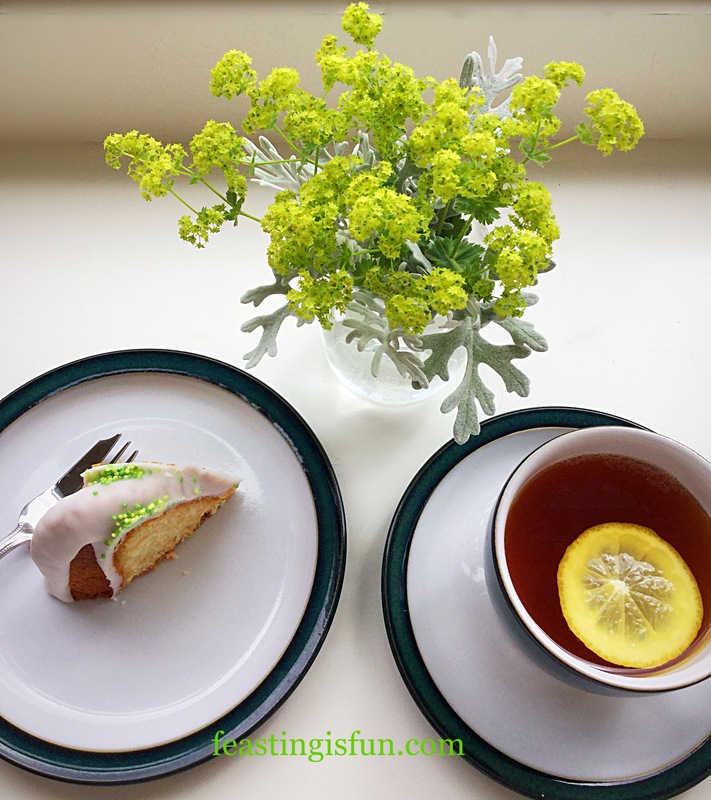 For this cake one whole lemon and lime are used in the recipe. 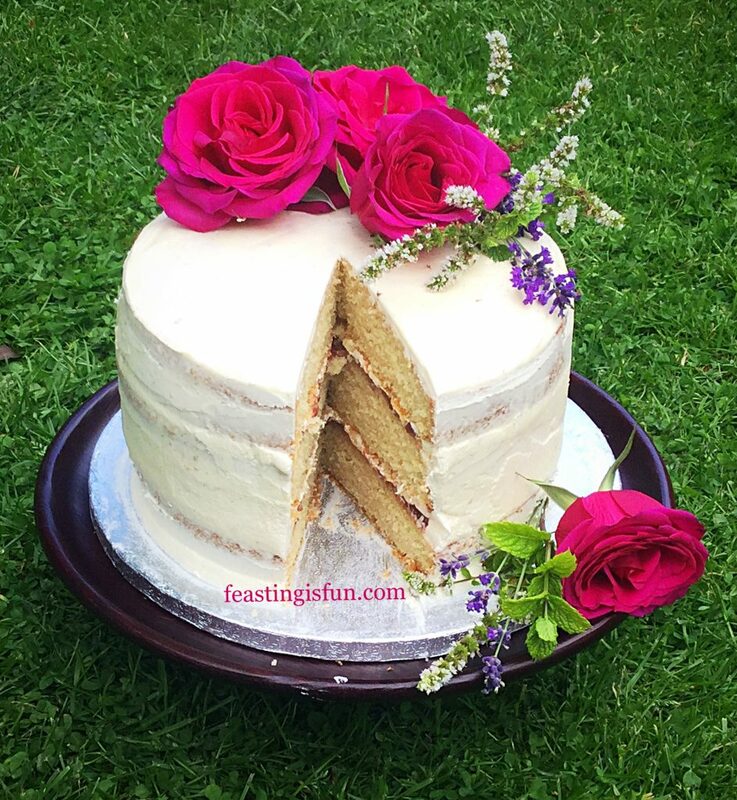 The fragrant zest adds flavour and balance to the gin baked in the cake. While thick, white icing, made using the juice of the zested fruits, provides a sharp, citrus tang. Finally, green and yellow sprinkles hint at the cake’s flavour. 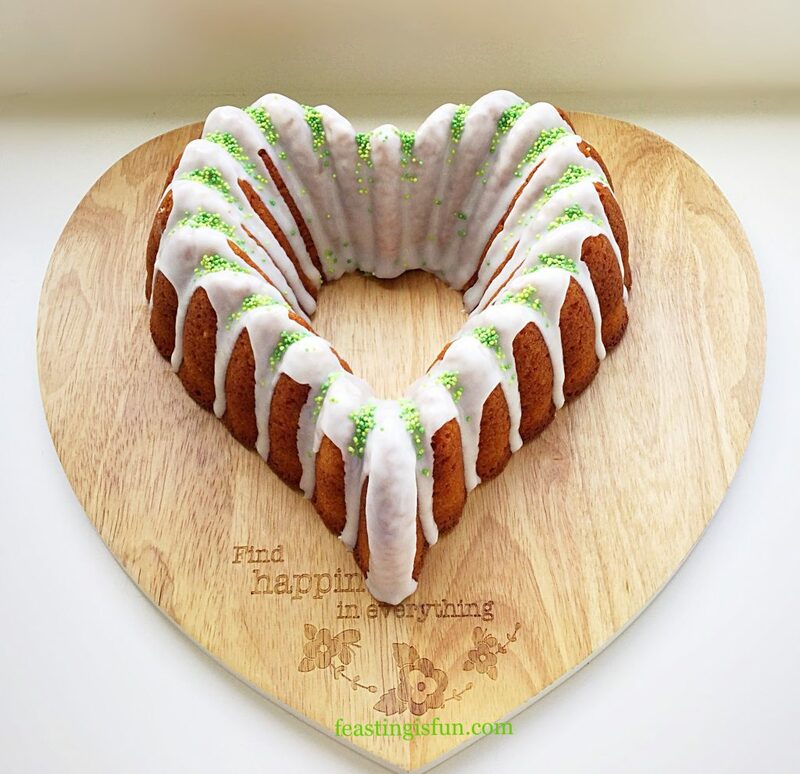 Lemon Lime Gin Heart Bundt Cake the perfect flavour combination. Tiger Gin has underlying orange citrus notes. 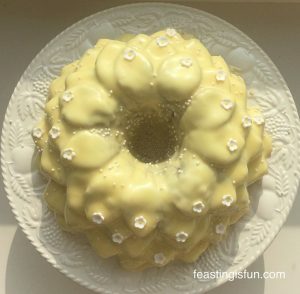 Incorporating this with the lemon and lime gives this cake a unique citrus flavour. Yet it is the botanicals added in the process of making this gin that really linger on the palette. If new, wash the Bundt Pan in hot soapy water. Do not use anything abrasive to clean it. Dry and prior to use spray with cake release. I use Wilton. ensuring the inside is completely covered. Into a large bowl add the butter, sugar and salt. Whisk until pale and creamy. Now add the eggs, yoghurt, gin and vanilla extract – wet ingredients. On top of the wet ingredients sieve the flour and then baking powder. Zest both the lime and lemon. Place the zest into the bowl. 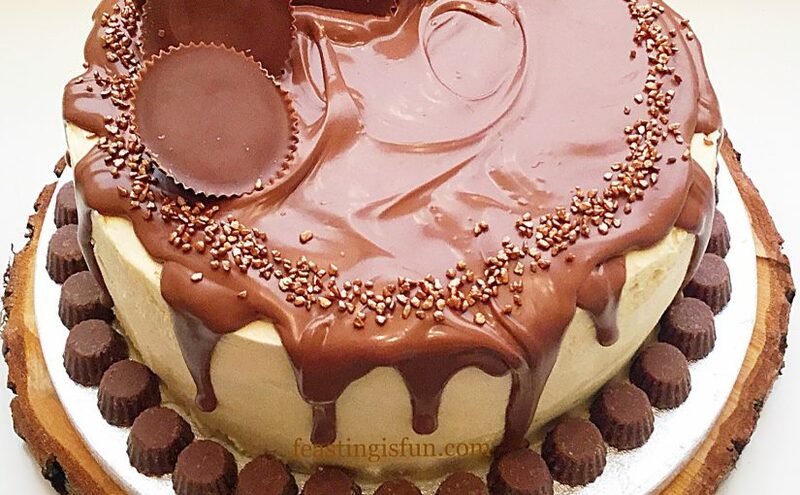 This cake uses the all-in-one method. Whisk slowly until all the ingredients are just combined. 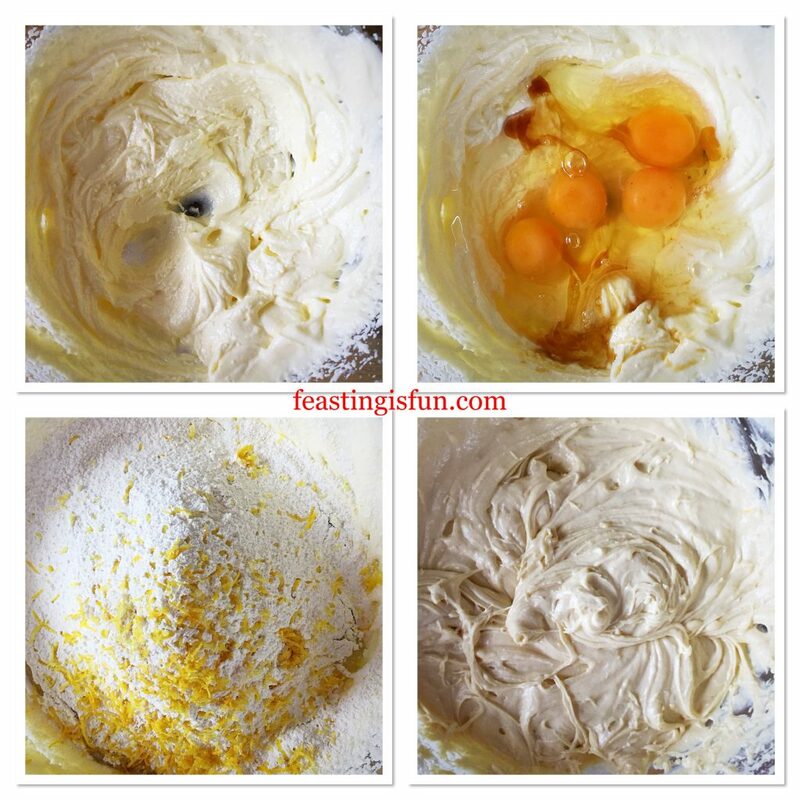 Give the mixture a final mix with a spoon before carefully pouring into the prepared Bundt Pan. 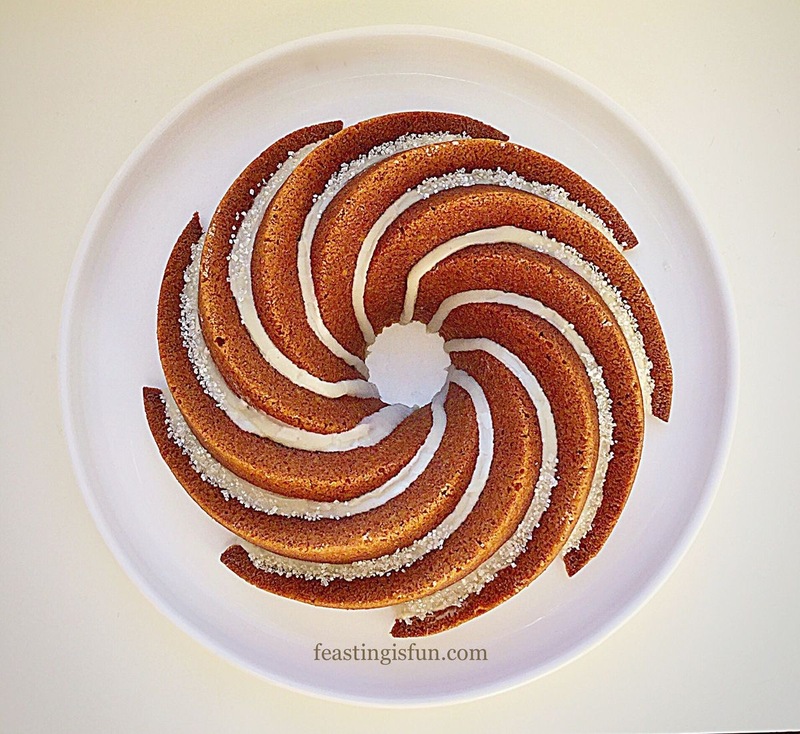 Place the Bundt into the centre of the oven and bake for 50-60 minutes. The cake is baked when it is golden and coming away from the sides of the pan. Also an inserted skewer will come out clean. Remove the cake from the oven and allow to cool for 10 minutes. 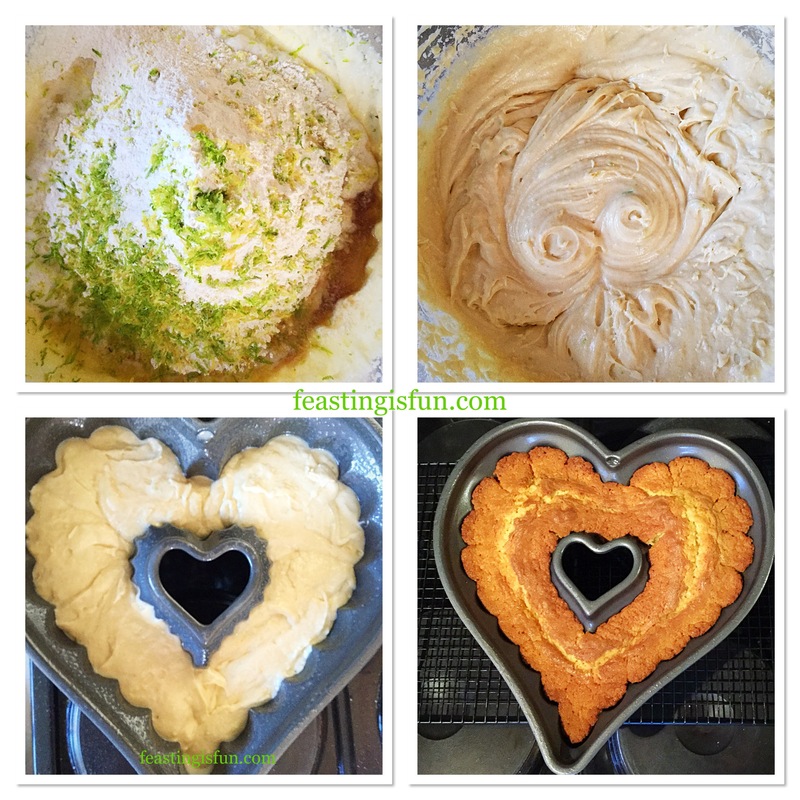 Preparing the cake batter, filling and baking the Lemon Lime Gin Heart Bundt Cake. After 10 minutes cooling in the tin, turn the cake out on to a cooling rack. Leave the cake to cool completely before decorating. While the cake is cooling prepare the icing. Next, if using gin in the icing add one tablespoon at first. Now add the juice of both the lemon and lime until it reaches a very thick, yet still drops from the spoon, consistency. As soon as the cake is cooled it can be decorated. Place the cooling rack over, with the cake on it, a larger baking tray. This will catch the drips from the icing. Spoon the icing over the top of the cake, encouraging it to drip down the sides of the cake. Continue to add icing in this way until each of the dips, in the heart pattern, have icing dripped on them. Take care to completely cover the inside of the heart indentation at the top and the outside of the heart point at the bottom – see photos. Carefully place sprinkles across the top of the heart. Again use the photograph for guidance. Allow the cake to set for 5 minutes. 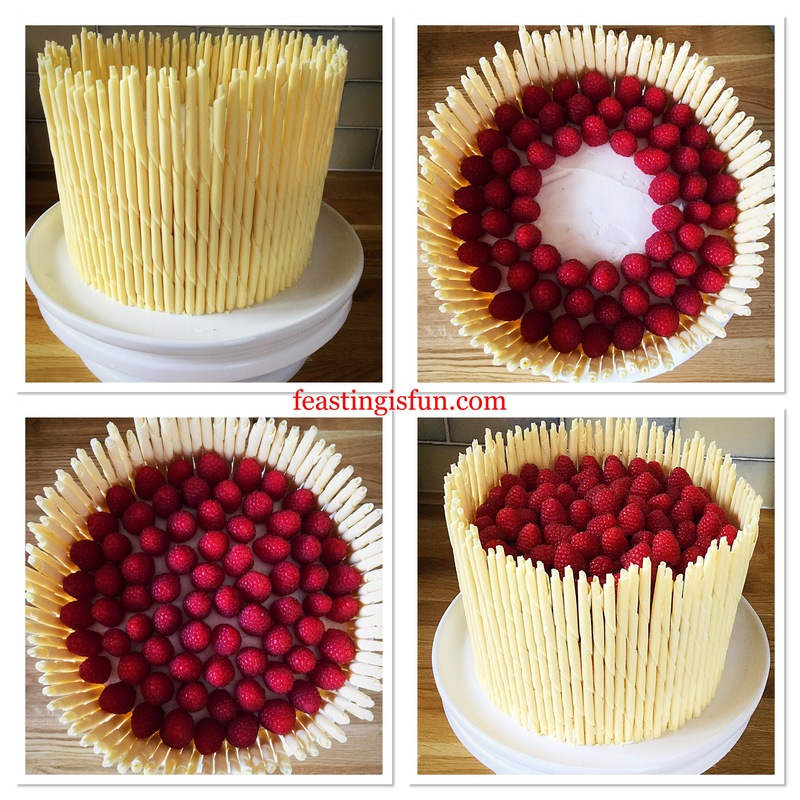 Step by step photos showing how to decorate the cake. 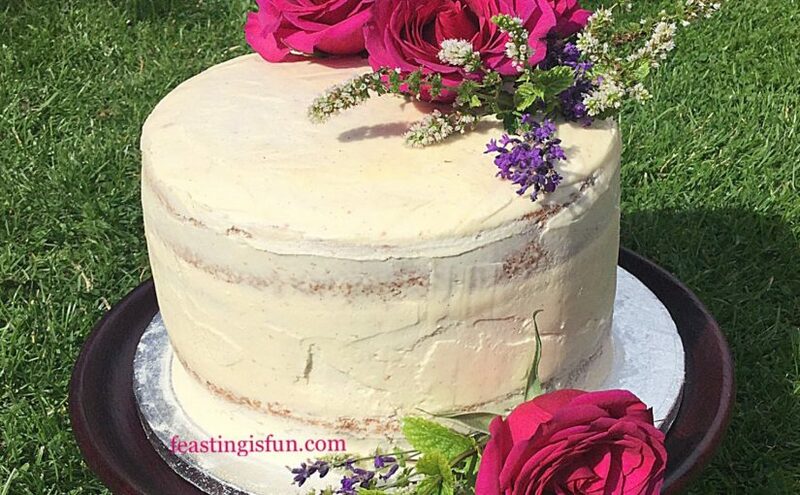 Gently run a palette knife under the cake, separating any icing that may be stuck to both cake and rack. Transfer the cake to a suitable plate or cake stand and leave to fully set. 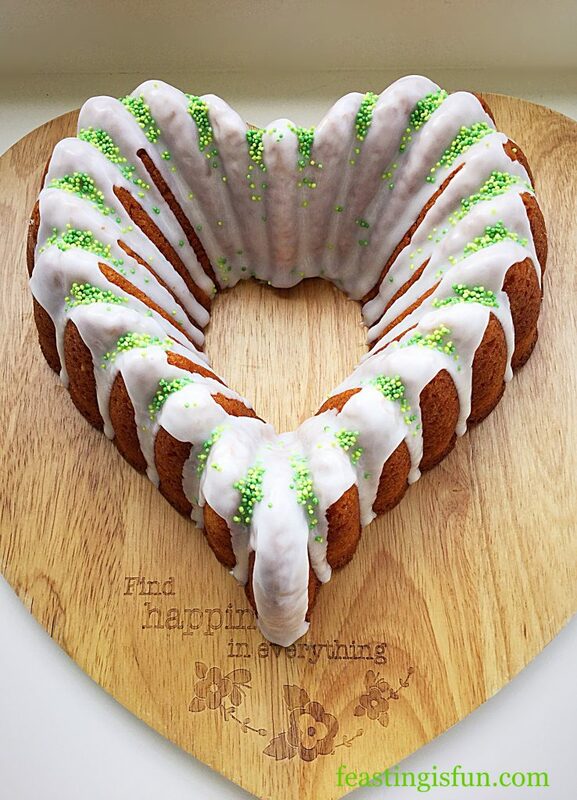 Lemon Lime Gin Heart Bundt Cake set and ready to serve. Served sliced with a delicious cup of lemon tea and of course a smile! A tasty, tangy slice of Lemon Lime Gin Heart Bundt Cake. 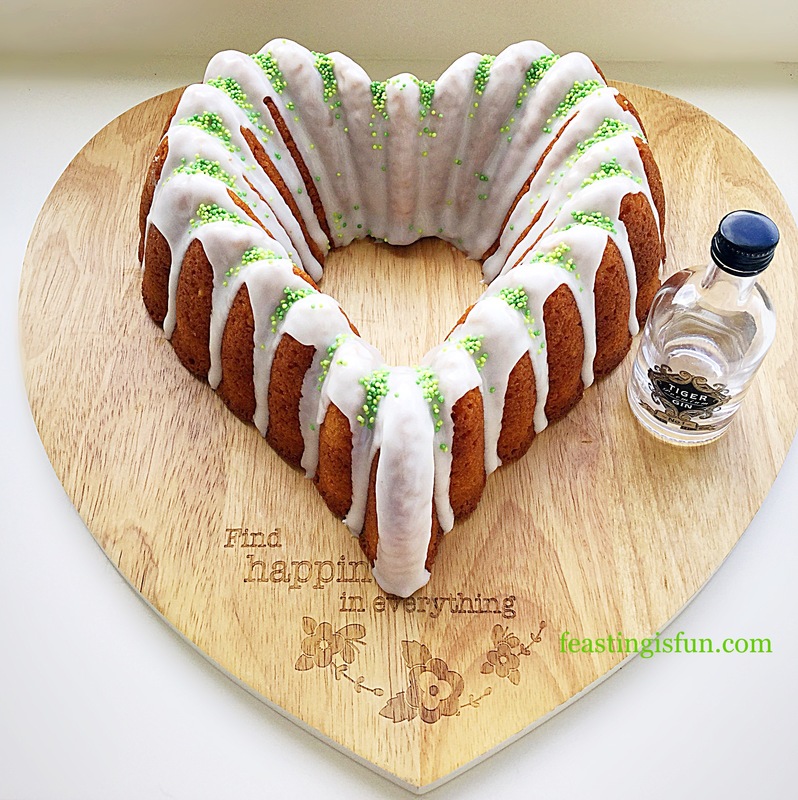 Lemon Lime Gin Heart Bundt Cake eat with your eyes first! This cake will keep for up to four days in an airtight container. The cake was made the evening prior to icing and stored wrapped in baking parchment. In my opinion the cake is better the day after it is made. Baking is fun. Especially when you gain a little experience and confidence. 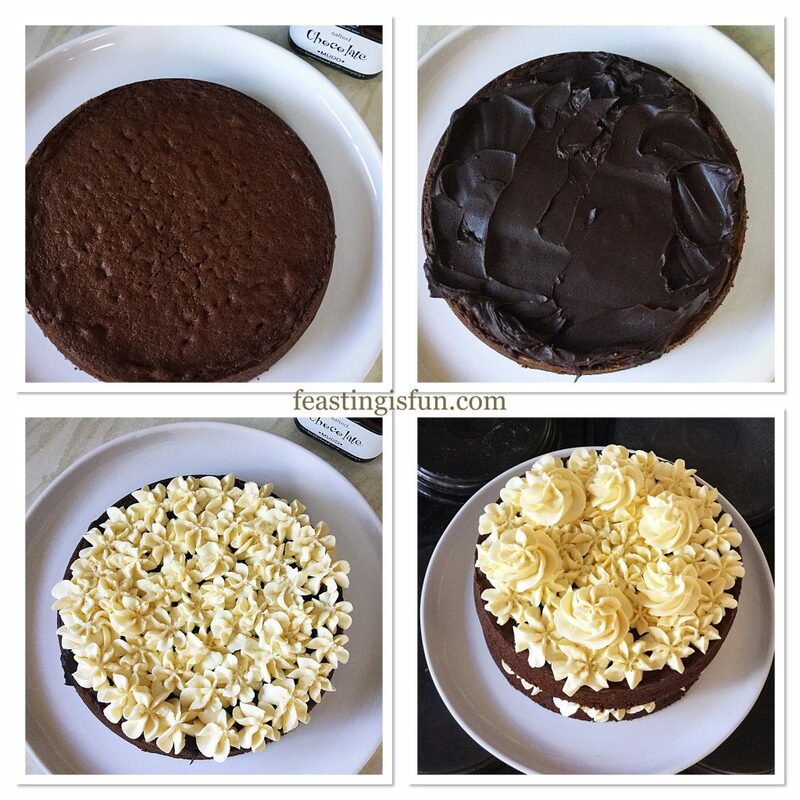 Mixing flavours, experimenting with different cake tins and Bundt Pans. Creating a feast that will surprise people. Making friends, family and neighbours smile. Almost half of this cake has now gone. Slices sent on paper plates, with a pretty napkin, to unsuspecting, yet thoroughly grateful neighbours, this afternoon. Sharing is so important at Feasting headquarters. Indeed we all believe that food tastes better when it is shared. No part of this post may be copied without my express, written permission. Please see my Disclosure Policy for details. 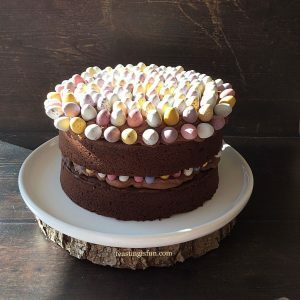 NOTE: If baking with alcohol, you must be at least 18 years old, here in the U.K.
Easter is nearly upon us. Shops are filled with fluffy bunnies, chocolate chicks and all manner of chocolate eggs. While surveying the vast selection, I found Galaxy Chocolate Golden Mini Eggs. 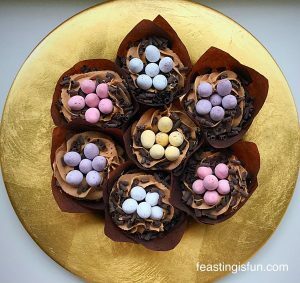 Utterly perfect for decorating an Easter celebration cake. 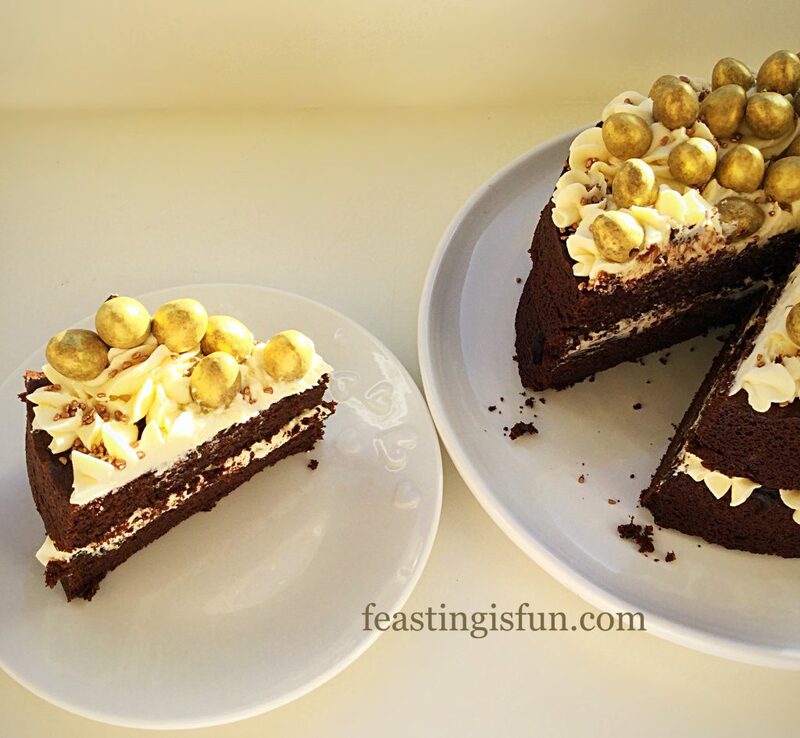 Especially my Golden Egg Chocolate Sponge Cake. As the prophecies had foretold, Jesus Christ, Son of the Living God, had risen from the dead. He had overcome death. Forever. So that we, may have life, in Him. Hence the chicks and eggs, bunnies and lambs in the shops, represent new life. Gold, for me on this cake, represents the King of Kings and Lord of Lords. Jesus. He who could not be contained by death. Even though He was brutally punished and died wearing a crown made from thorns. Is now alive, bearing the scars of death, yet as alive as you and I. Please see Important Stuff. While celebrating over Easter, take a moment, to think about what it means to you. As you make and bake this cake, remember the love, His love, that He offers you. Even now, as Easter is treated as an extra holiday. Consider the real truth behind it. With Jesus their is always hope, without Him, who do you place your hope in? 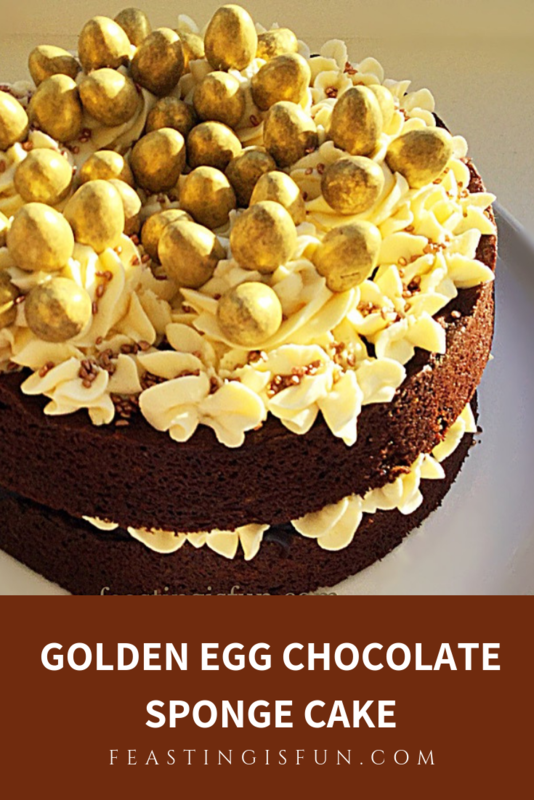 Golden Egg Chocolate Sponge Cake what does Easter mean to you? Grease 2 x 20cm/8″ sandwich tins with butter. Line the base of each tin with baking parchment. First of all, place a sieve over a bowl. Then sieve the flour, baking powder and cocoa powder into the bowl. Set the bowl to one side. Dry ingredients. Next, place the eggs and buttermilk into a jug. Whisk lightly using a fork. Wet ingredients. Place the butter, brown butter and salt into a large bowl. Beat until well combined and free from lumps. Next add the vanilla extract. Continue to beat until incorporated. Take the jug of wet ingredients and pour on to the butter mixture. Then add the sifted dry ingredients. Beat the ingredients in the bowl gently, scraping down the sides of the bowl halfway through. Continue to beat the ingredients until fully combined. 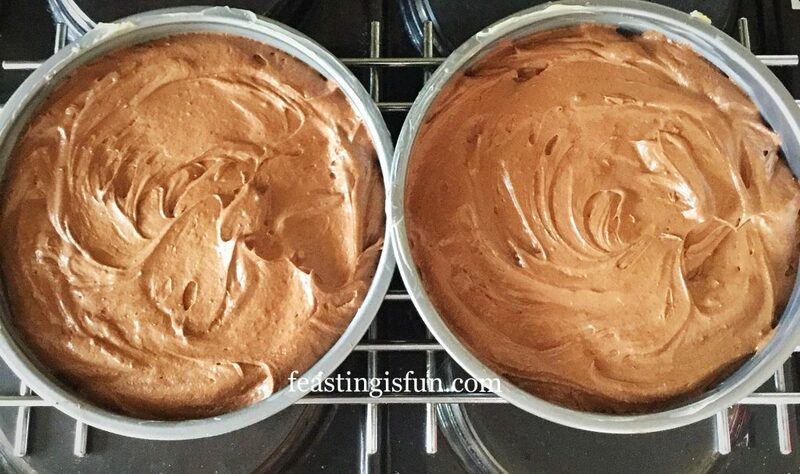 Divide the chocolate sponge batter equally between the two prepared cake tins. 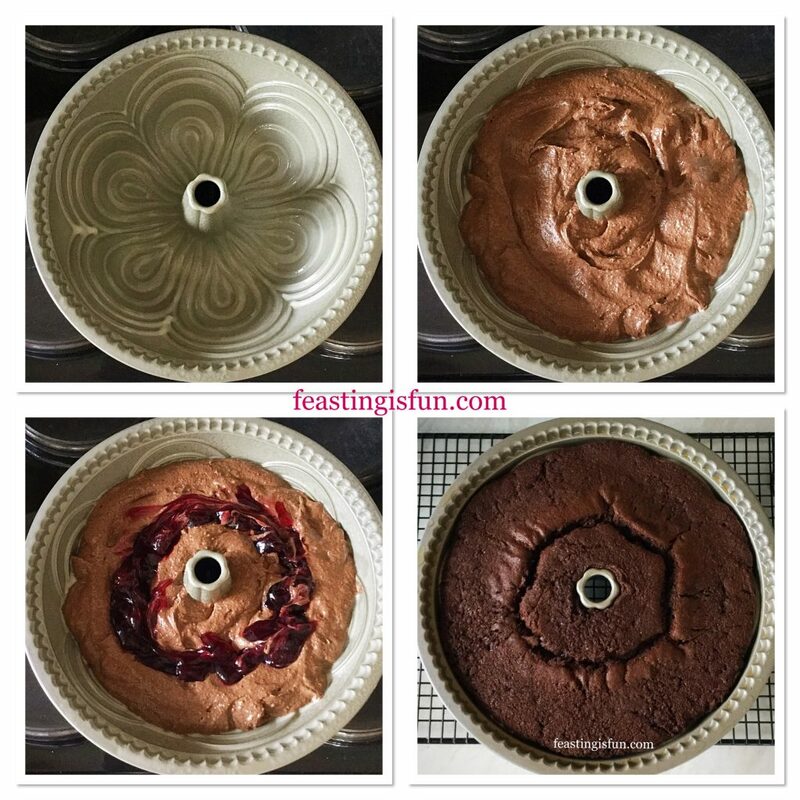 Place the cake tins into the centre of the preheated oven and bake for 40-50 minutes. 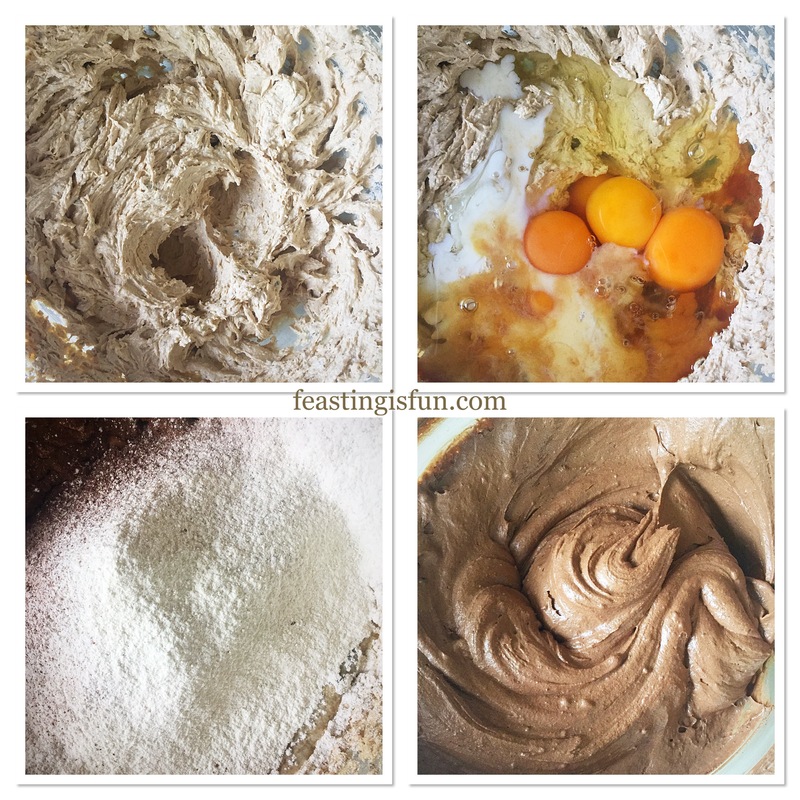 Making and baking the chocolate sponge cakes. 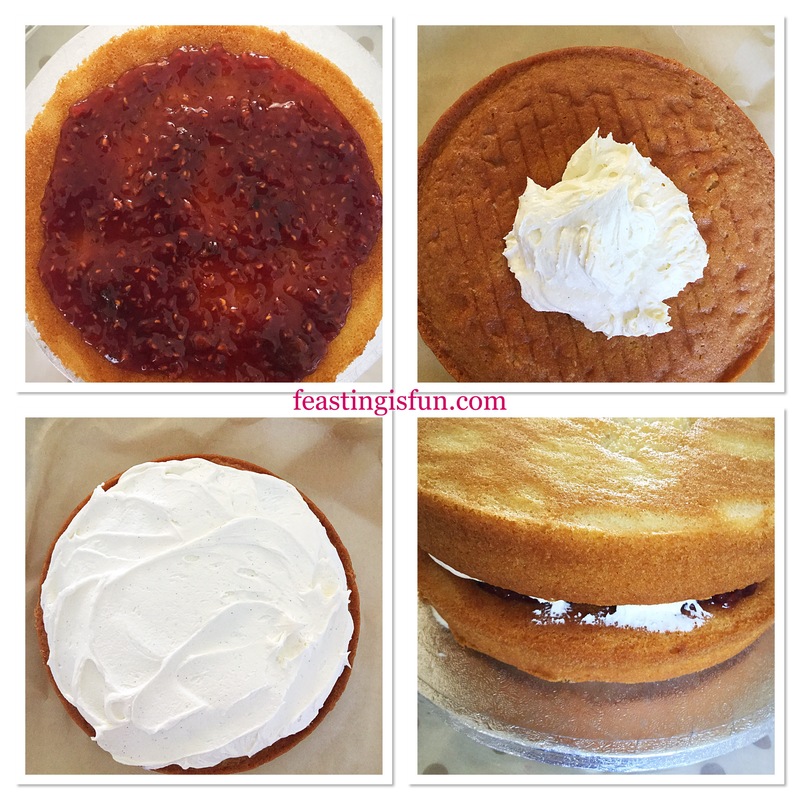 The cakes are baked when they spring back from a light touch and a cake tester comes out clean. As soon as the cakes are baked remove them from the oven. Allow the cakes to cool in the tin for 20 minutes and then tip them out on to a cooling rack. Once cooled carefully remove the baking parchment from the base of each cake. While the cakes are cooling the buttercream frosting can be made. Place the butter into a large bowl, or the bowl of a free standing mixer with paddle attachment. Next add 1 teaspoon of vanilla extract. Now whisk or beat the butter until it is softer and pale. Add all of the icing sugar to the bowl and 2 tablespoons of very hot water. Start mixing very slowly and then as the butter and icing sugar start to combine increase the mixing speed. Continue until the frosting is light and fluffy. Fit a large icing bag with a large closed star, or drop flower piping nozzle. I have a Wilton #2D piping nozzle. Fill the piping bag with the whipped buttercream. Place the bottom of the cake on to a plate. 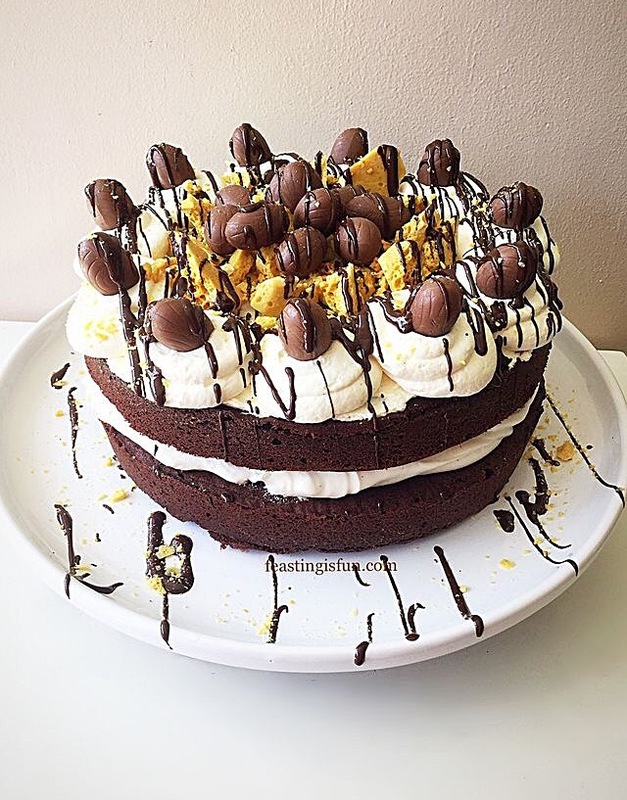 Spread the Salted Chocolate Spread over the cake. Follow by piping the buttercream so that it covers the spread. Start at the outside edge of the cake, piping in circles until the centre is reached. Place the top of the cake evenly on to the bottom. Filling and frosting the cake. Pipe buttercream on to the top of the cake, in the same way the base was covered. And then pipe 6 swirls, slightly set in from the edge of the cake. See the photograph below. 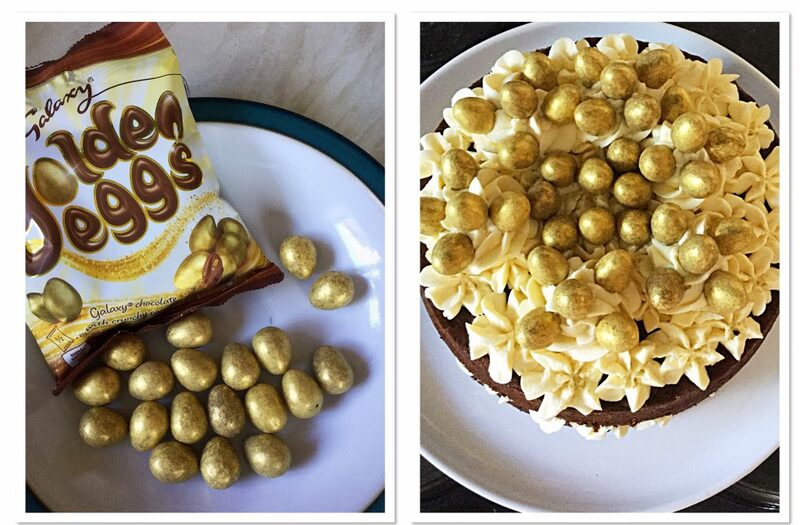 Golden Egg Chocolate Sponge Cake fully decorated. 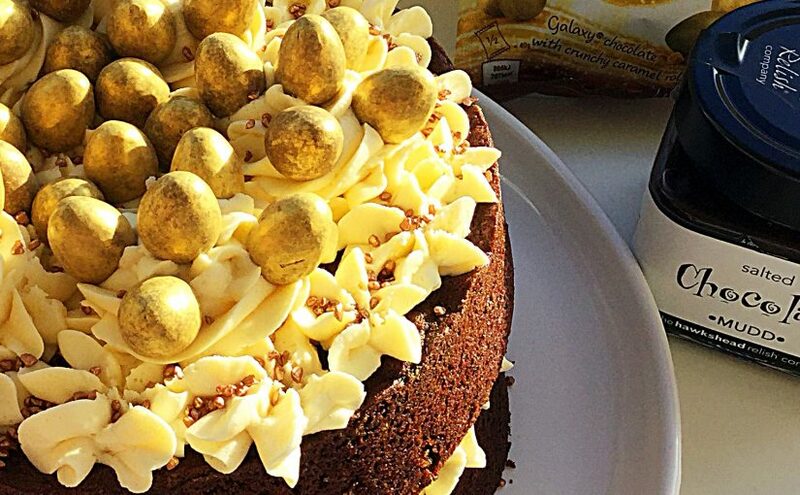 Decorate the top of the cake with the mini golden eggs. Finally the cake is ready to be served. Serve with a smile to friends and family. Alternatively gift the cake to someone special. This cake will keep in an airtight container for up to 5 days. Refrigerate is the weather is hot. 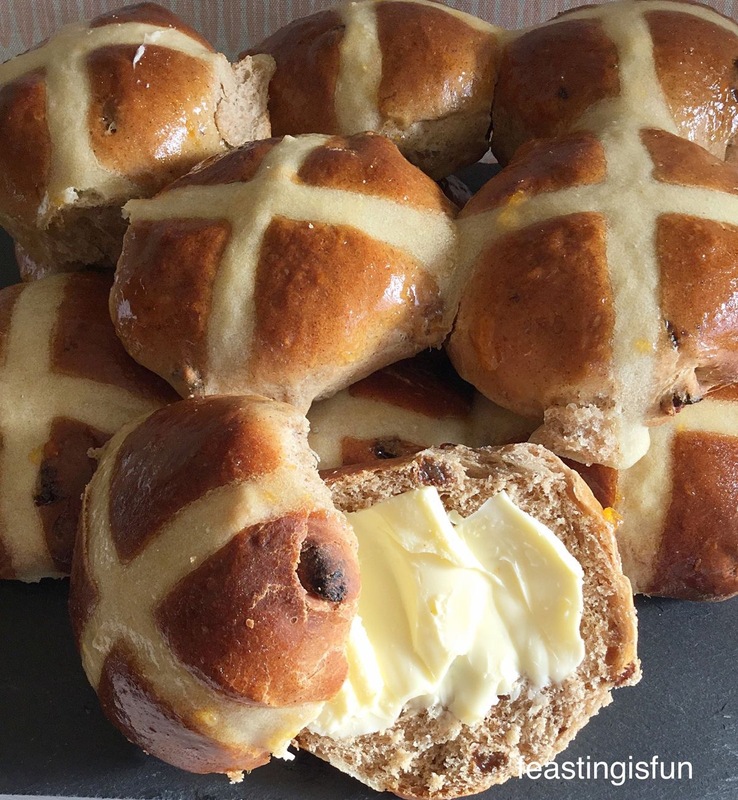 Hot Cross Buns easy and delicious to make at home. While celebrating Easter is especially important to me, having a real, everyday relationship with Jesus is more important. Rather than dealing with life on my own, He is always there. Because of what He endured on the cross and in His life, Jesus understands. So as well as being my Saviour, He is also my friend. 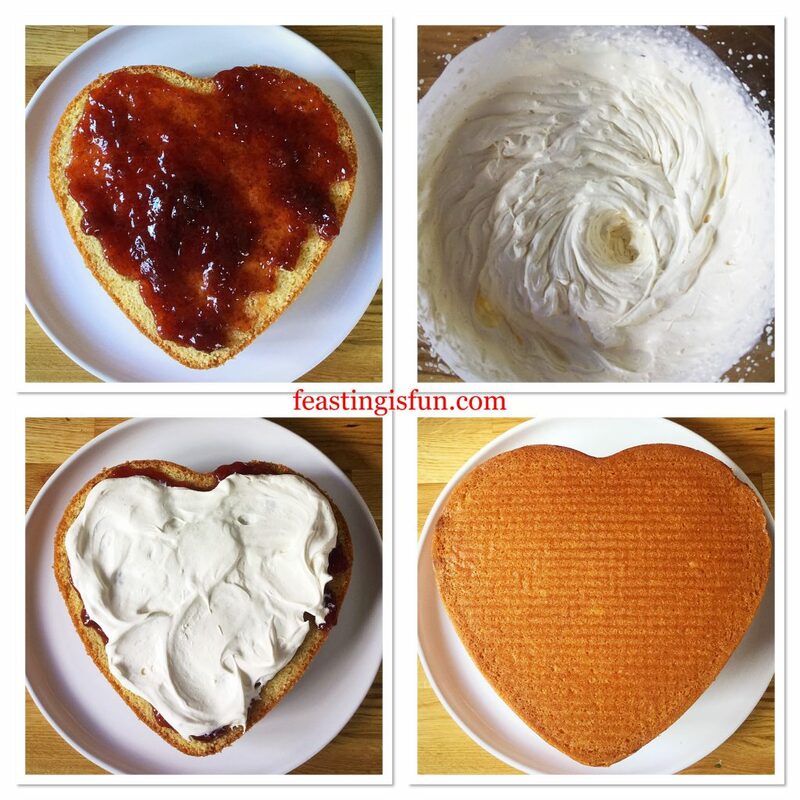 Have fun making, baking and creating you feast. Hawkshead Relish supplied me with a complimentary jar of Salted Chocolate Spread. This is not a sponsored post. All views, opinions, content including photographs are my own. The entire content of this post is covered by Copyright and I.P. laws. Please see my Disclosure Policy.